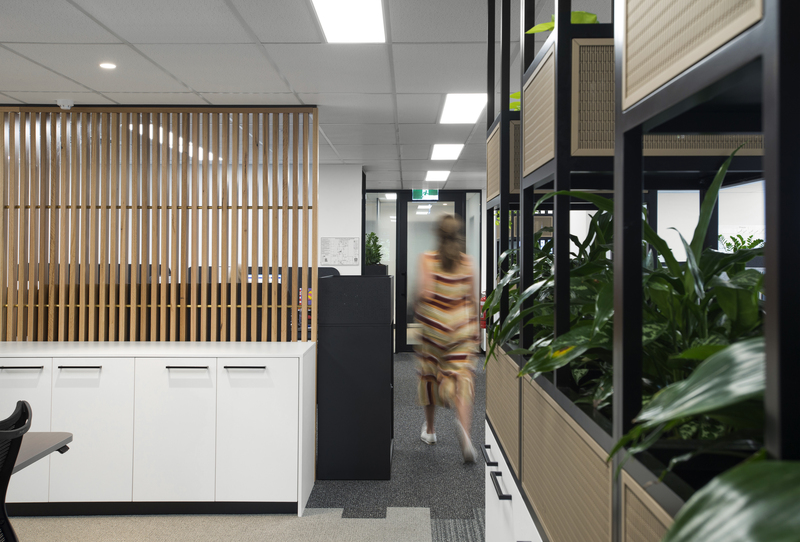 How might we create workplaces that can also improve health and wellbeing, enhance organisational culture and increase operational performance? 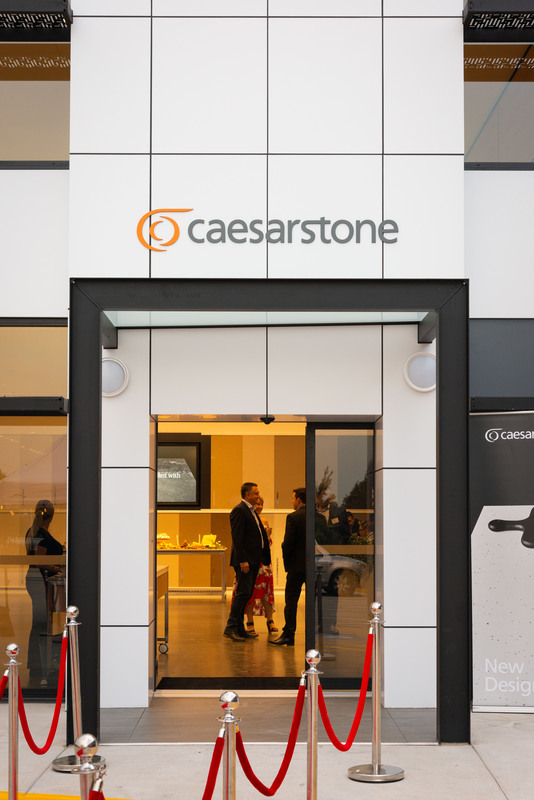 The new home for the Caesarstone showroom needed to shine – morning, noon and night. 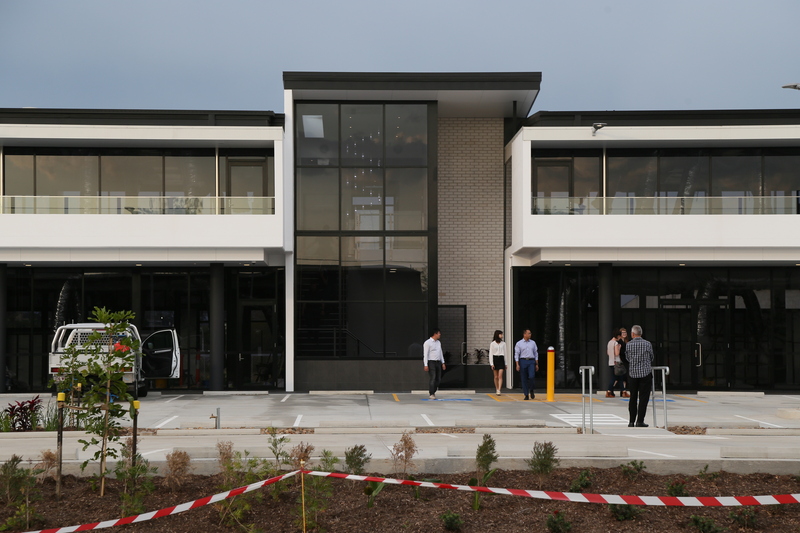 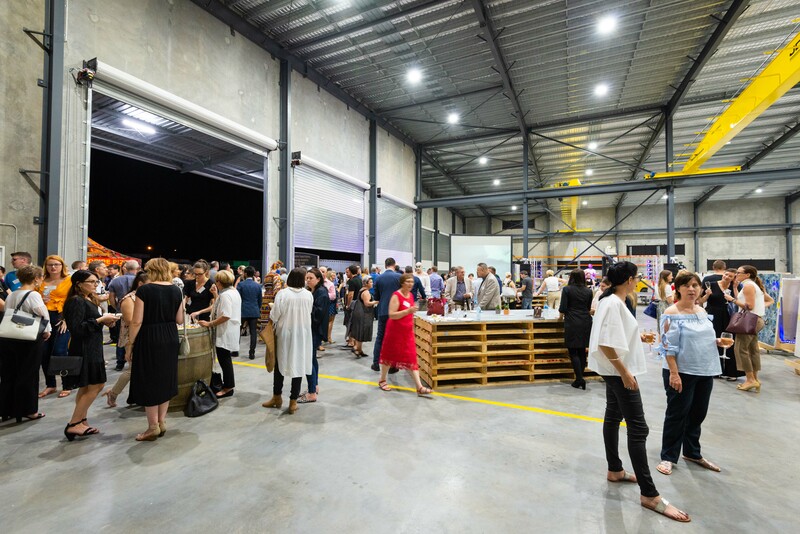 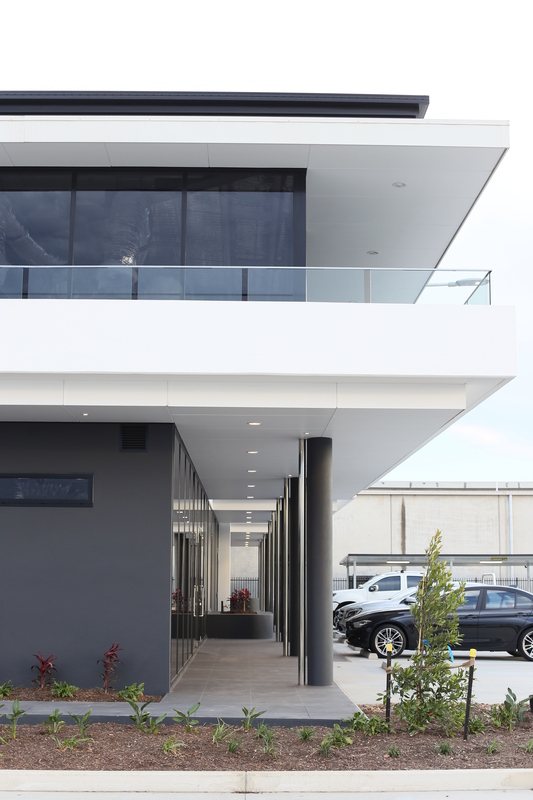 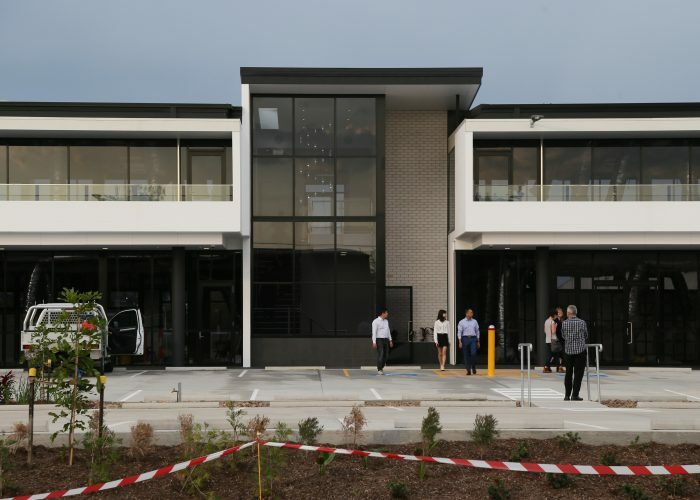 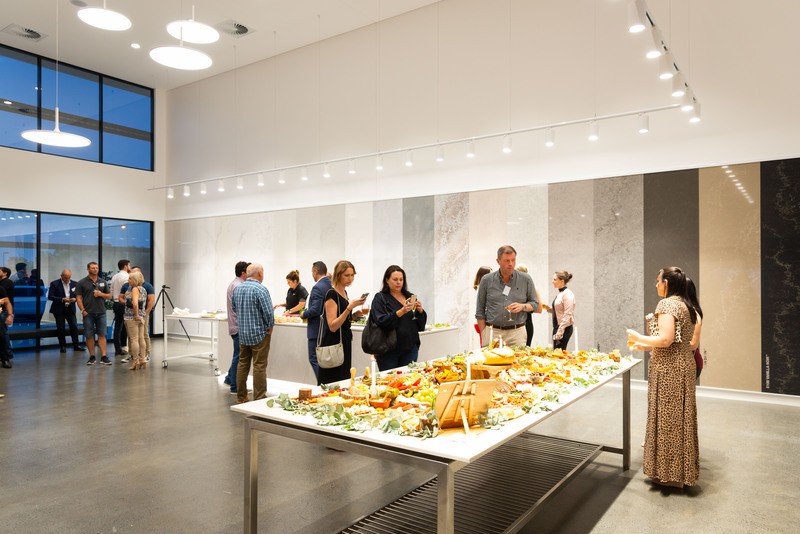 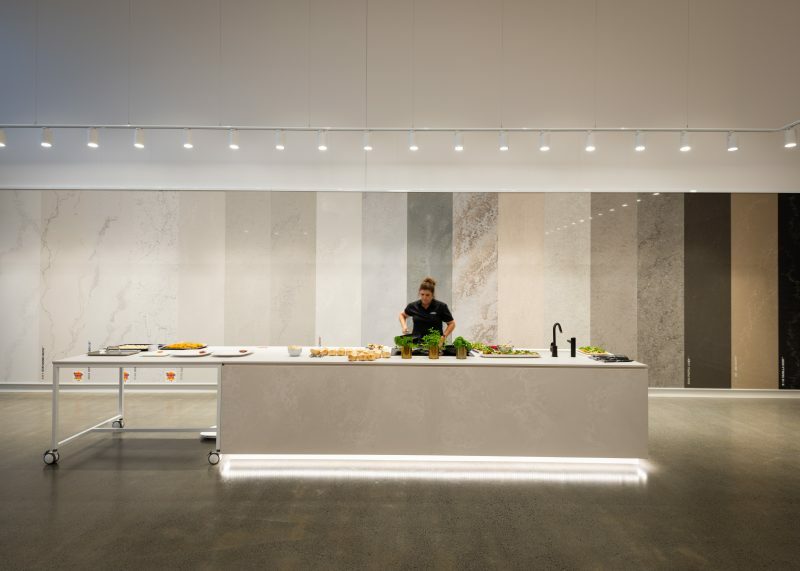 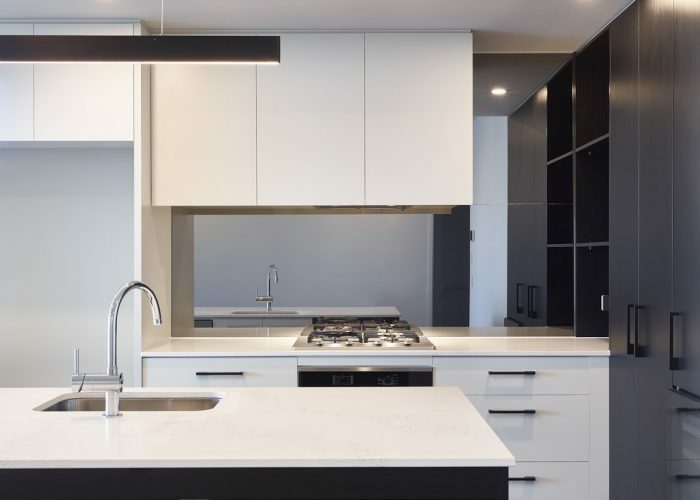 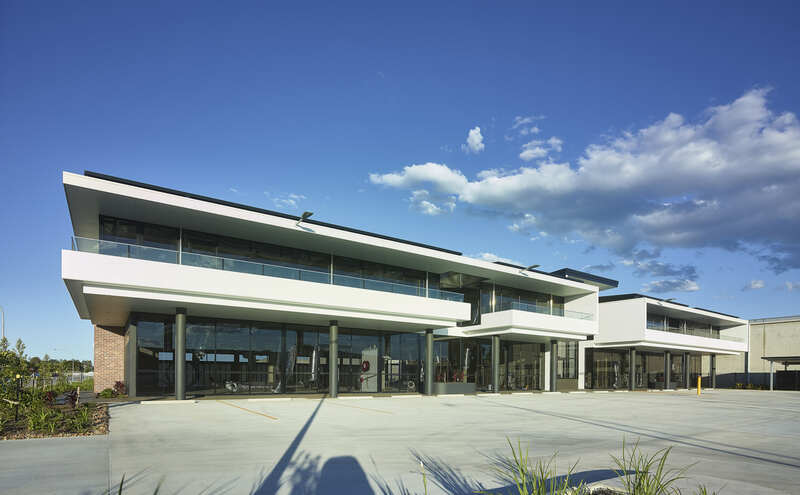 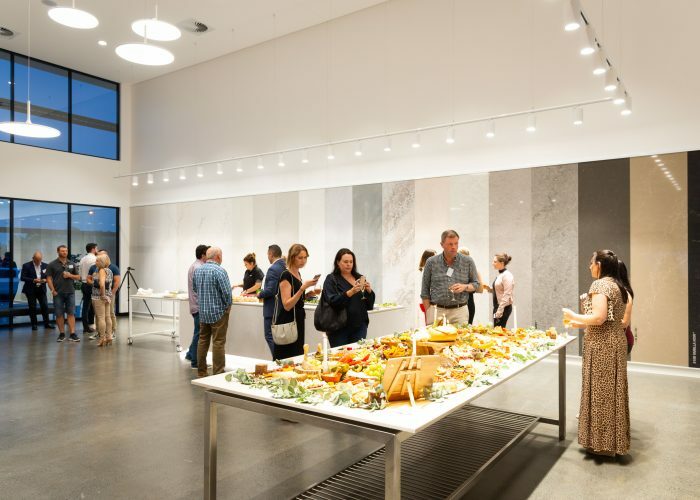 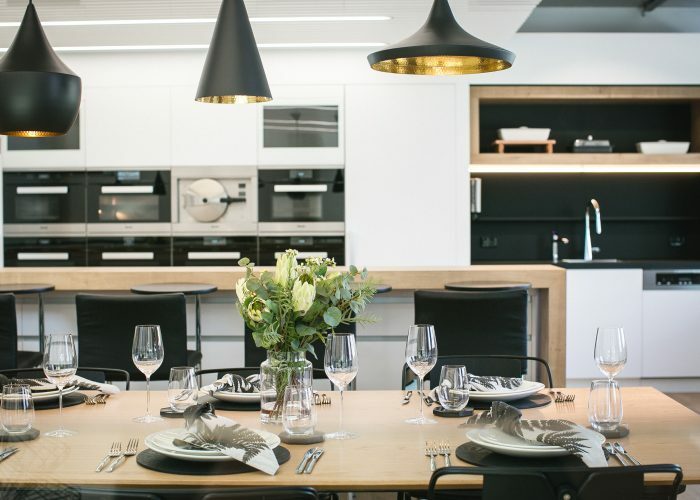 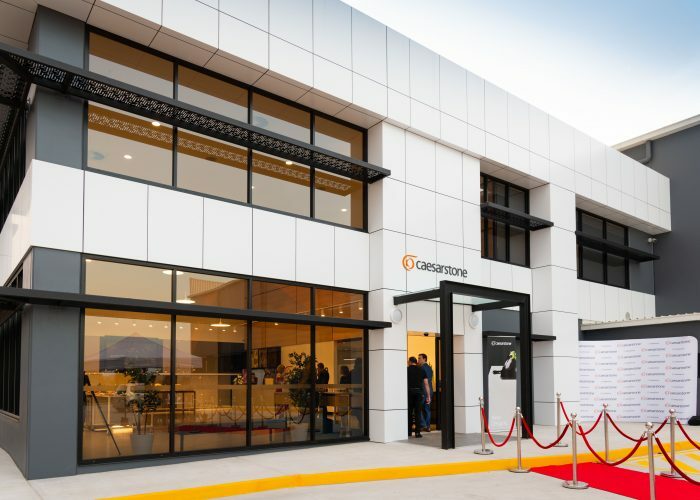 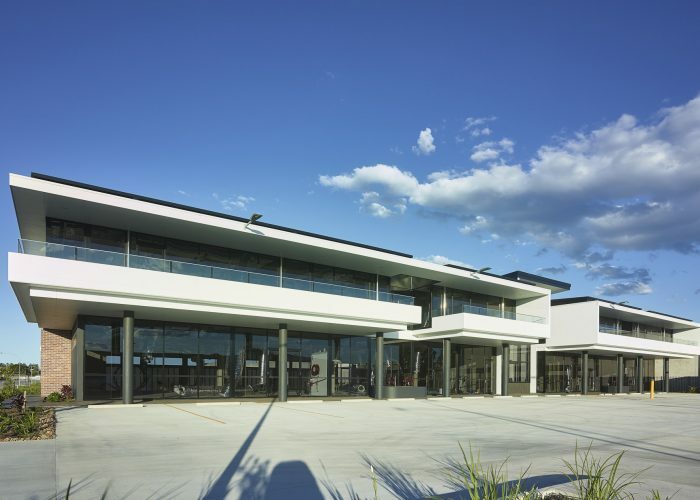 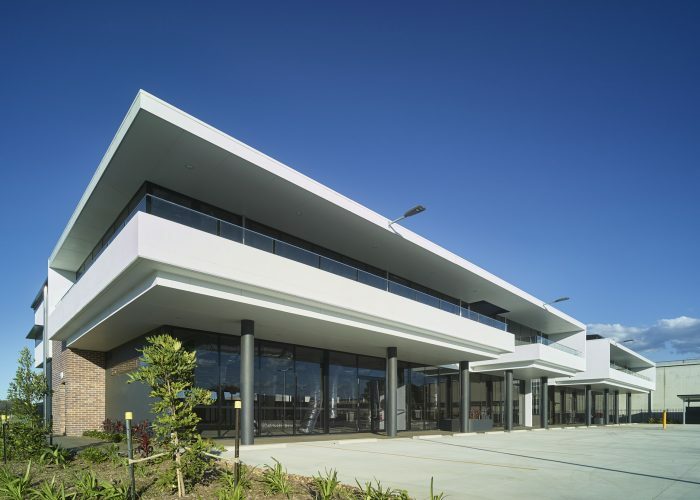 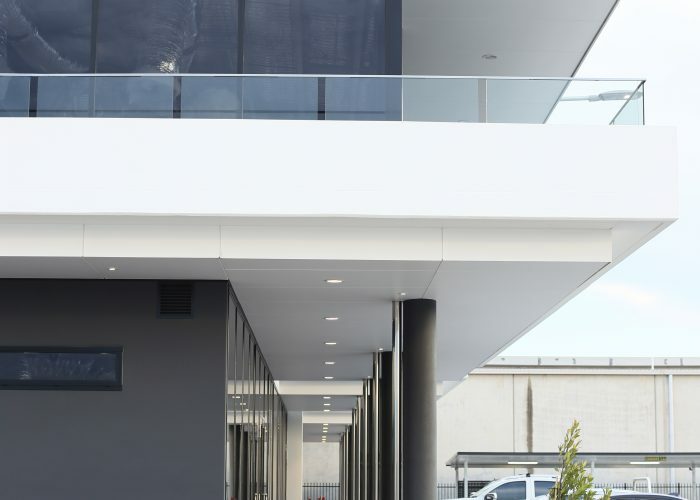 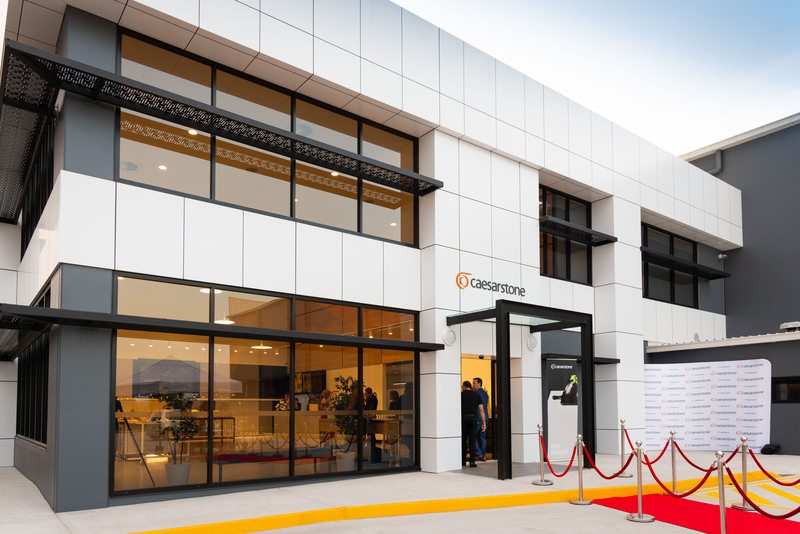 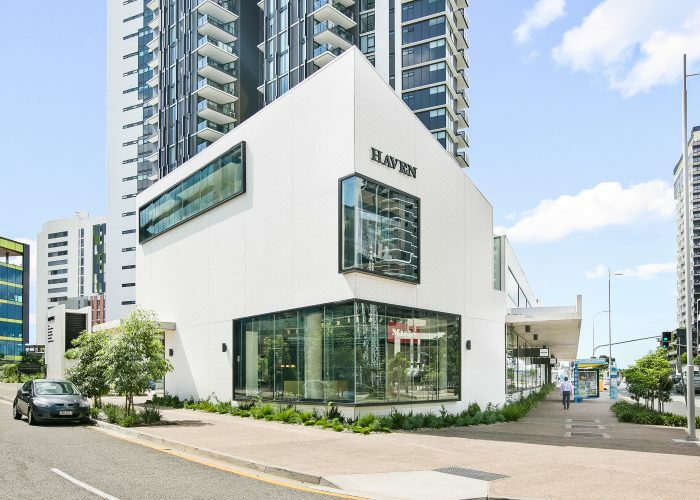 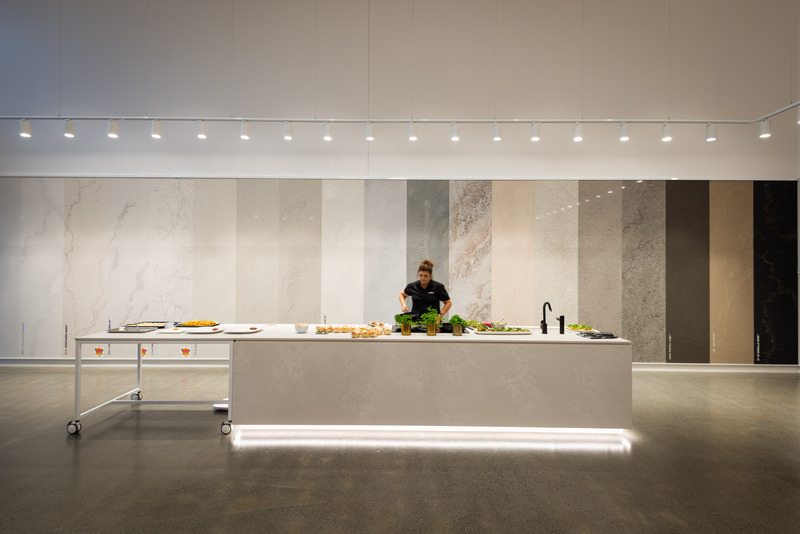 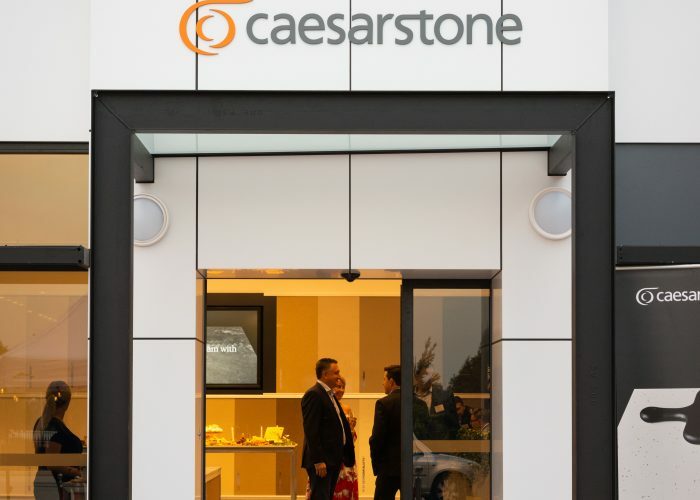 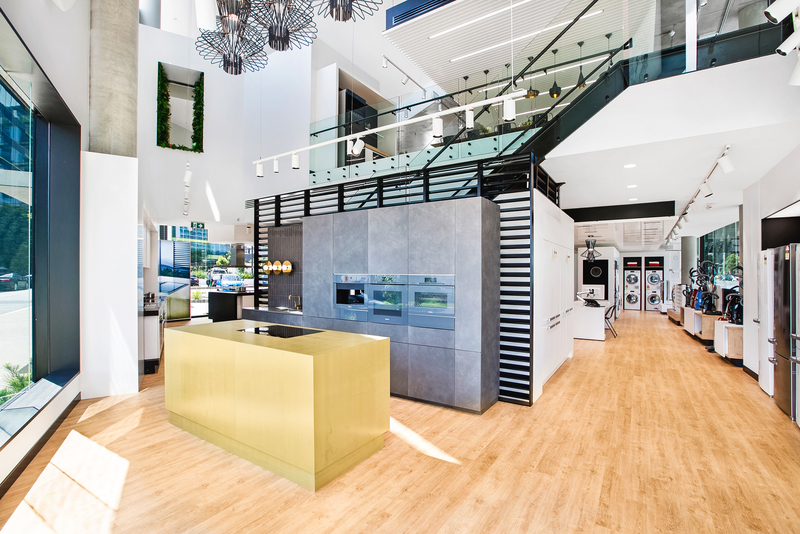 The new Caesarstone showroom sits next to the state-of-the-art warehouse facility in Yatala; and is designed for prospective clients to appreciate the look and feel of the Caesarstone product. 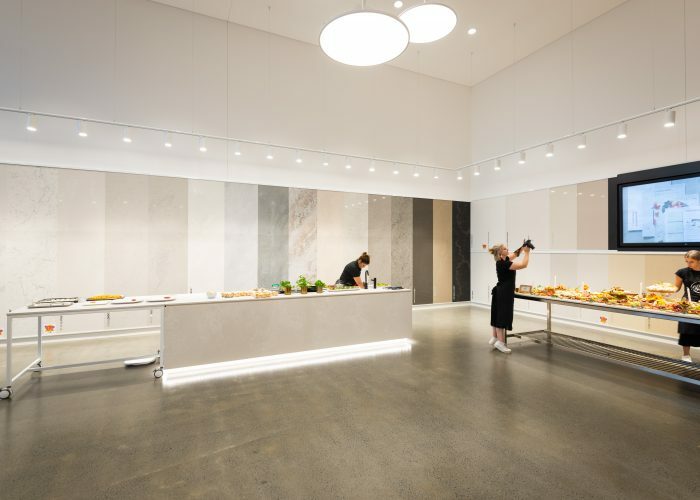 With the changing light of day, and during the night, the space functions as a retail and event space. 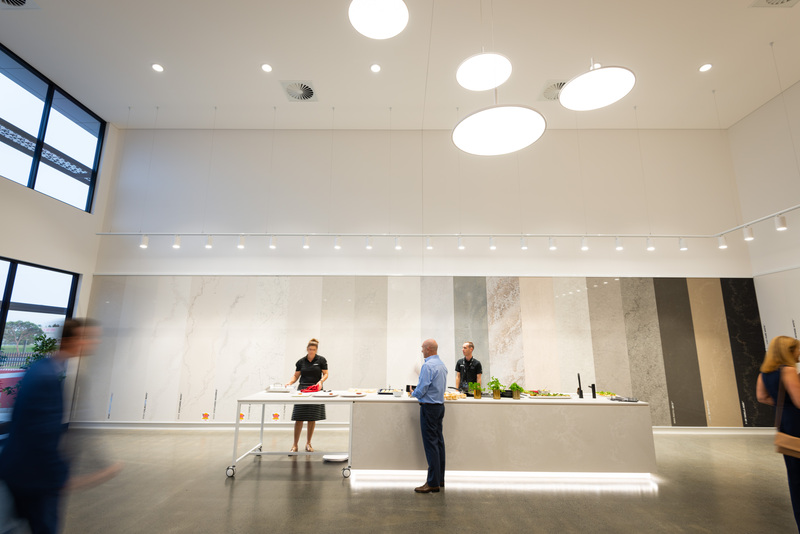 The focus is always on the product, and the quality of the light is all-important for showing the true colours and textures of the stone. 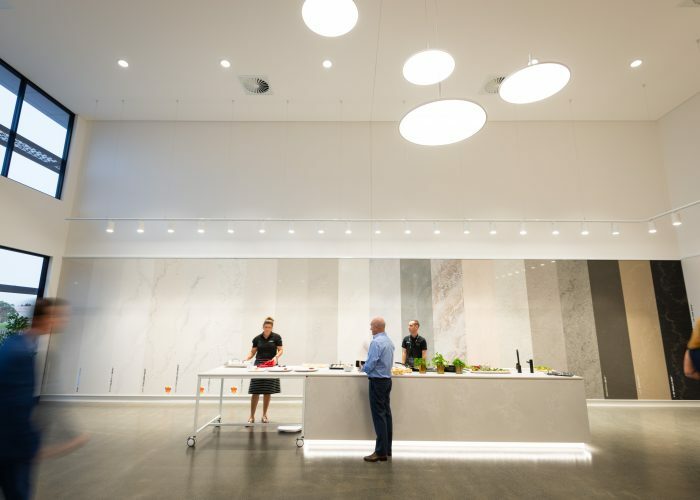 Users can touch and feel large pieces of stone, collect samples and view slabs in the warehouse. 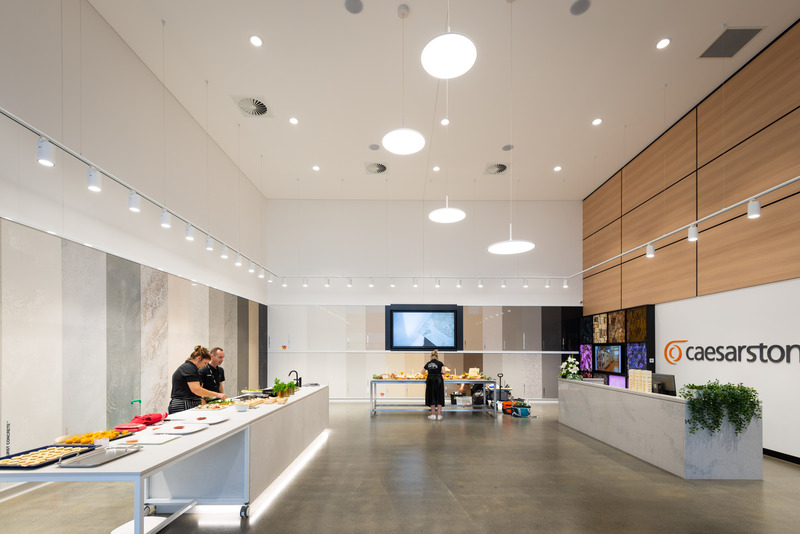 The space also utilises touch-screen technology to allow clients to visualise the stone in their own projects. 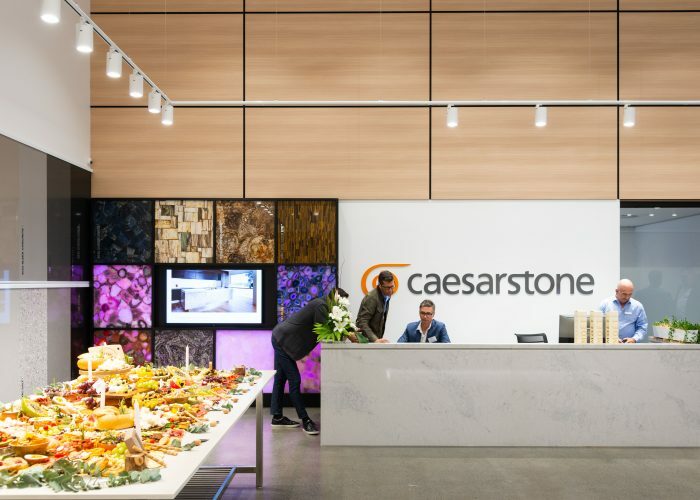 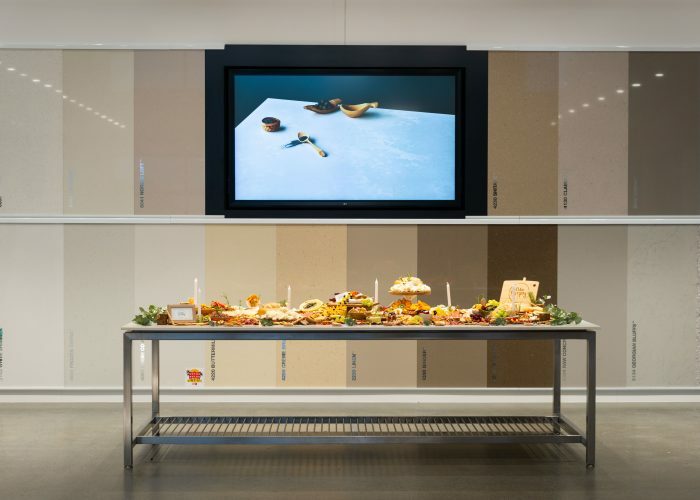 The project was designed to be as flexible as possible, to enable Caesarstone to change their stone panels whenever they wanted to showcase new products. 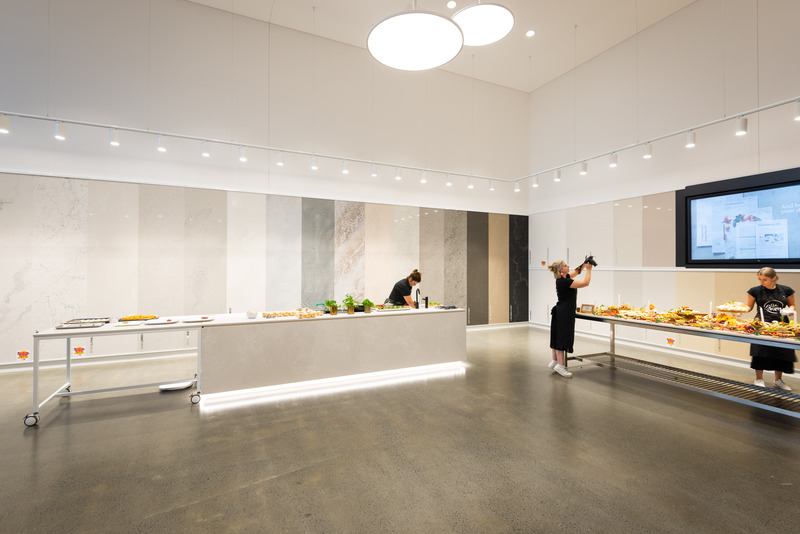 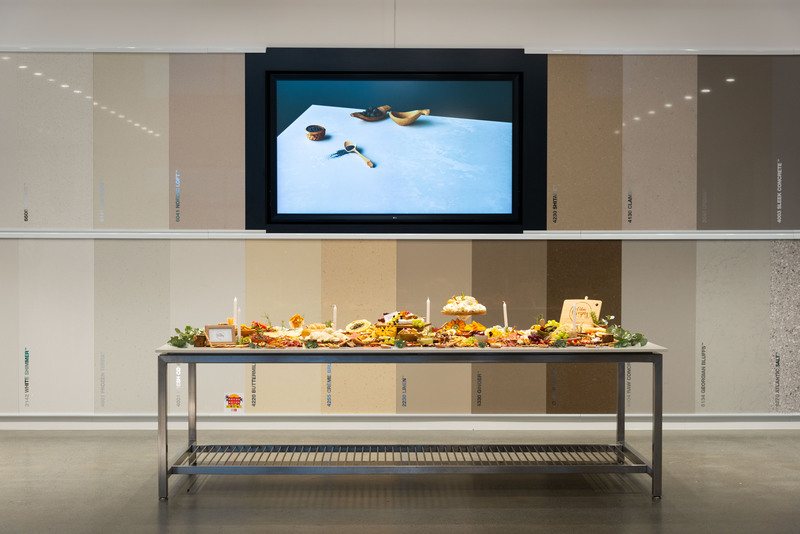 For this reason, the palette is crisp and simple – making the stone the hero of the spaces. 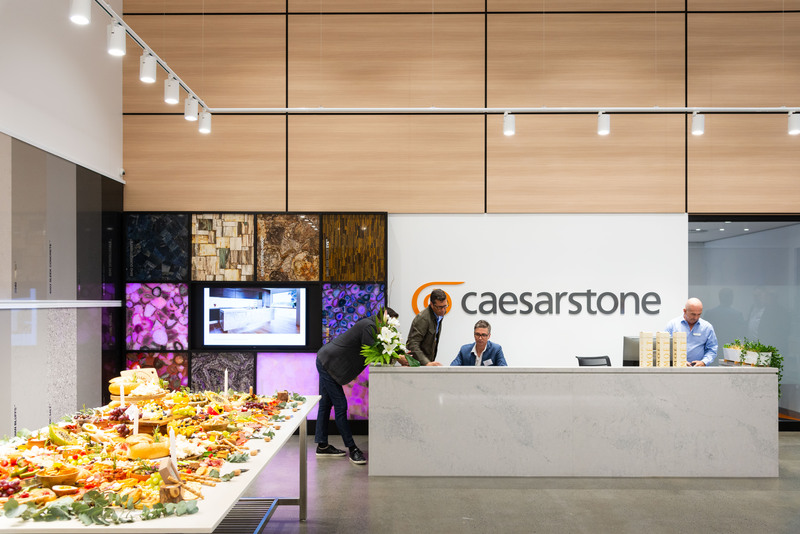 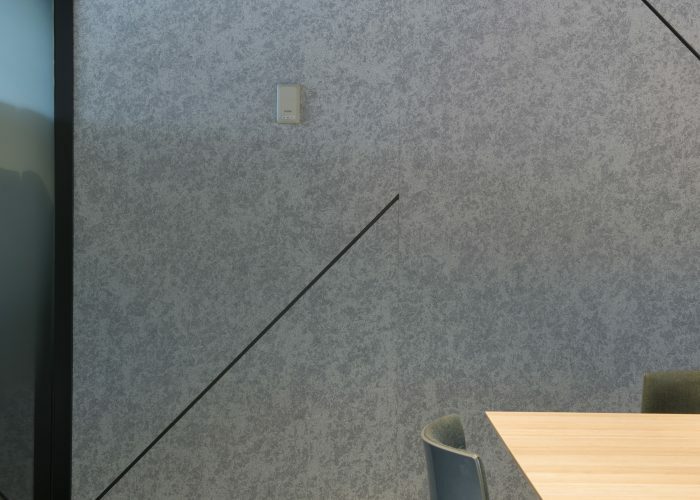 The various Caesarstone finishes flow through into boardrooms, amenities & staff areas to reinforce the pride that the Caesarstone team have for their brand. 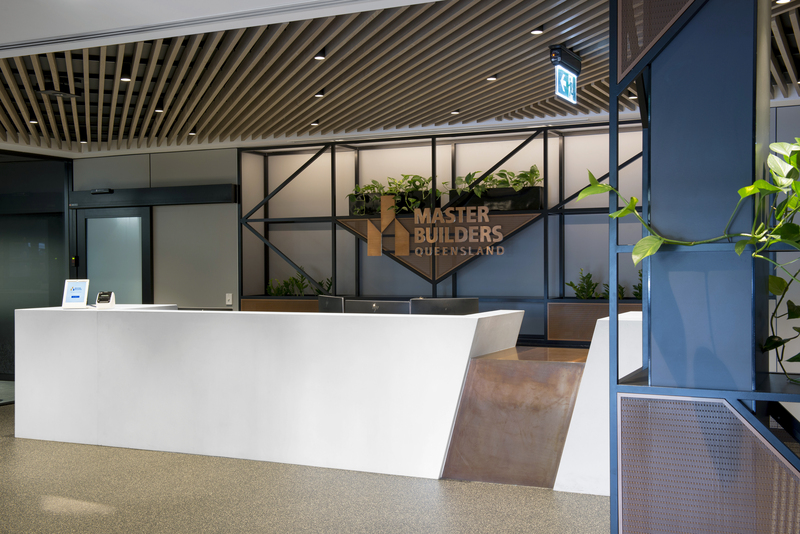 Master Builders is the voice for builders, the construction industry and its craftspeople. 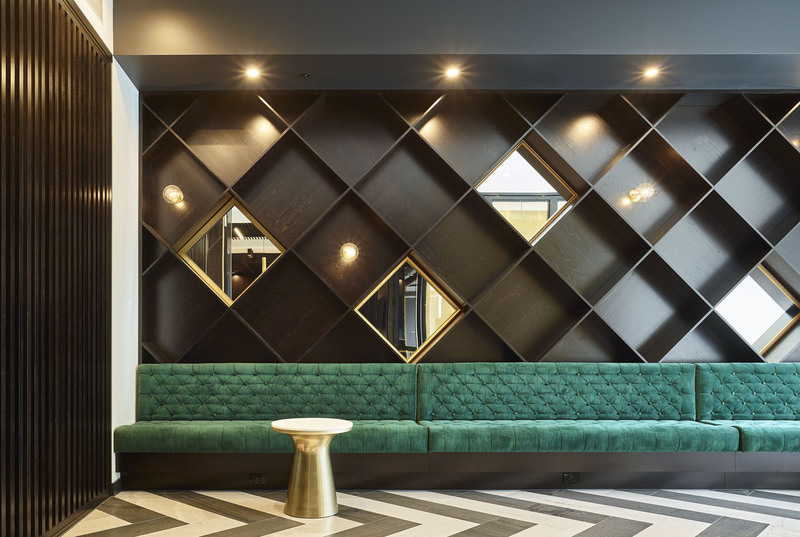 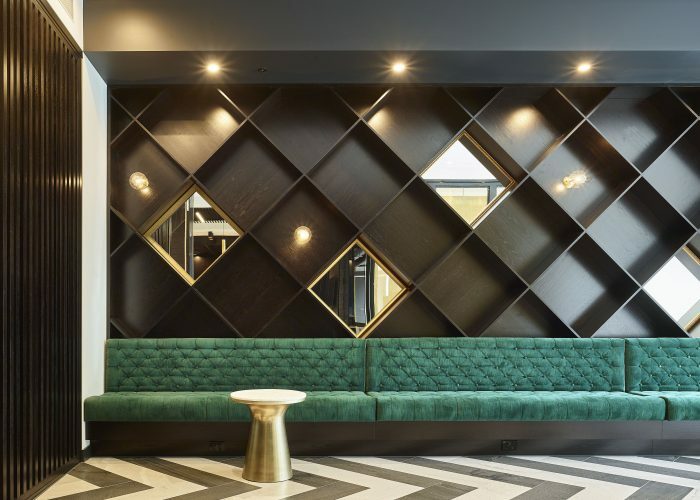 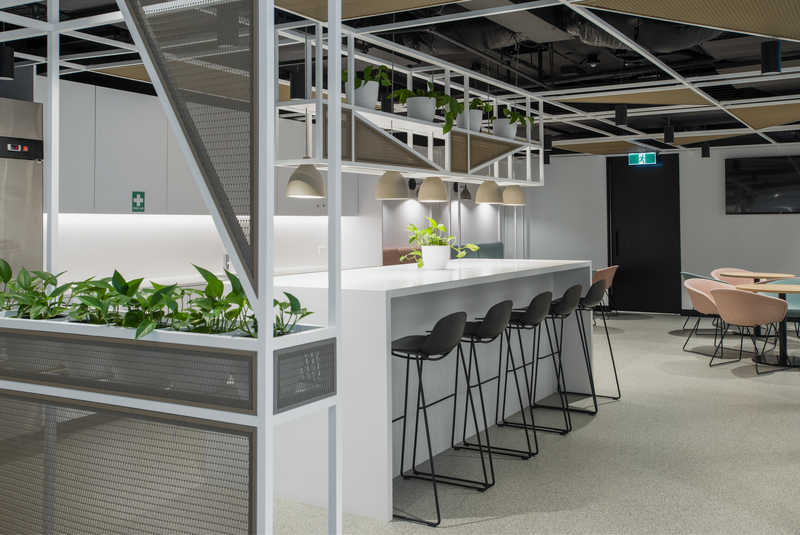 The renovation of their space needed to embed the rich history and passion that they have for the built form – it needed to help create a connection between members and teams. 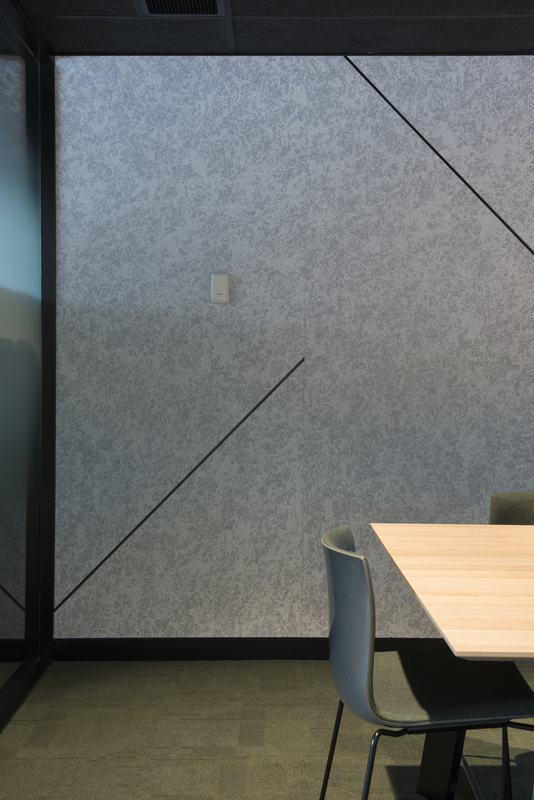 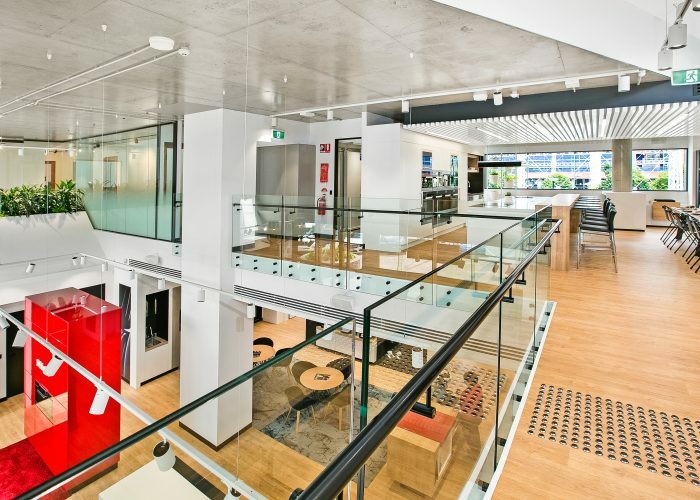 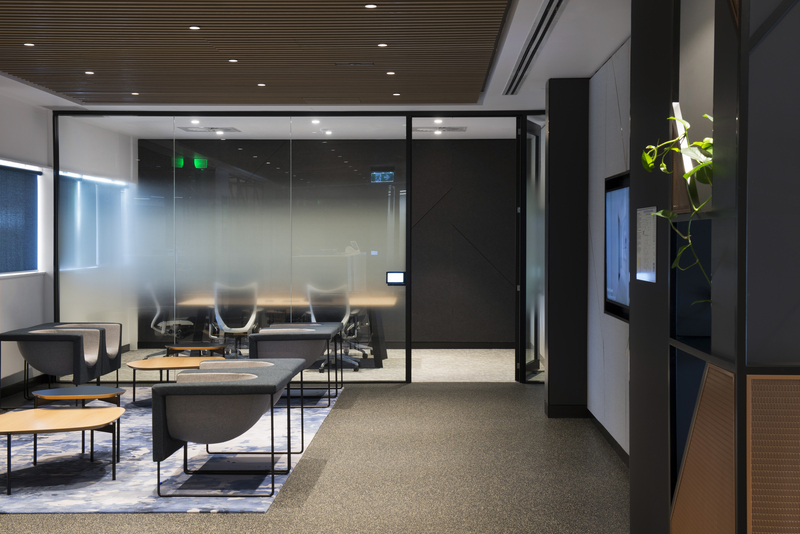 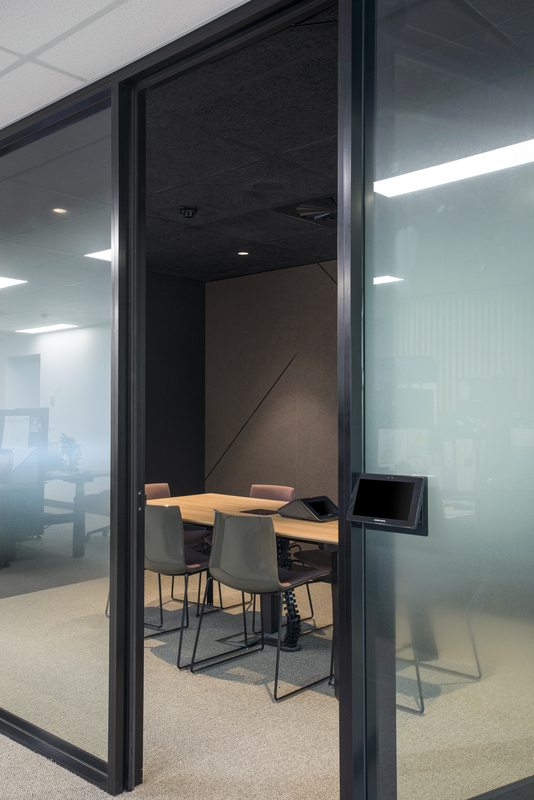 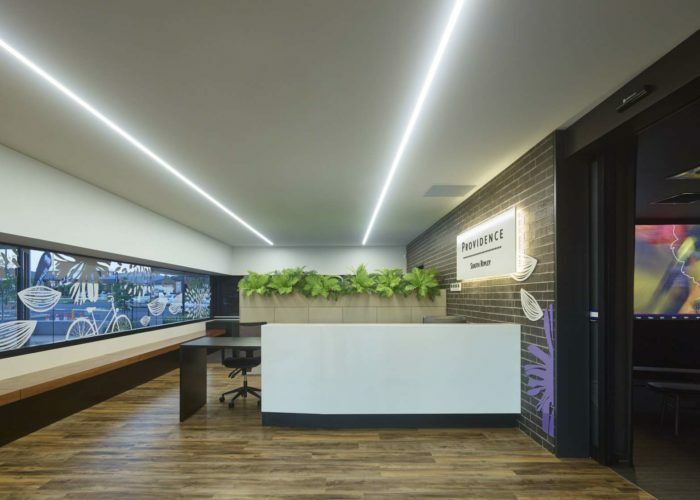 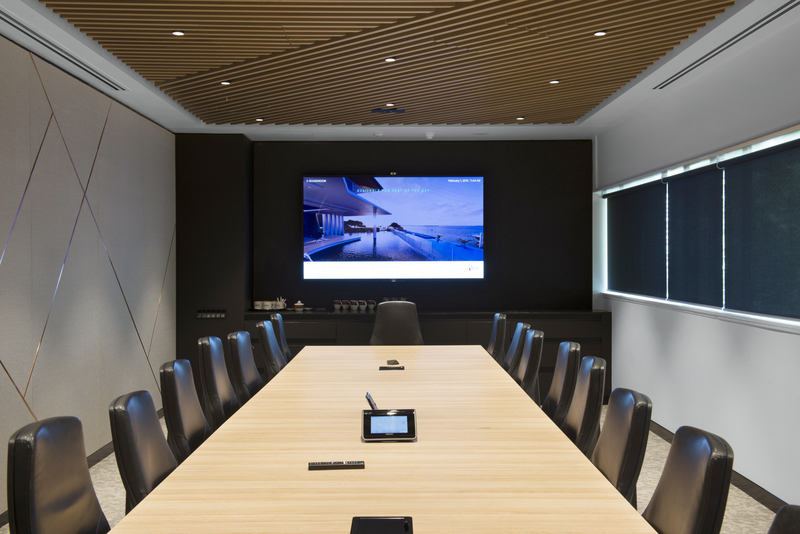 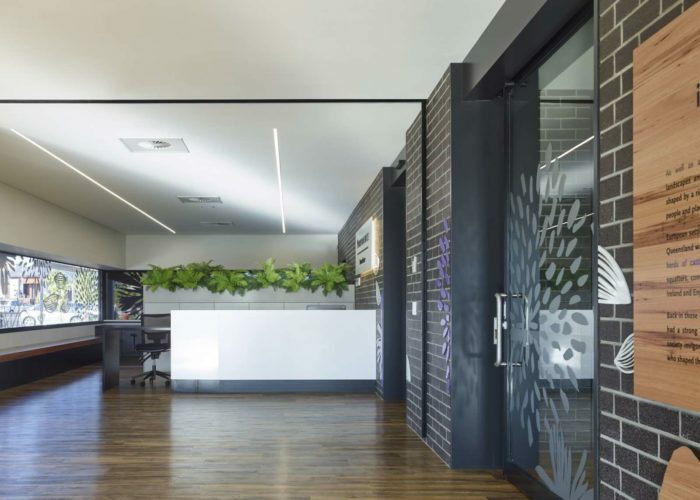 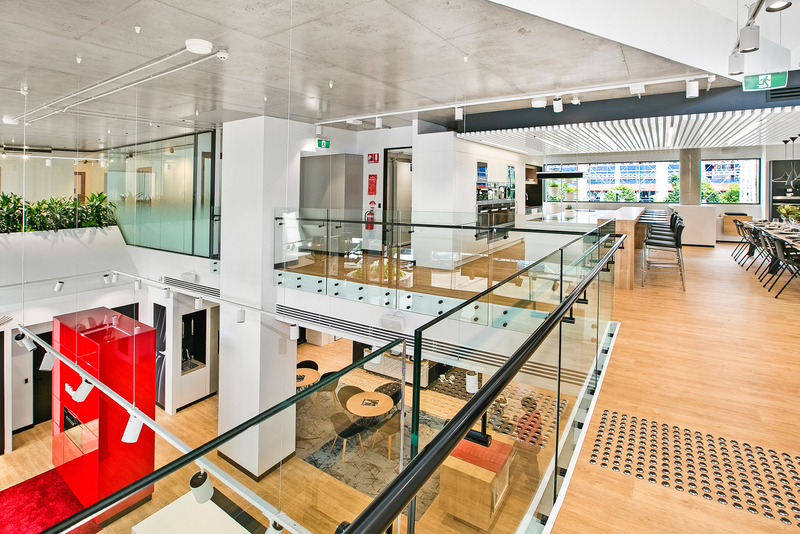 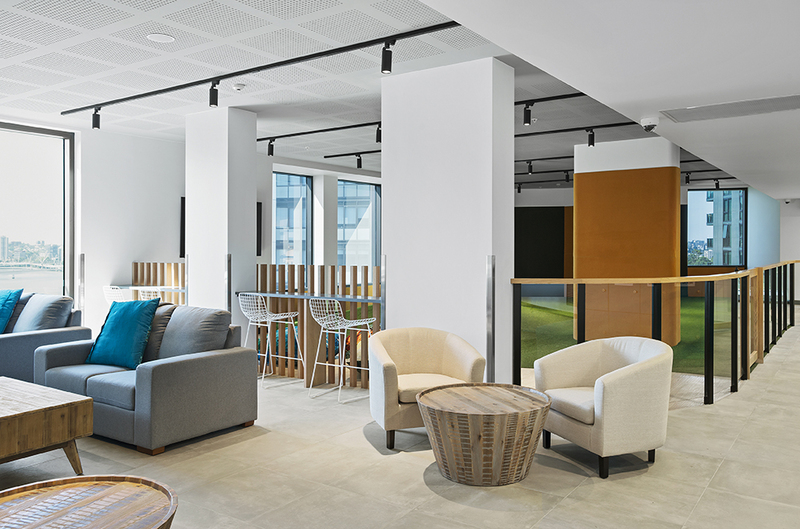 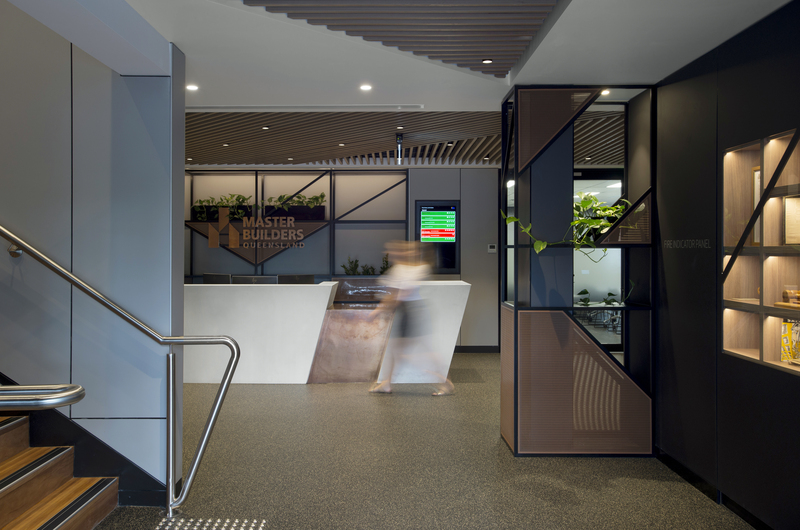 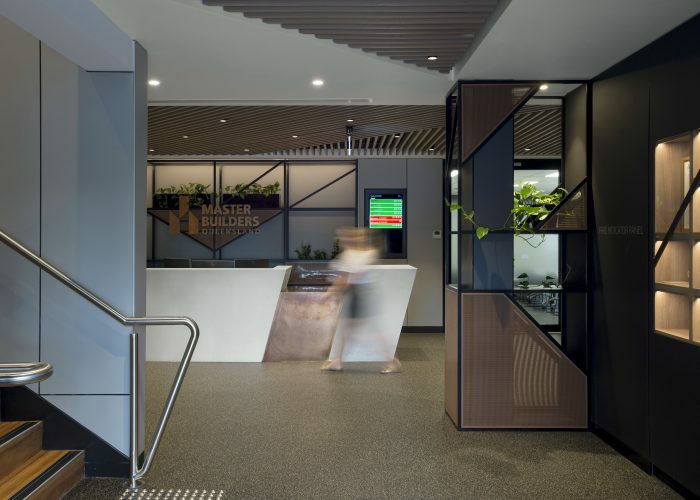 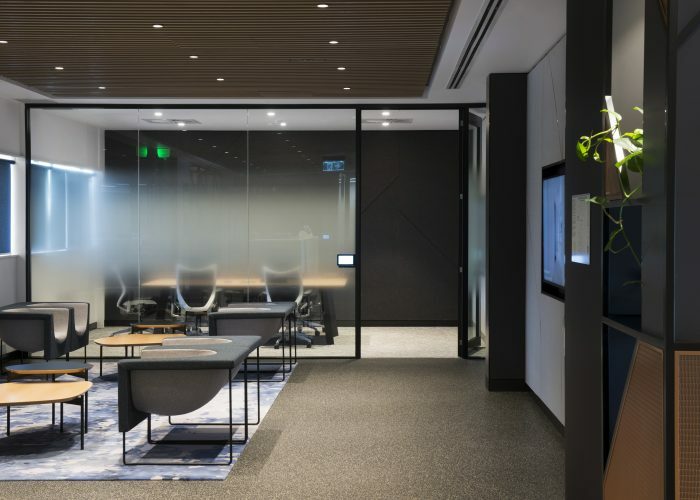 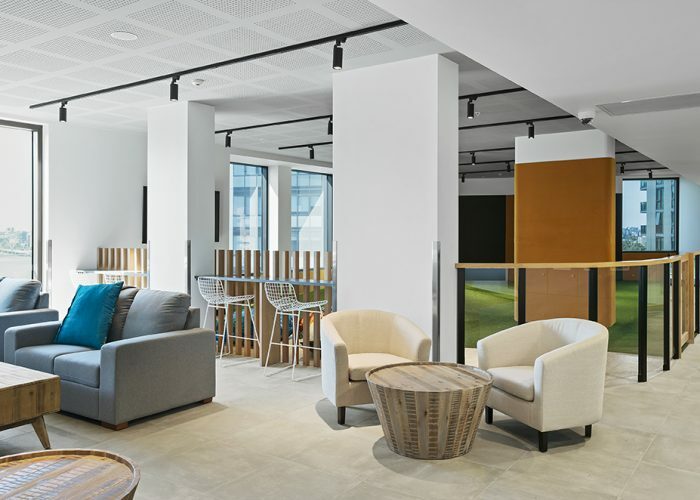 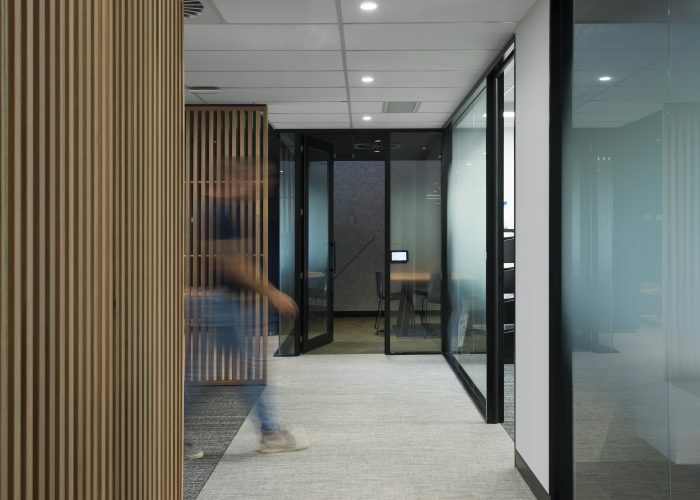 The refurbishment of the Master Builders Queensland offices was a big step for the board, and a huge commitment to change. 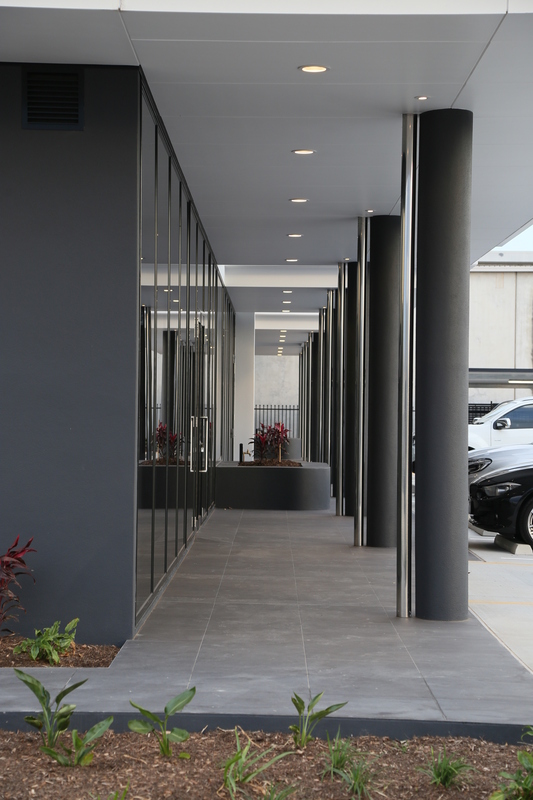 From the start, we were aware of the association’s heritage, and its importance to the building community. 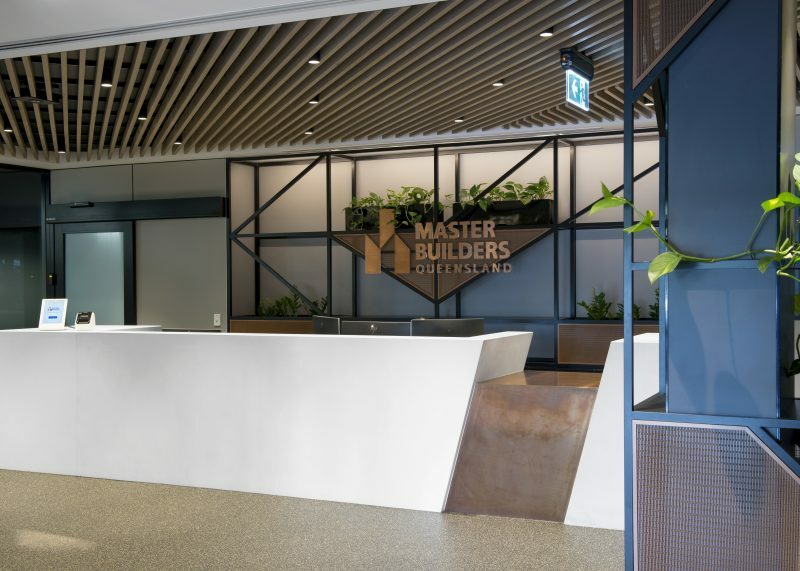 We went on a journey with the Master Builders team where we explored who they were, how they wanted to be presented to the general community, and what mattered the most to them. 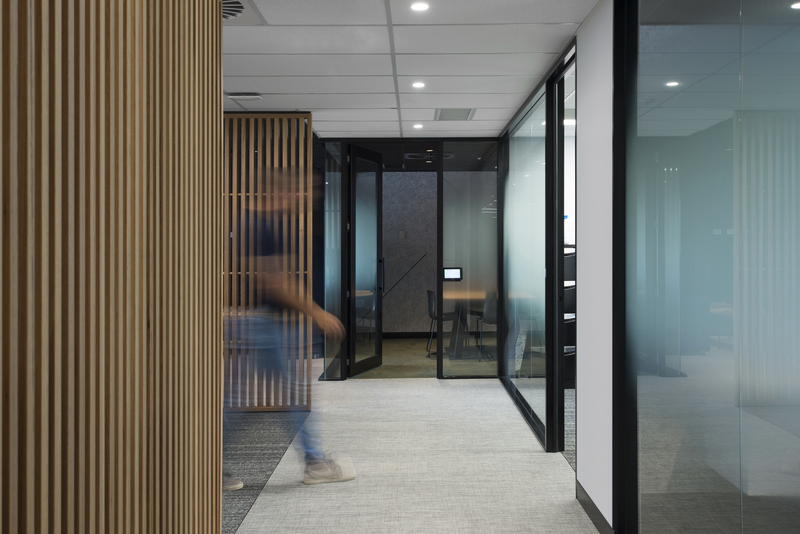 This helped to identify the essence of the project for us – the few key things that needed to hold true through the whole fitout. 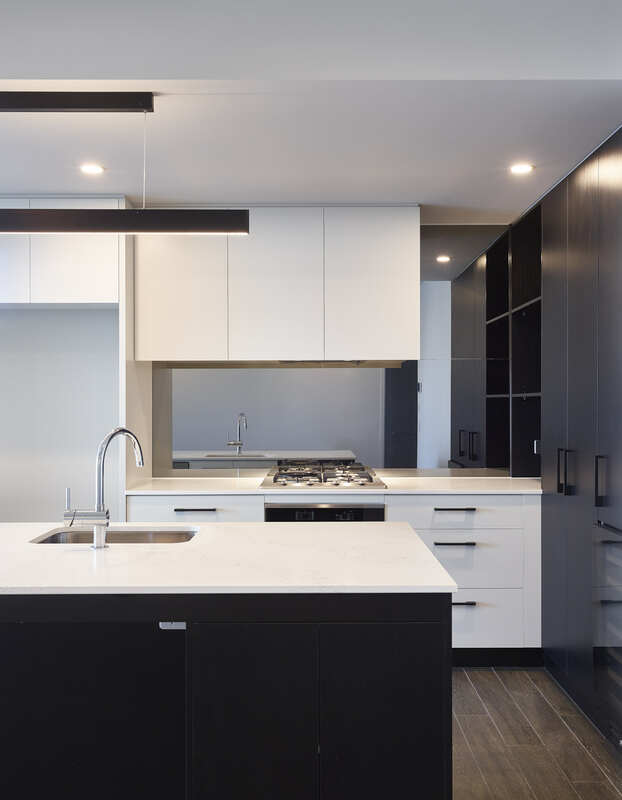 These qualities included the following: heritage, craftsmanship, high- quality of workmanship, functionality, connection, and modesty. 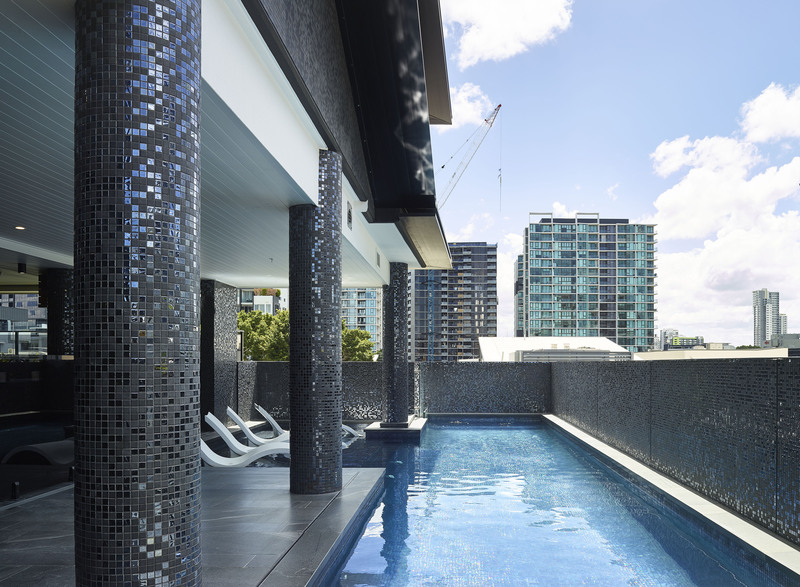 This exploration led us to look at the history of Queensland builders – their craft, and the materials they work with. 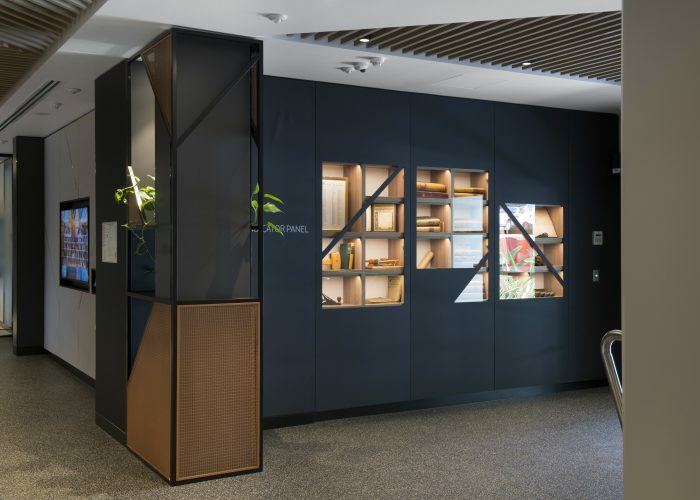 We created subtle touches through the fitout showcasing traditional materials in their raw form, to remind visitors of the origins of Master Builders. 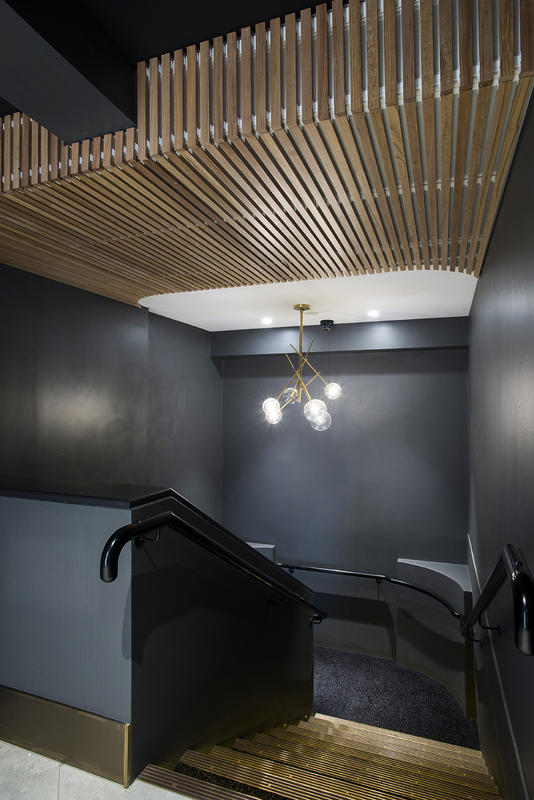 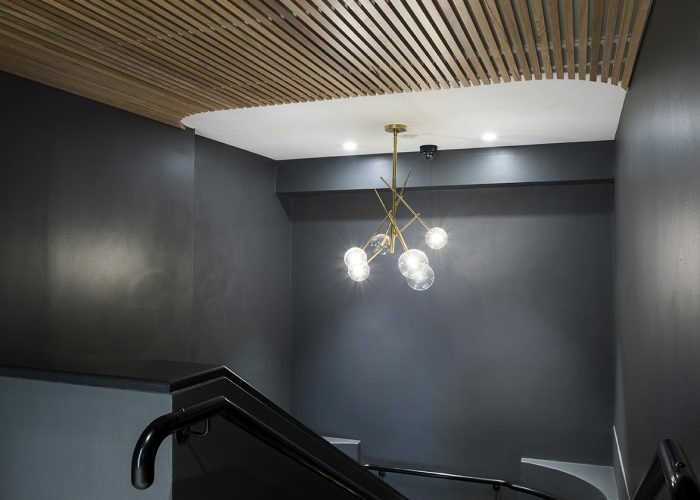 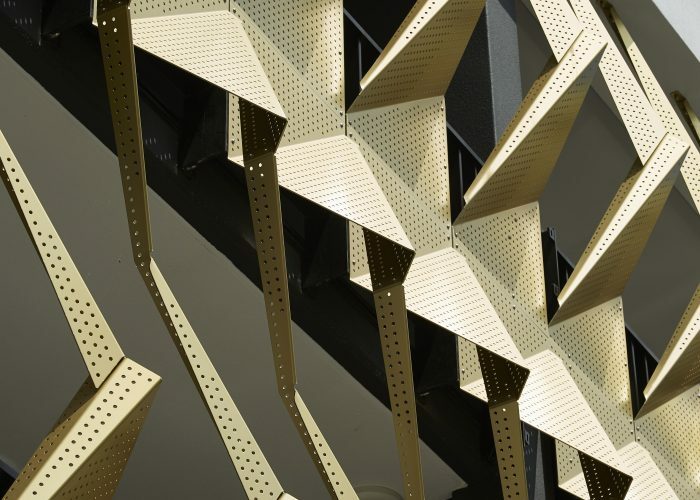 These little details helped to identify different spaces as you move through the building and help to create the sense of a journey – you go from timber through copper, steel and brass details as you get further into the building. 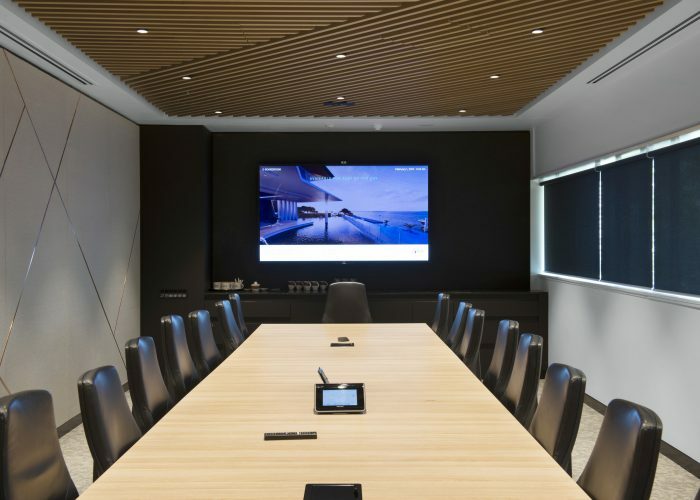 Another key concern that came out in early workshops with the clients was the connectivity between different teams in the office. 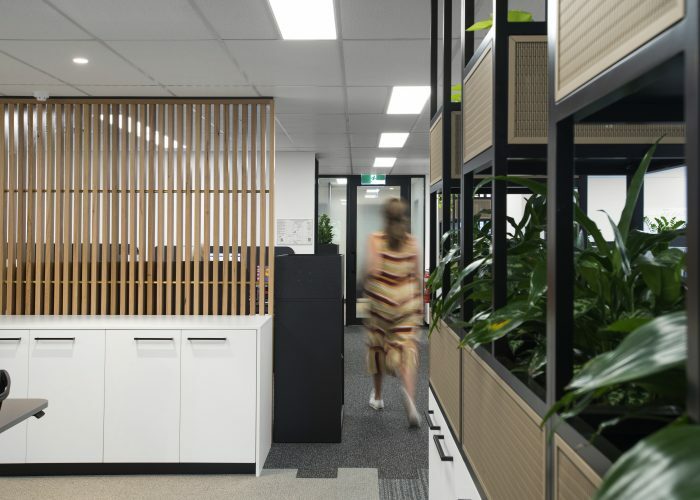 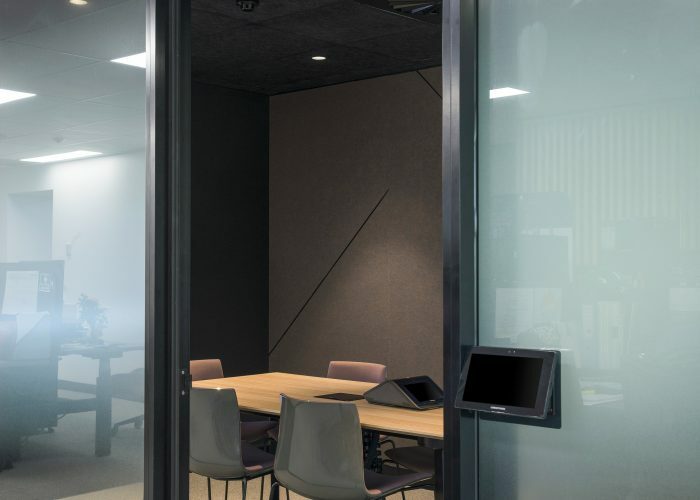 The old layout consisted a segmented cluster of small rooms, which meant that space was being used inefficiently, and many of the staff felt disconnected from the rest of the office and from the members. 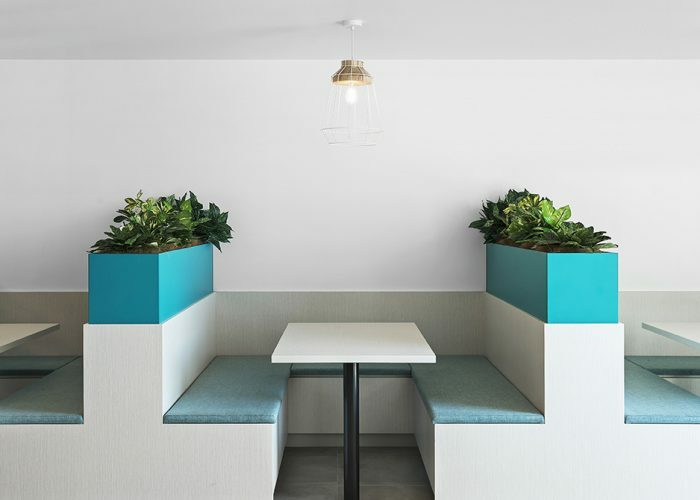 We were able to combine spaces and win enough previously-wasted area to allow for centralised break-out spaces, small team meeting rooms and spaces for people to congregate casually away from their work desks. 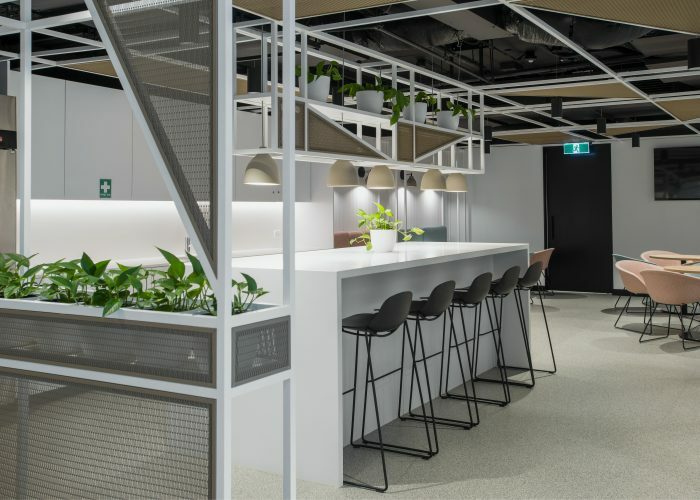 Most of the lower ground floor was repurposed as a refreshing lunch area with the feeling of an outdoor café, complete with extensive end-of-trip facilities. 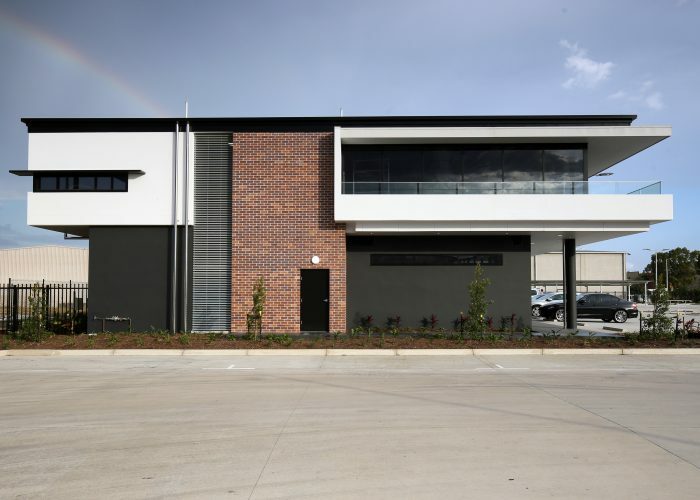 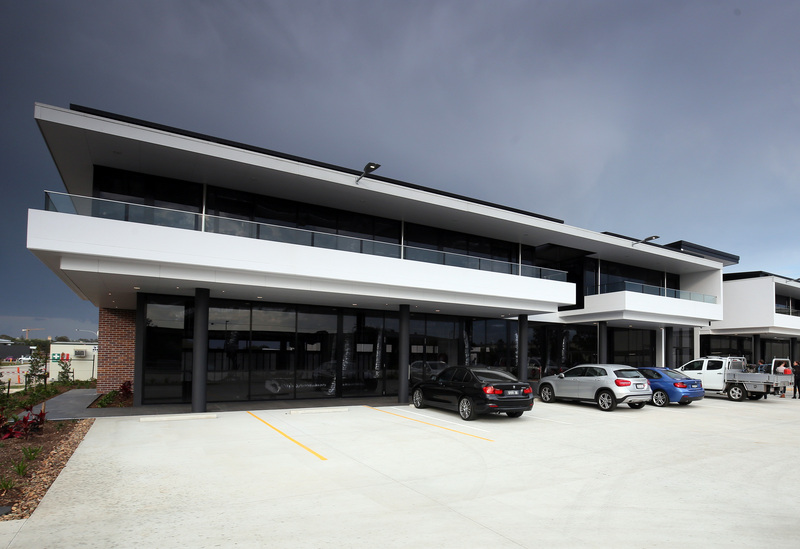 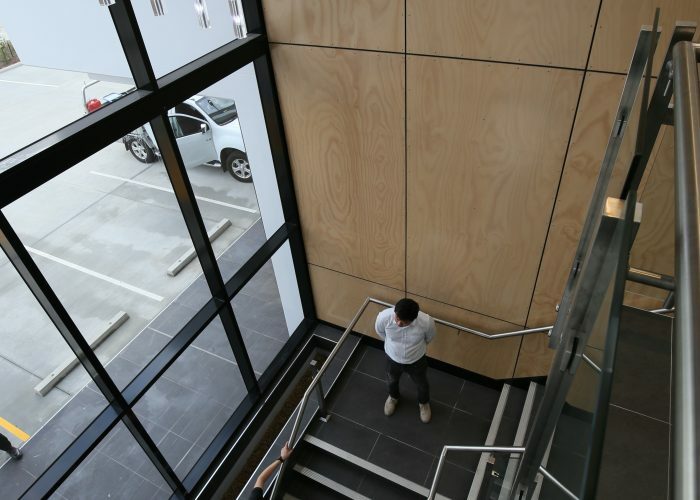 62 Crockford Street is a modern purpose-built medical centre, accommodating a large GP practice, gymnasium, allied health services and commercial suites, in Northgate’s commercial and industrial hub. 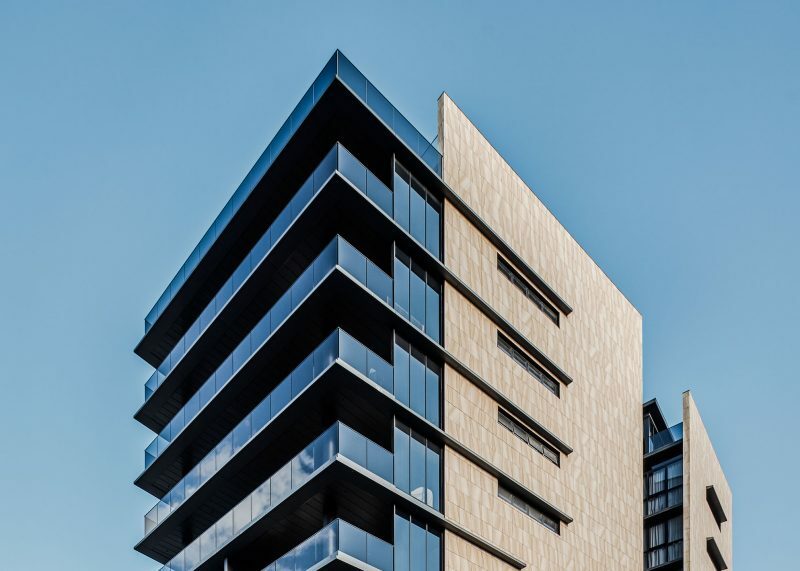 The building’s form seeks to be bold, minimalistic and timeless – designed to be efficient for both buildability and capacity. 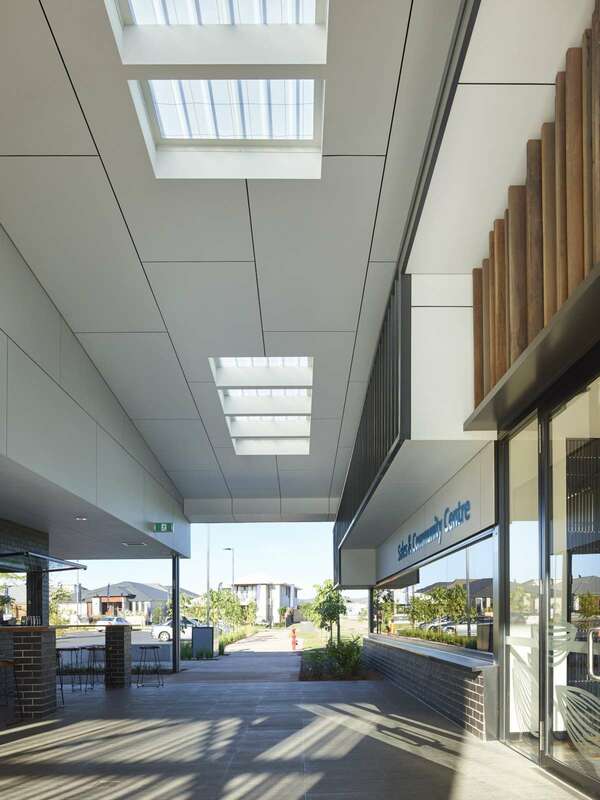 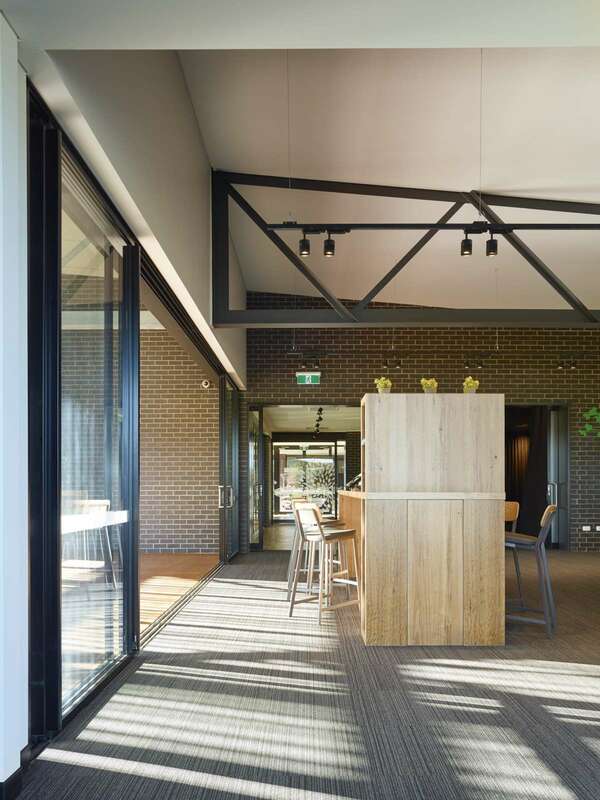 Natural light and landscape is incorporated without comprising floor yield, to ensure a sense of calmness and tranquillity, supportive of the building’s Medical purpose. 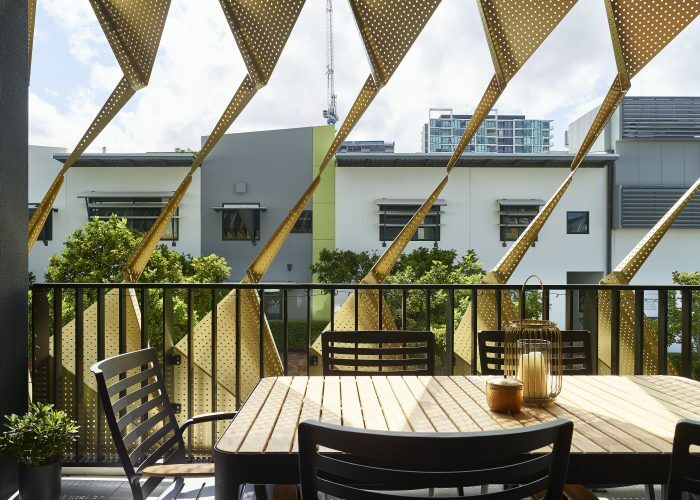 The building’s open corner addresses the main entry, with well-shaded balconies wrapping the upper floor, allowing for a private retreat for workers without disconnection from the ground plane. 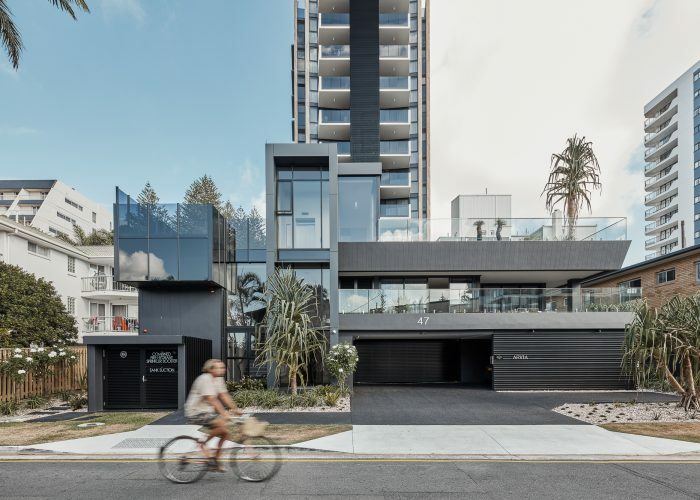 Double height atriums open both to sky and planters below seeking to breathe life into the building – trees are able to grow through atrium voids which are decorated with seating plinths at ground level. 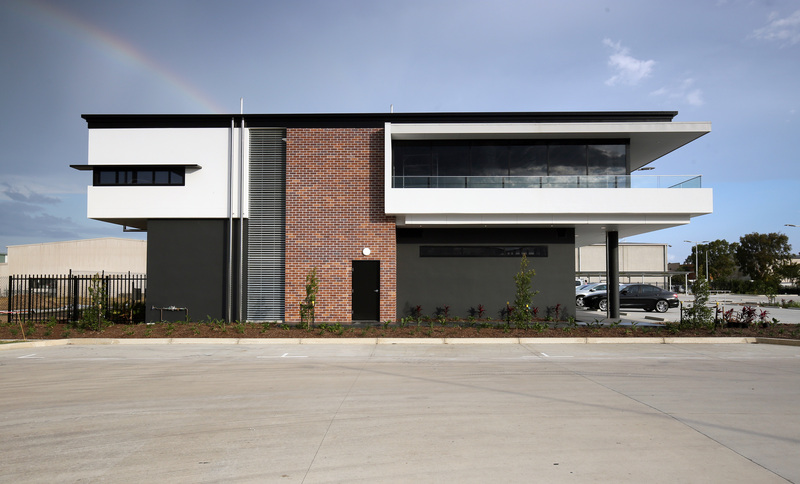 The chosen material palette draws inspiration from the surrounding industrial context. It plays with a juxtaposition of textures through raw materials such as brick, concrete, steel and plywood. 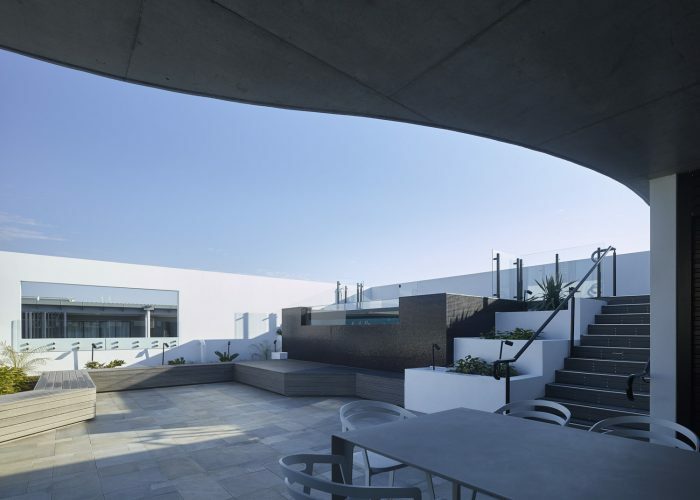 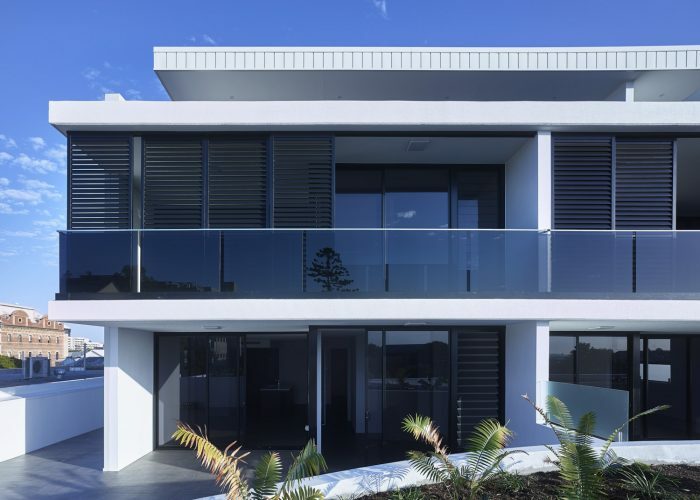 We owe the success of the project to the strong support of our open-minded client and supportive builder, who worked with us seamlessly throughout the project to ensure the quality and vision of the project was upheld. 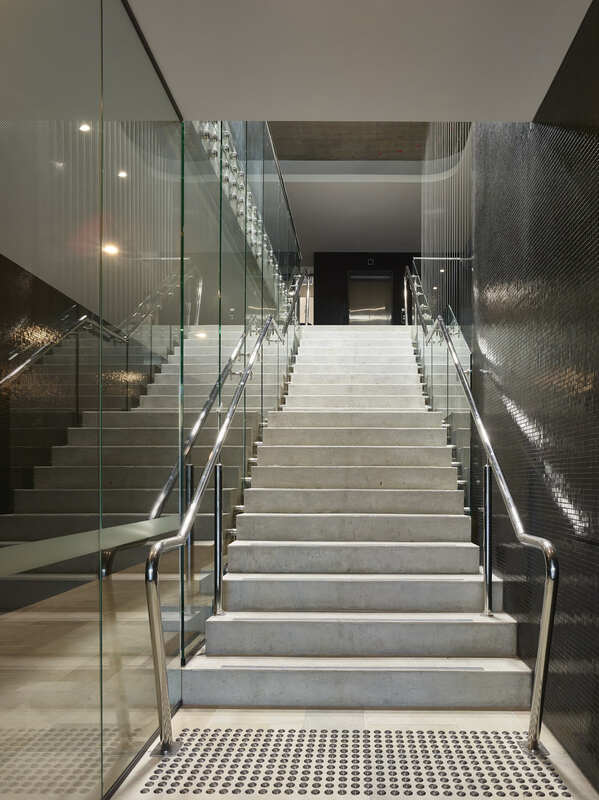 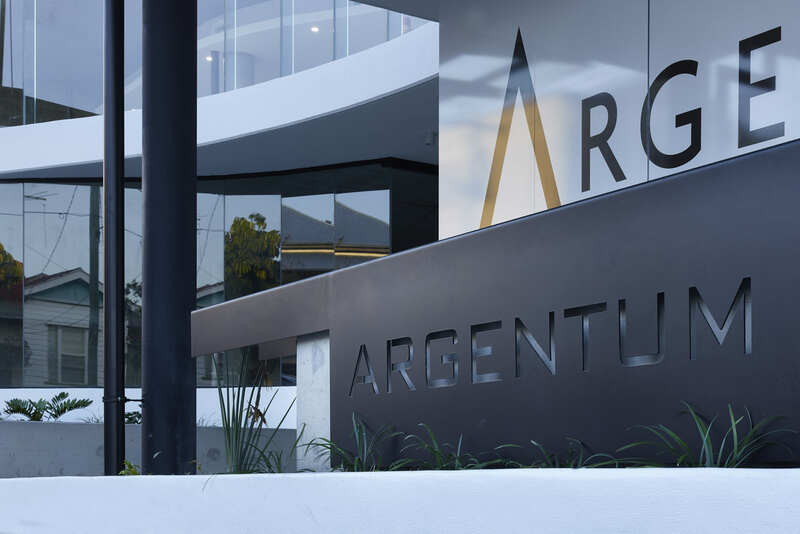 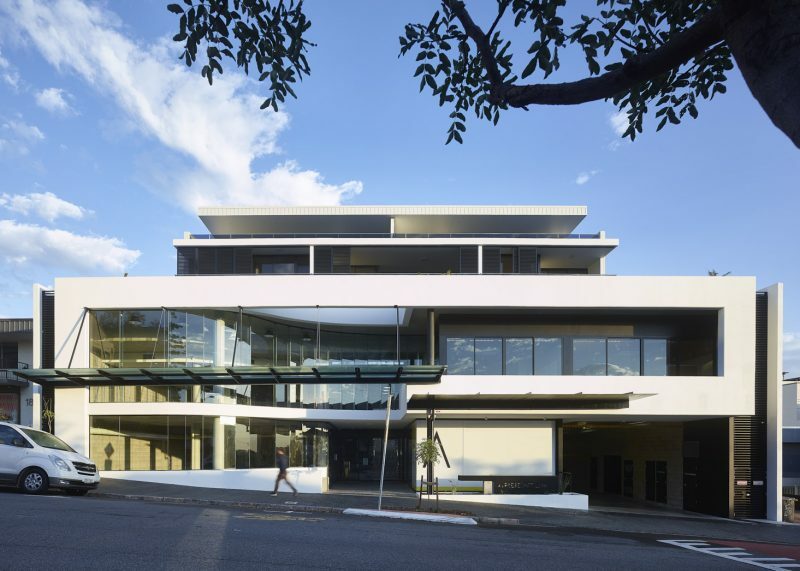 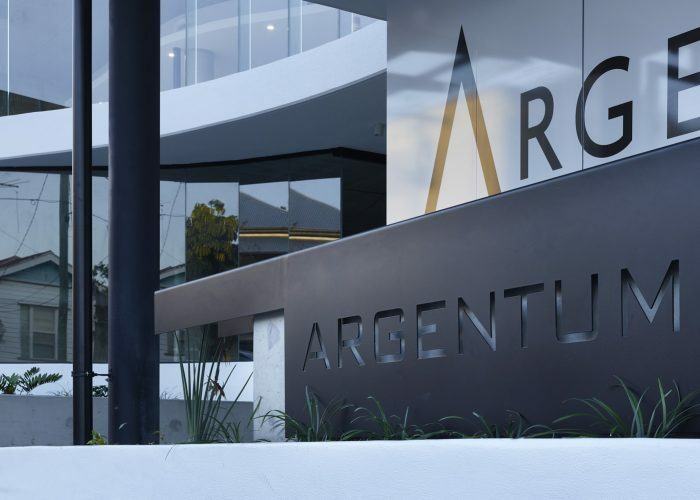 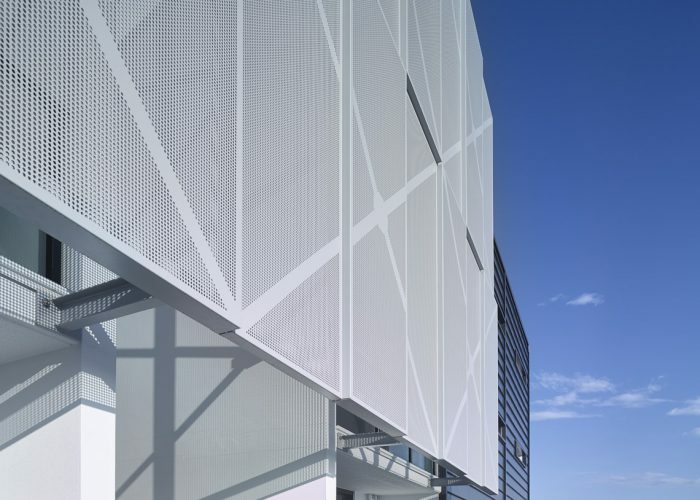 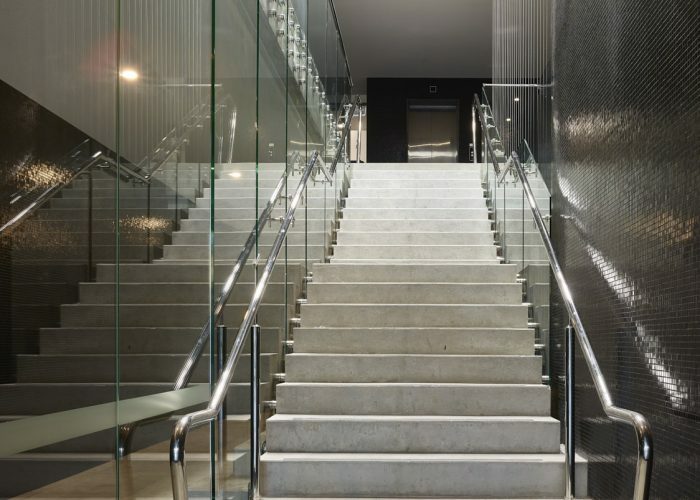 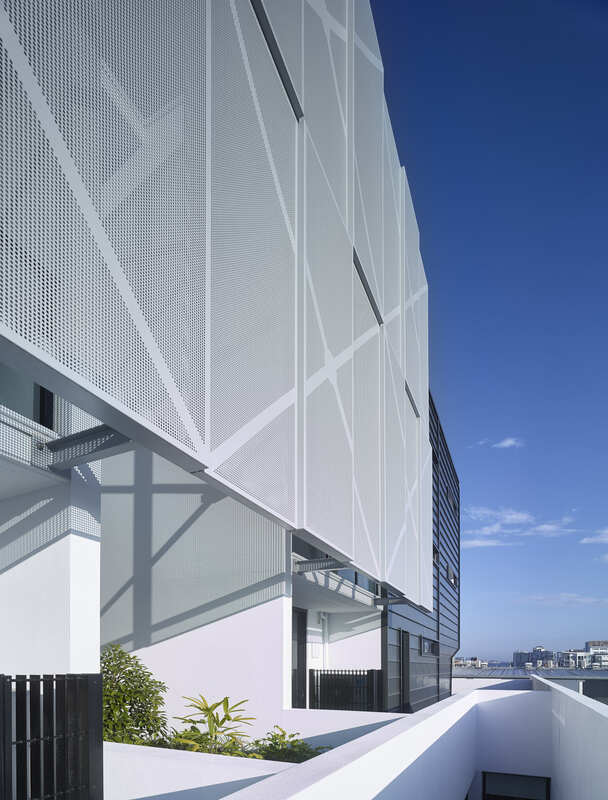 “Argentum” is Latin for silver, appropriately named as this is Argent Australia’s Head Office & Brisbane showroom. 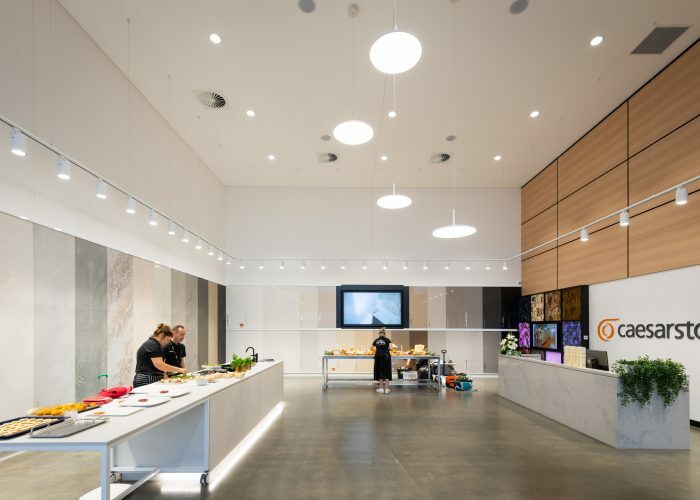 Our brief was therefore twofold, create a sleek commercial podium, and a multi-residential upper that responds to the transitionary nature of the site. 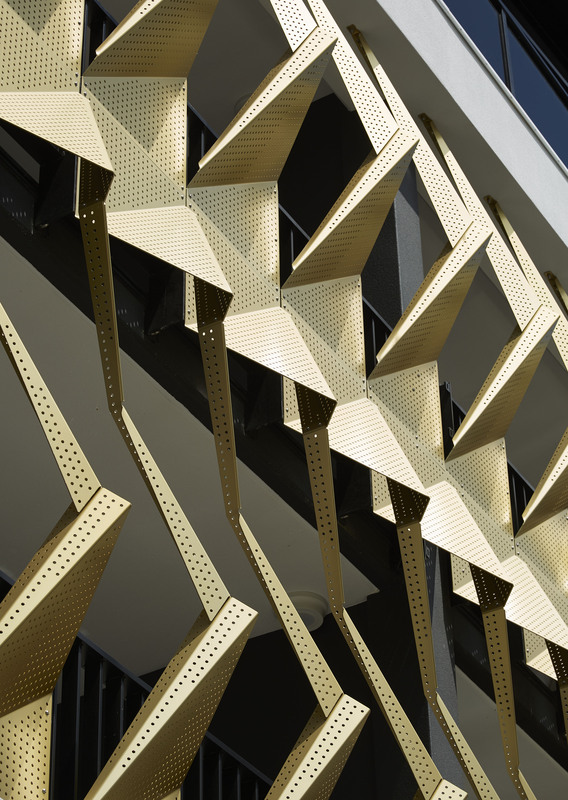 We drew upon early 20th century modernism as inspiration for the simple yet bold forms of the façade. Bands of concrete frame the showroom, which is softened by a double height curved glass façade that is grounded by a garden. 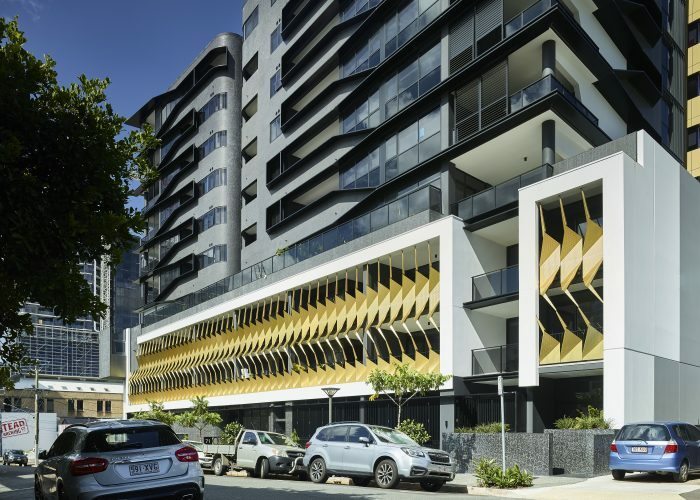 The curved glass wall draws residents & visitors into the entry, giving back space and volume to the street and giving a sense of openness to the street. 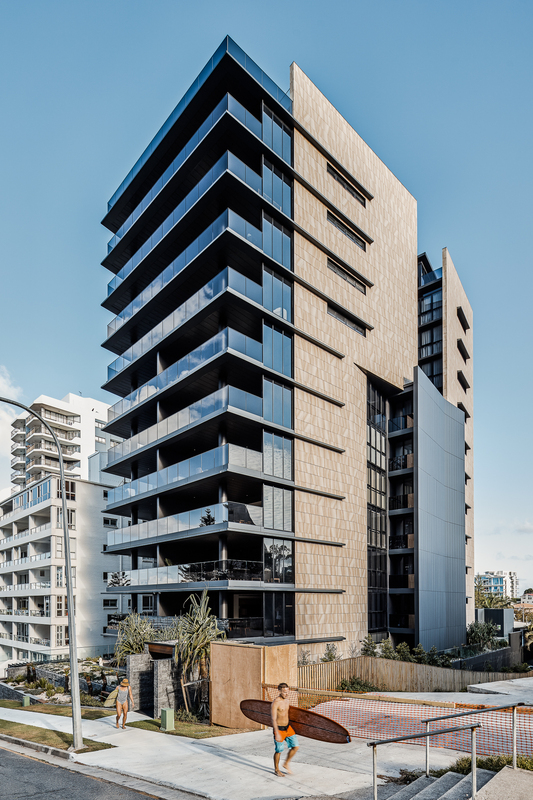 A simple material pallet of concrete, glass, steel, metal cladding & vegetation create a balance between a commercial aesthetic podium and a human scale level of detail for the residential component above. 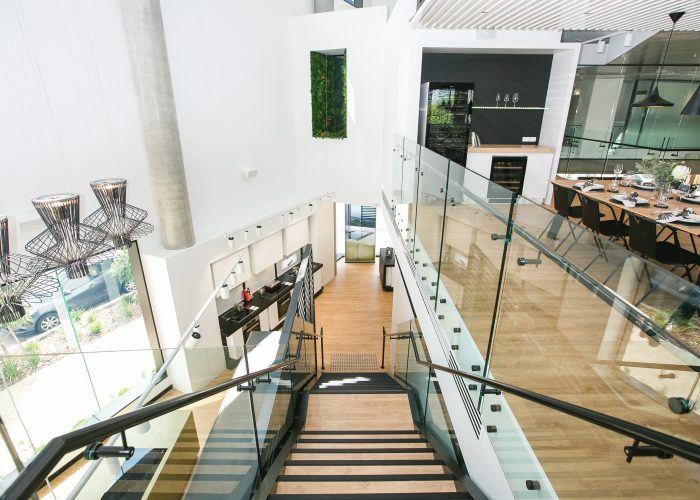 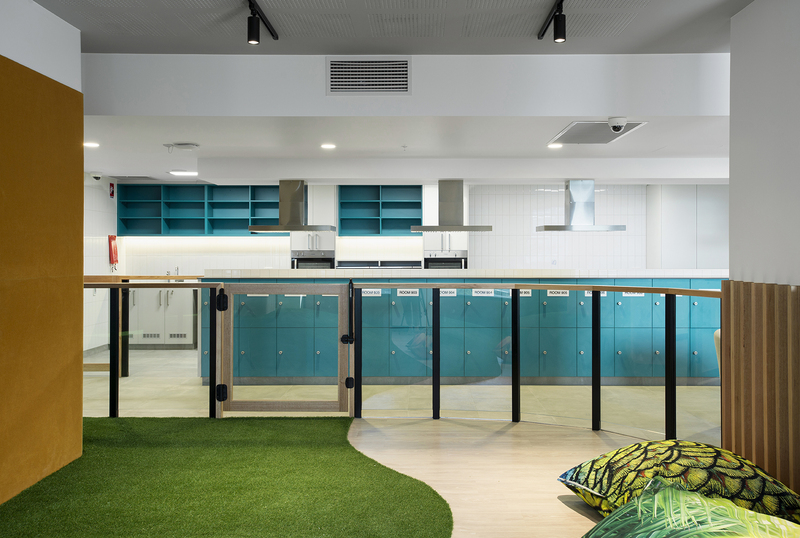 We used subtropical design fundamentals including vegetation, flow through ventilation, natural light & solar control to make sure we created a high-quality living environment for the residents & commercial tenants. 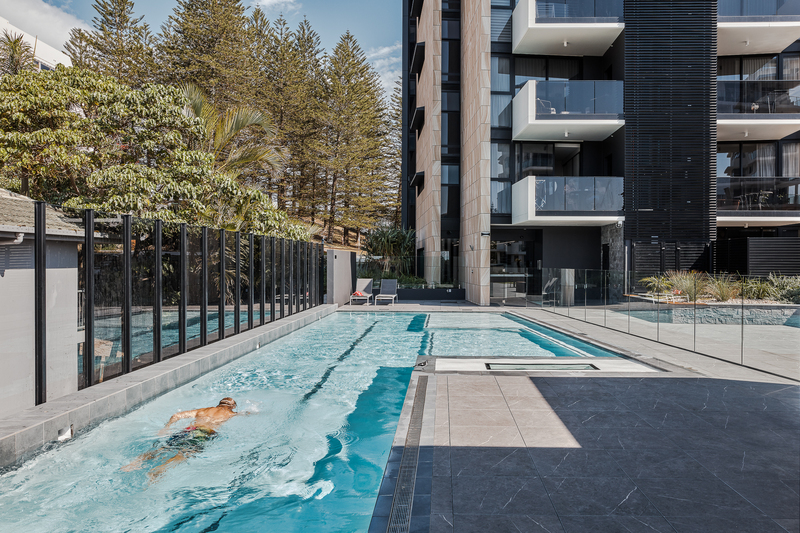 This includes a communal recreation space on the roof with a pool and steam room to offer a meeting place for residents. 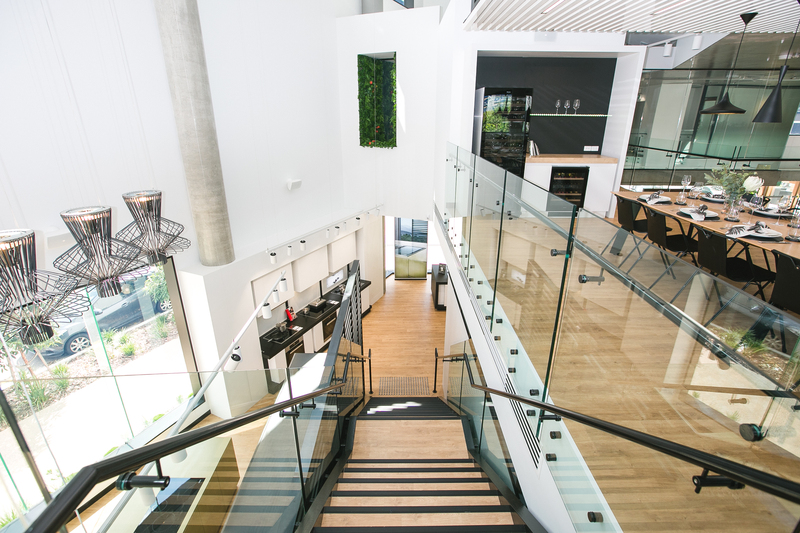 Residential design is not just about four walls and a roof (or how many you can stack on top of each other). 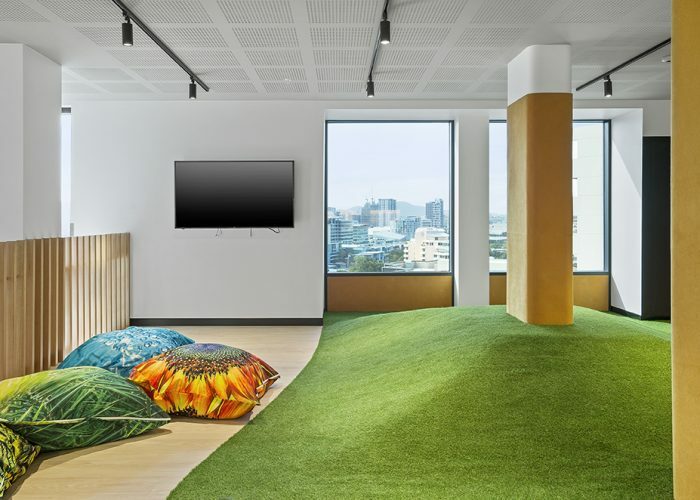 (How might we create places that generate joy and delight, that inspire, that increase the quality of life, and that are respectful of their context? 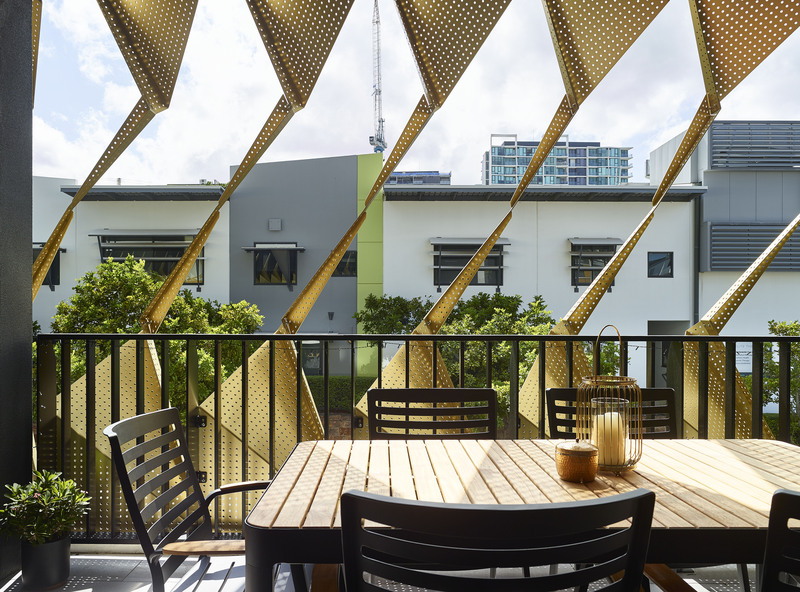 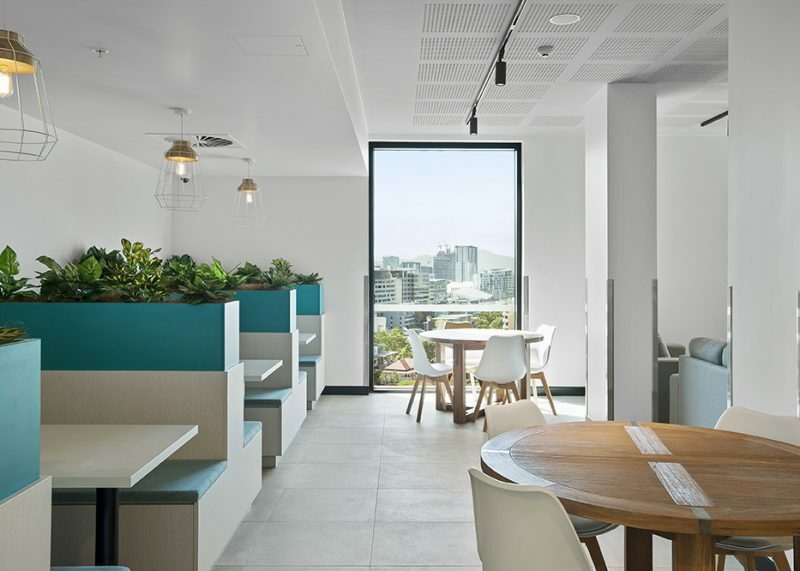 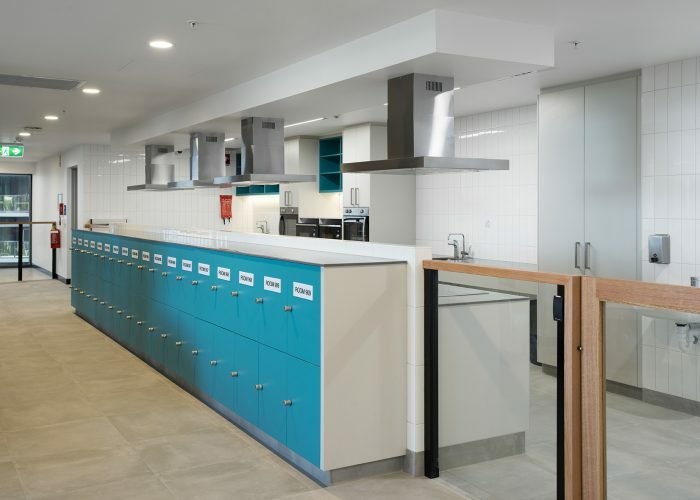 The fitout of Level 9 at Ronald McDonald House South Brisbane provides new homes, play and living spaces for those supporting their loved ones. The Ronald McDonald House charity provides a home away from home for seriously ill children and their families. 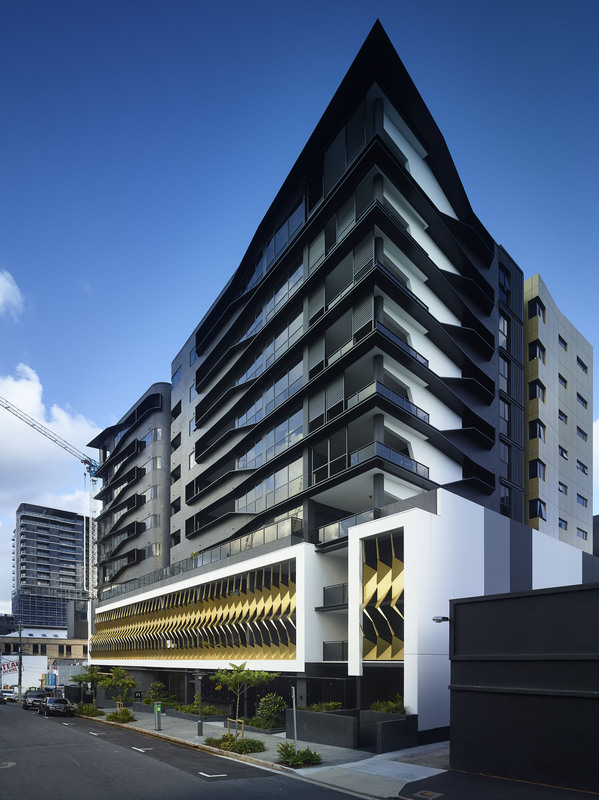 In South Brisbane they have built a 10-storey complex adjacent the Mater Children’s Hospital, which is slowly being fitted out floor by floor as they get funding. 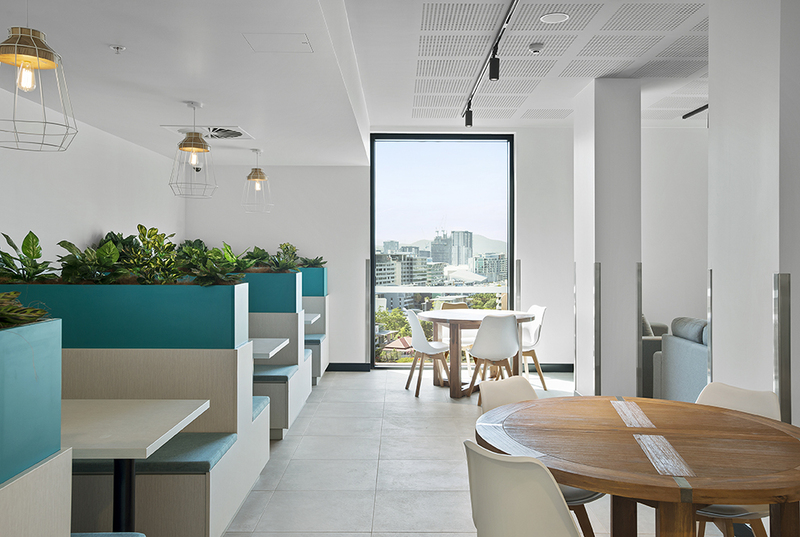 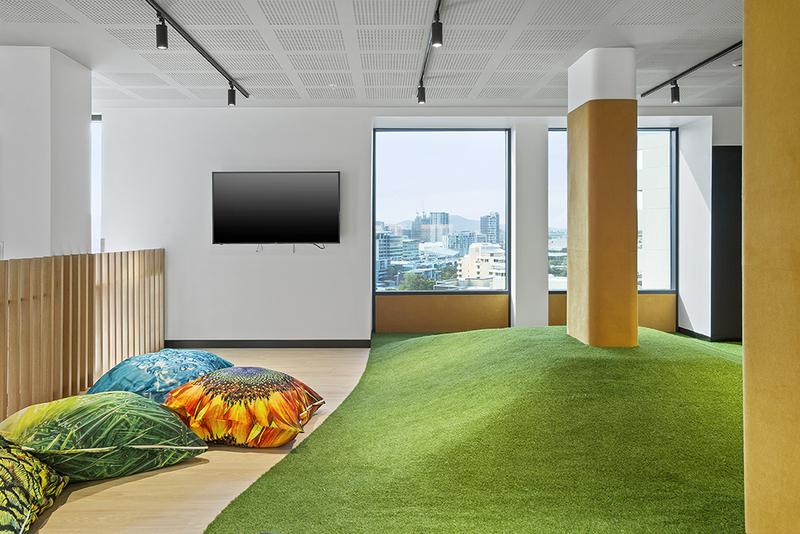 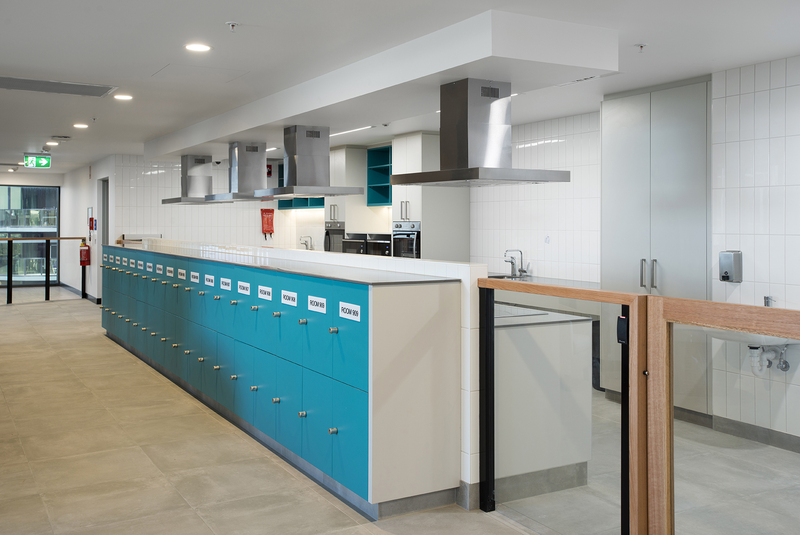 Ellivo was commissioned to design the fitout for Level 9, which was destined to become a home for the families that need to stay longer. 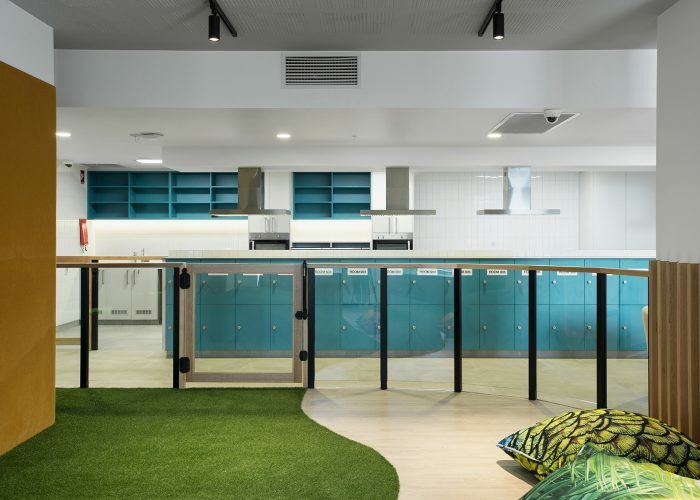 The project consists of nine accommodation rooms – some with interconnecting doors to house larger families – as well as communal kitchen facilities and a dining area, a large fenced play area, and a private function room which can be booked for family functions. 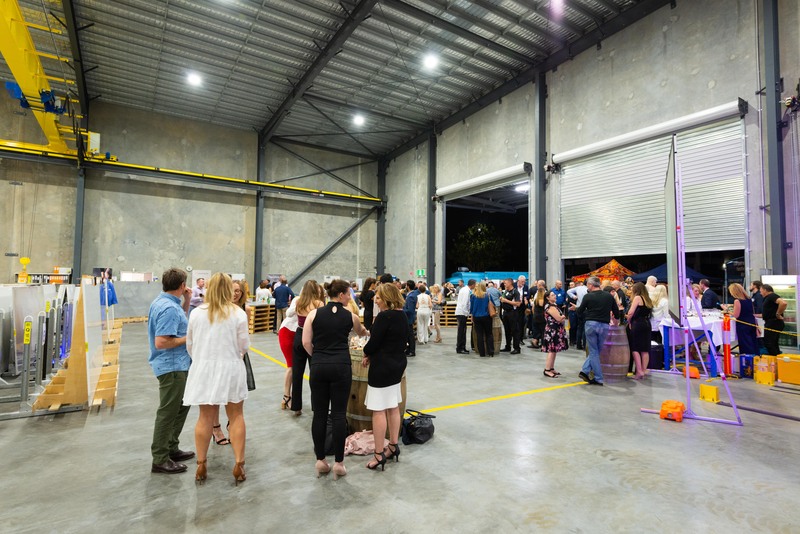 The project received funding from various charities and fundraising efforts – among them, the annual Chain Reaction Challenge Foundation bike ride contributed a large amount. 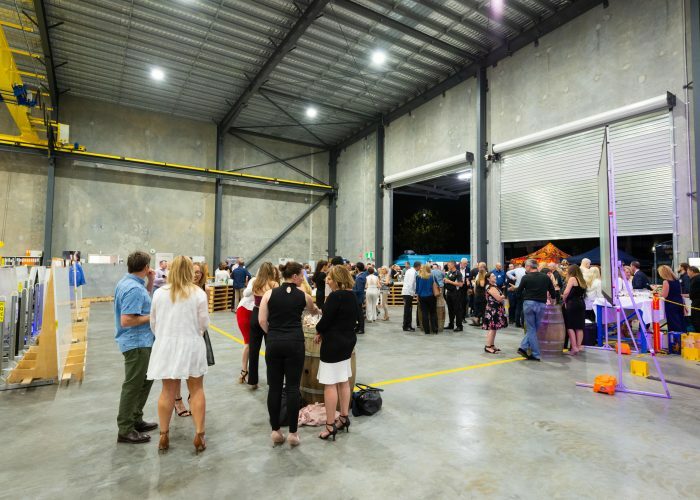 Two of the riders and fundraisers for this were Ellivians Mason and Jen, who rode 1000 km from Sydney to Brisbane in 2017. Nero, meaning black in Italian, inspires the dark personality of the building’s overall expression and resulting material palette. 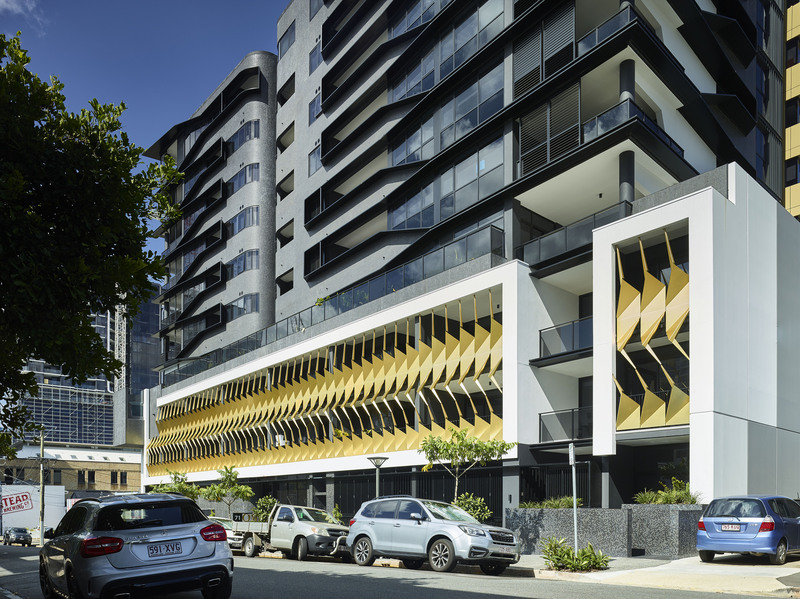 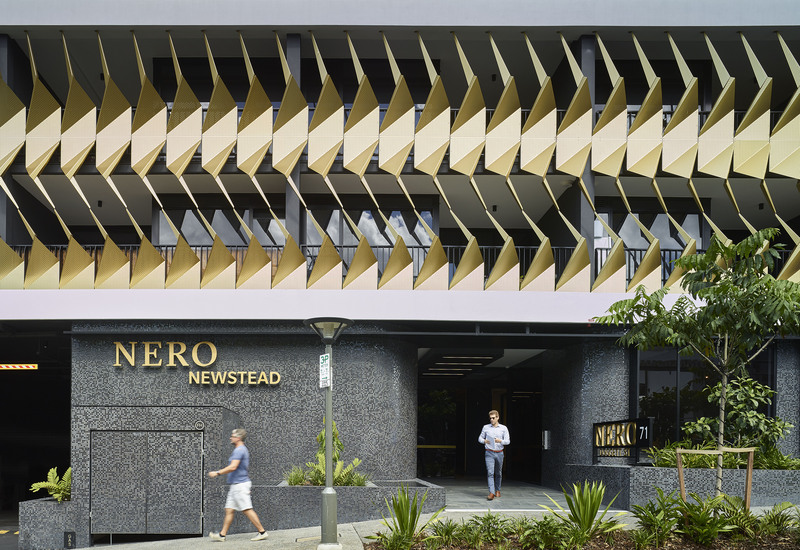 Nero Apartments offers a high-quality living environment within the rapidly evolving Newstead neighbourhood. 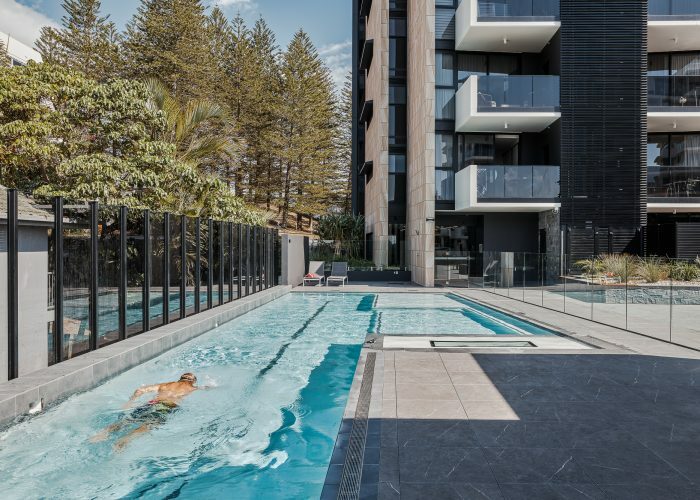 Located within close proximity to the newly developed and growing Gasometer retail precinct, the development benefits from an abundance of recreation and amenity options for its residents. 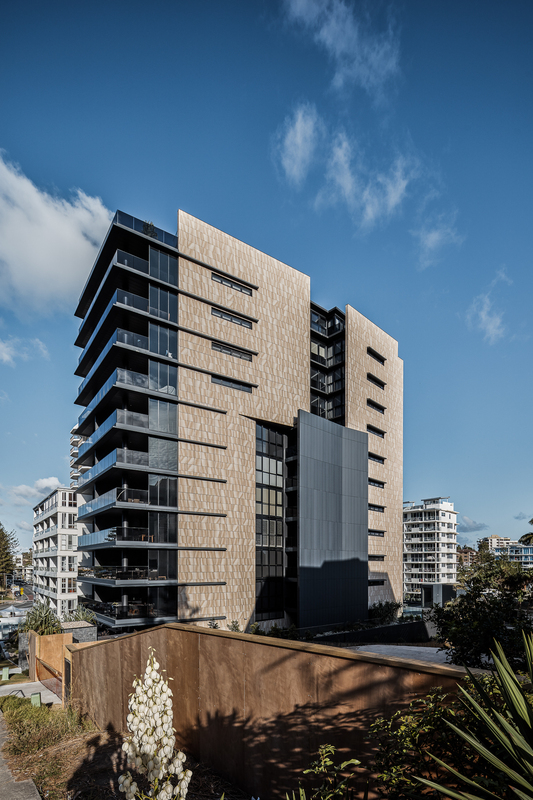 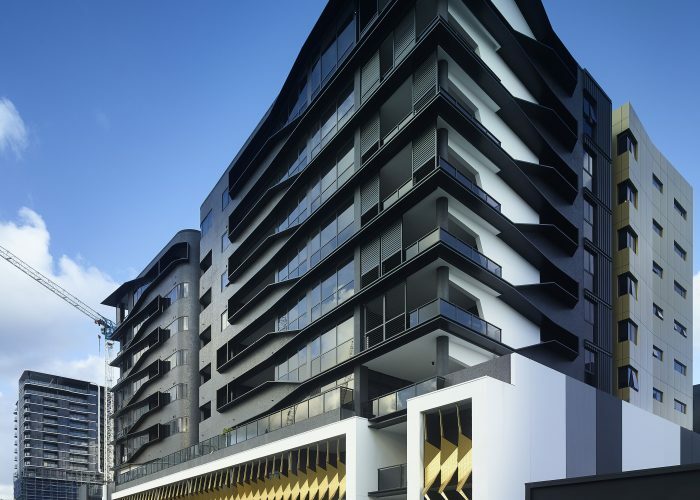 Positioned amongst a multitude of high-density apartment buildings, Nero seeks to stand out from the crowd and strives to offer something a little different. 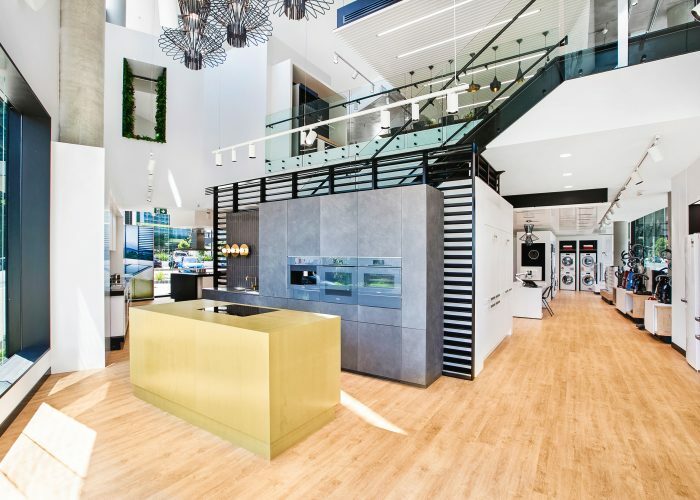 Residents are offered concierge type facilities to welcome them home, as well as apartment technologies more akin to hotel accommodation. 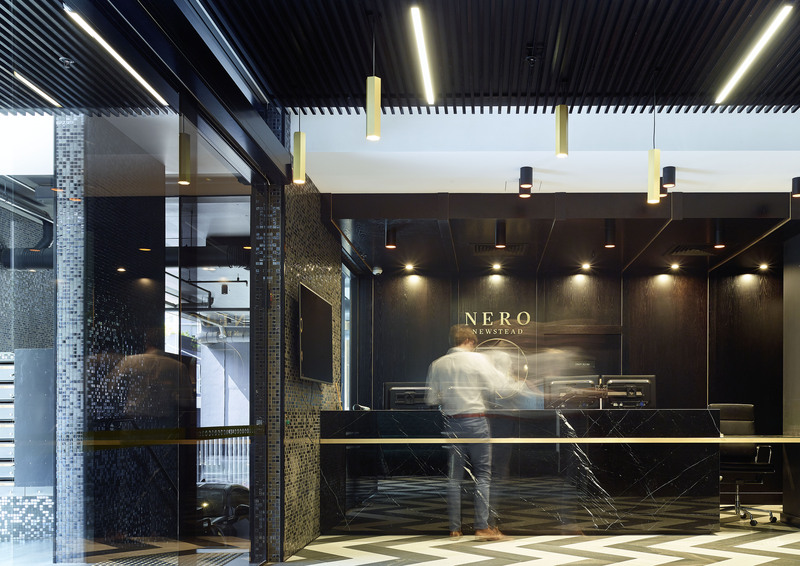 Nero, meaning black in Italian, inspires the dark personality of the building’s overall expression and resulting material palette. 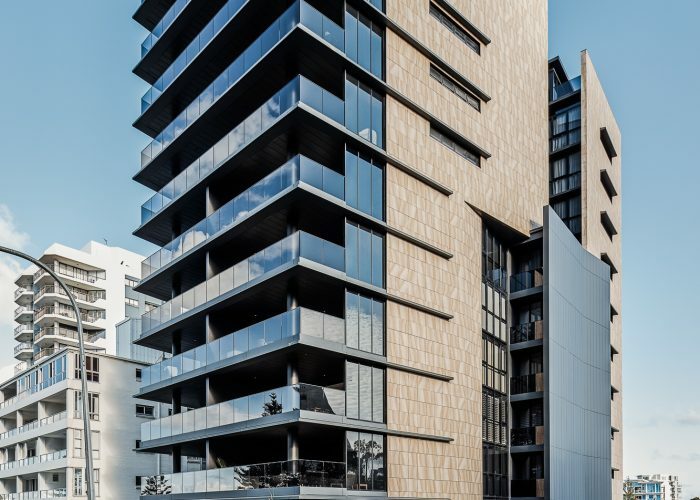 The external form of the building creates a homogeneous façade that conceals the apartment balconies behind it. 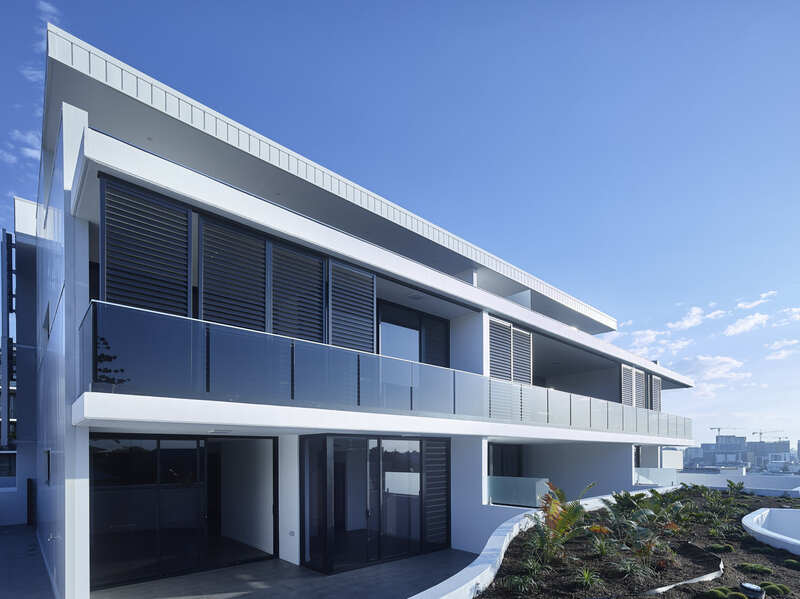 This is a direct response to the due west orientation of the apartments, balancing solar protection without limiting access to light and views. 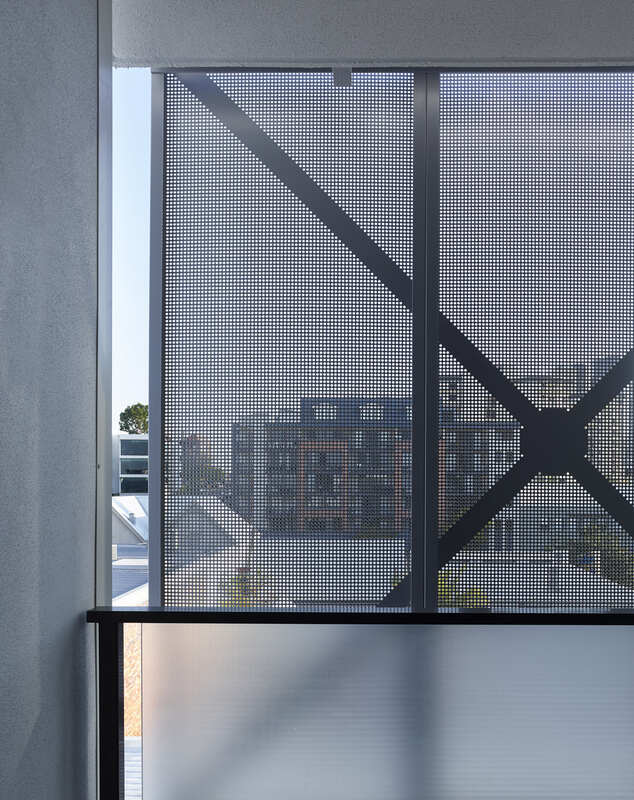 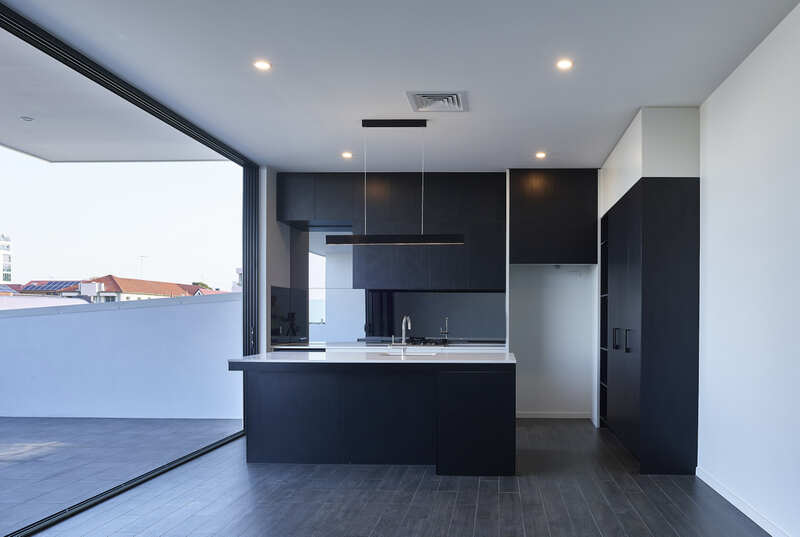 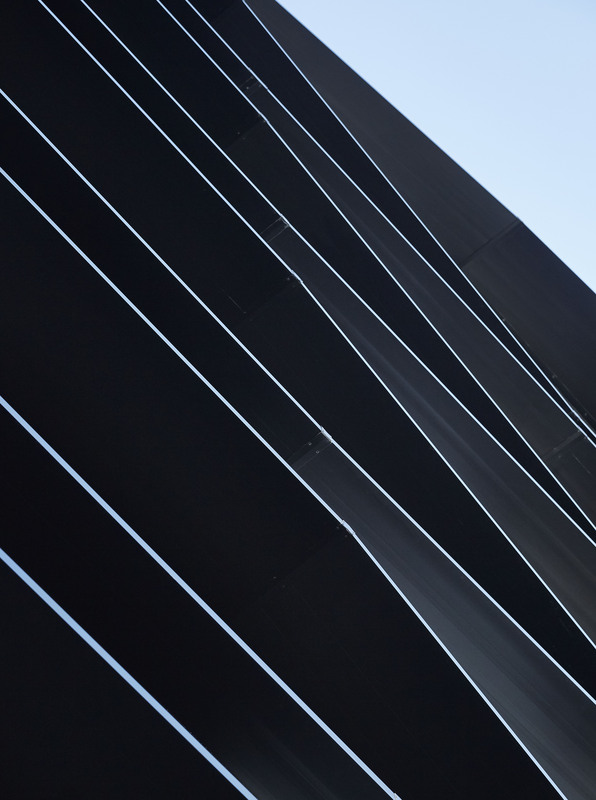 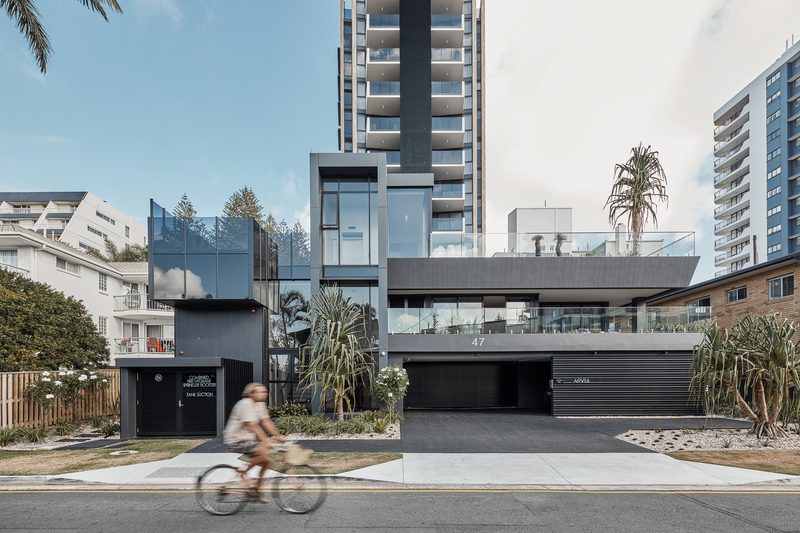 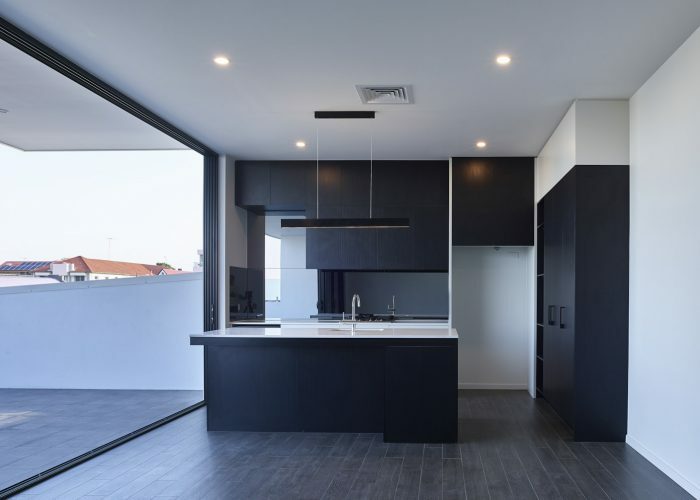 Clad in black tile, aluminium cladding and screening, the development has a sleek and timeless appearance. 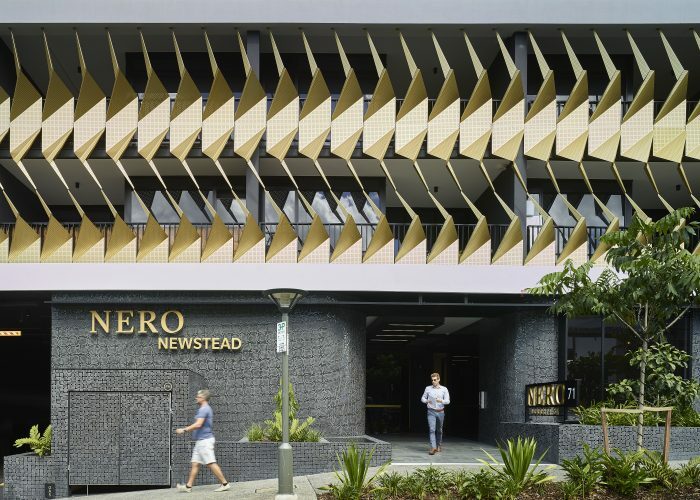 The folded gold screening to the lower podium levels has many roles; it provides solar protection towards the west while folding open towards the north, it provides privacy up to the balustrade height, creates foreground interest where there are no views, and forms a sculptural contribution to the streetscape. We focused on creating a timeless built form, minimising the amount of rendered surfaces was important in delivering a building that aims to look admirable long into the future. 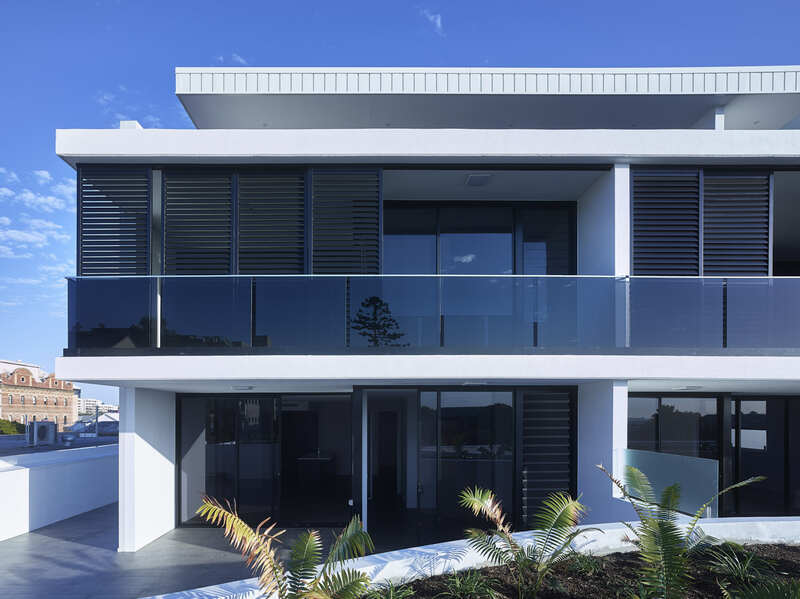 Rainbow Bay is an evolving beachfront boulevard of Coolangatta. 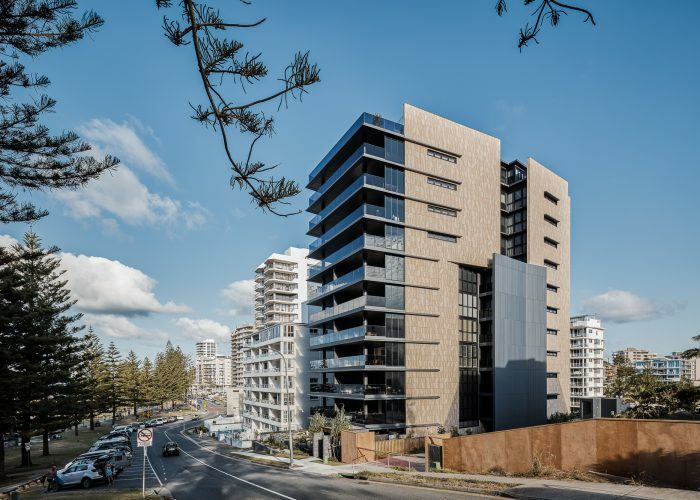 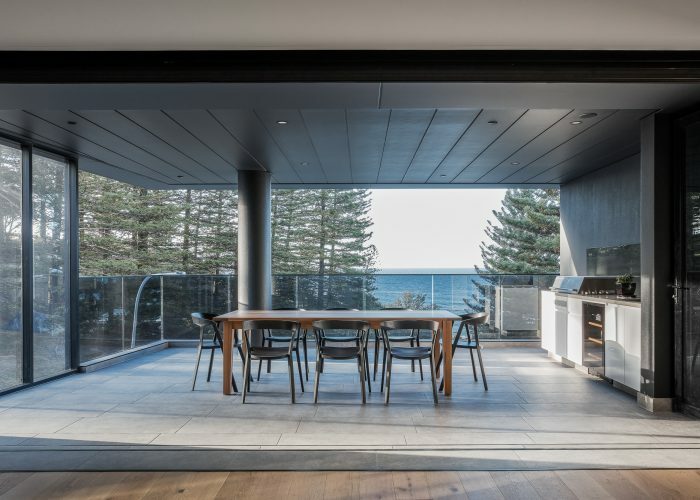 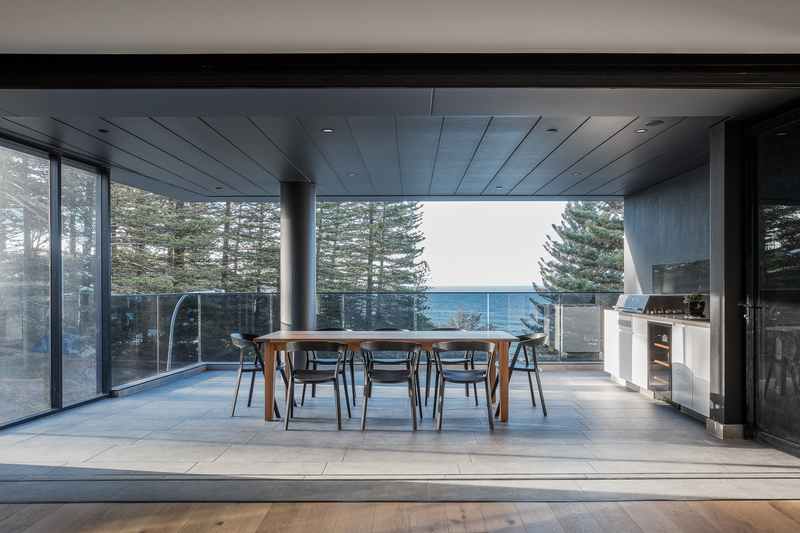 We partnered with our long-term client Aspect Property Group, to deliver a catalyst of exclusive living which reflects the unique assets of the site, in particular the direct proximity to Rainbow Bay beach. 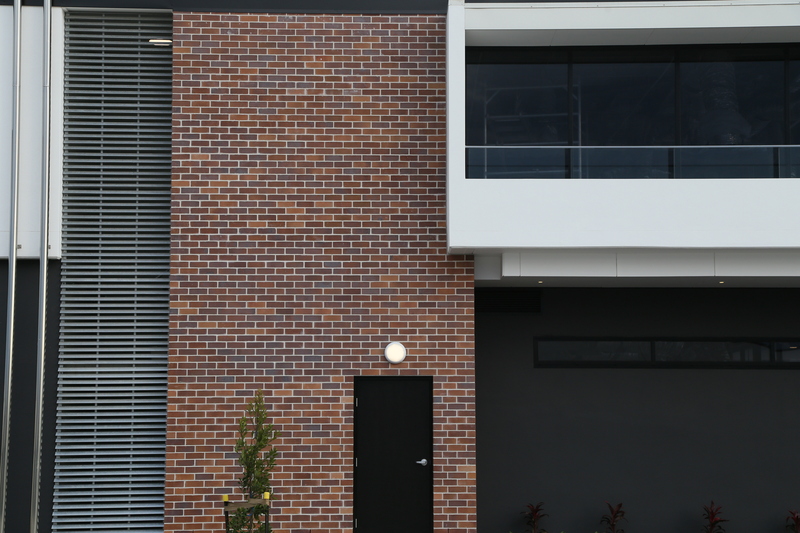 Our client sought to deliver to a niche of down-sizing owner-occupiers looking for a premium product. 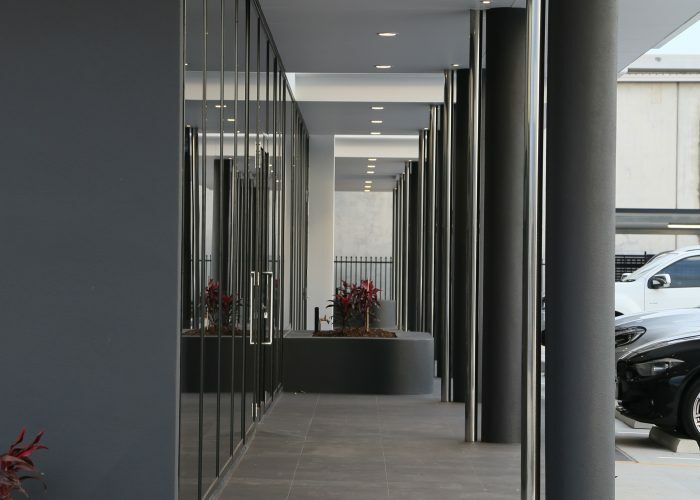 We focused on creating a timeless built form, minimising the amount of rendered surfaces was important in delivering a building that aims to look admirable long into the future. 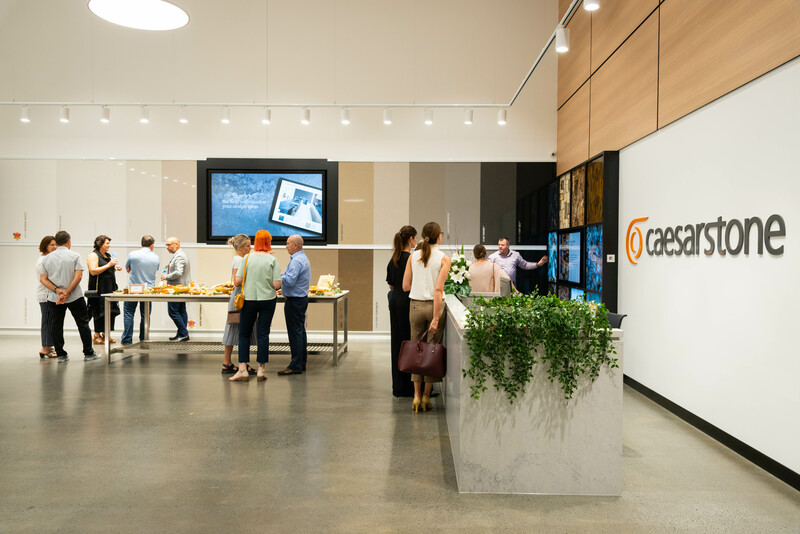 It’s not just about the brand, the product or the service (it’s about creating experiences that put a smile on the dial). 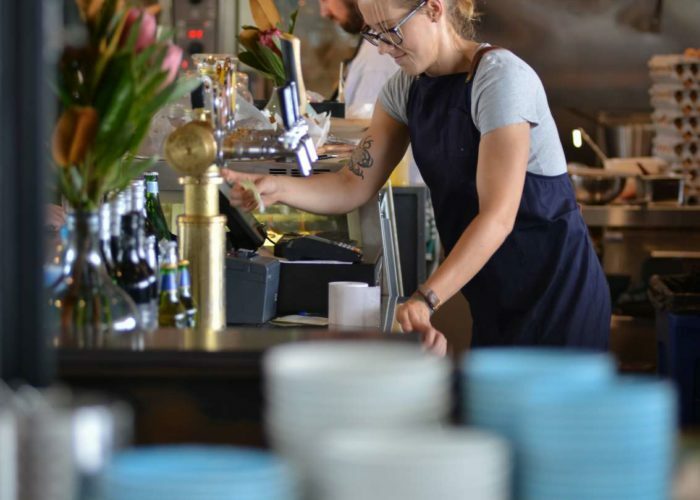 (Our challenge) How might we create a feeling of delight the moment they begin their journey – when they’re finding a car park, when make their first steps toward their destination, when they’re waiting in line for their coffee, or browsing the aisle? 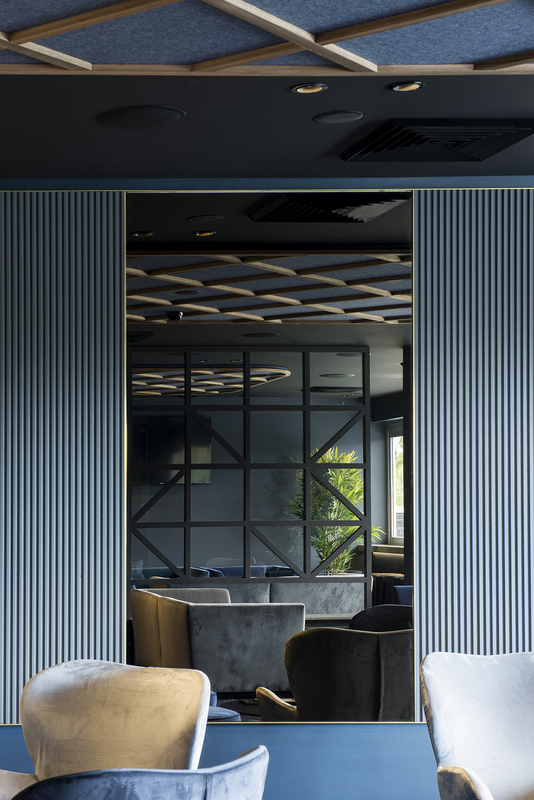 Warm, reflective materials are combined with luxurious velvet and brass elements to create a truly unique and intimate venue for various events and audiences. 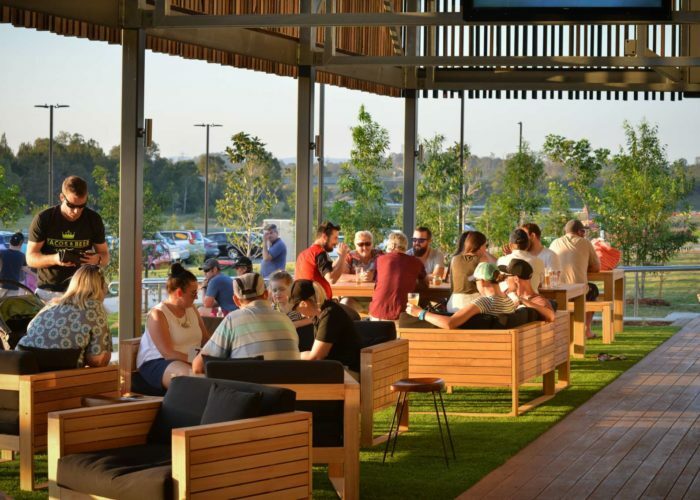 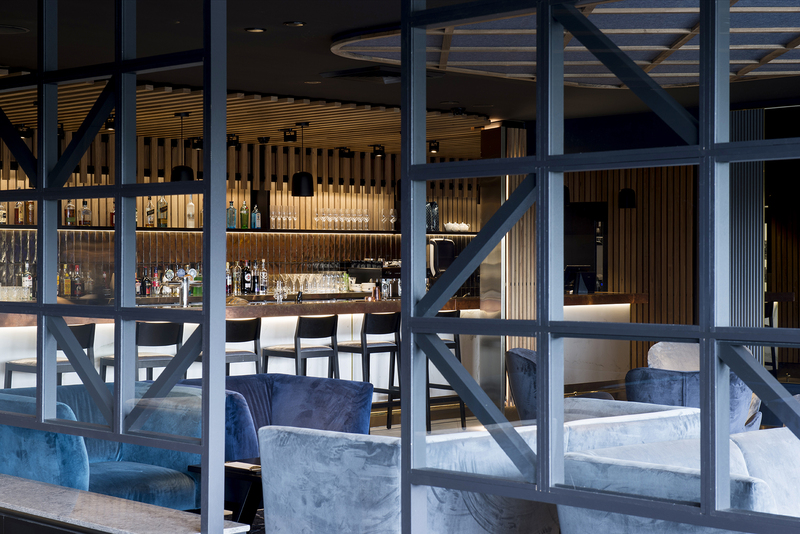 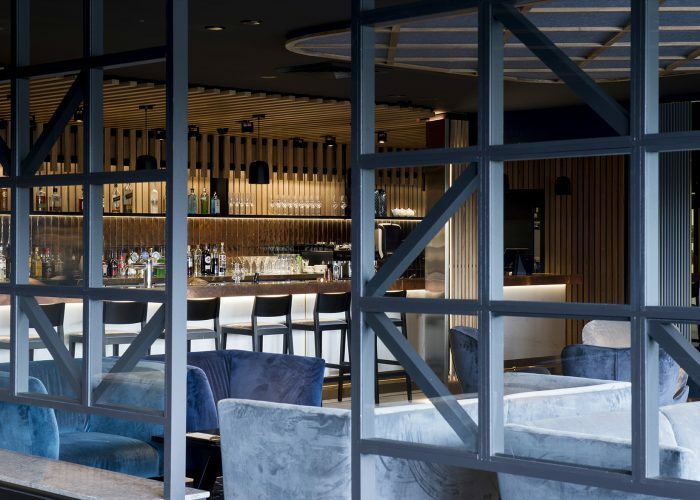 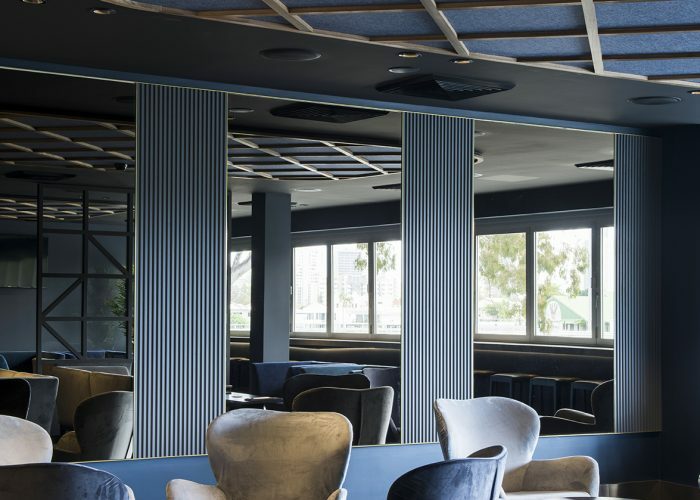 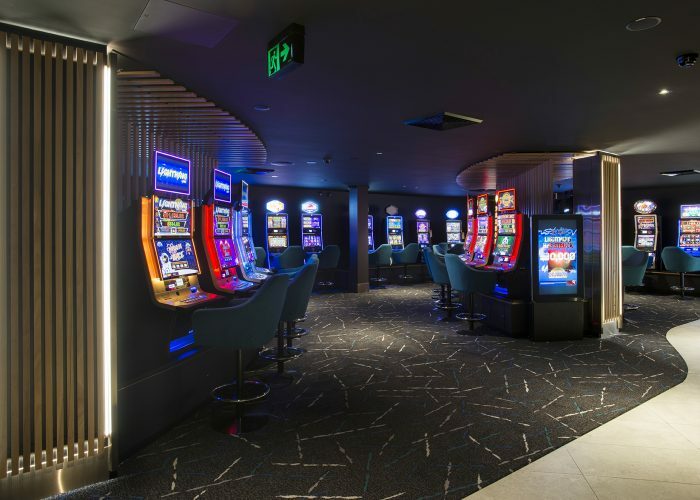 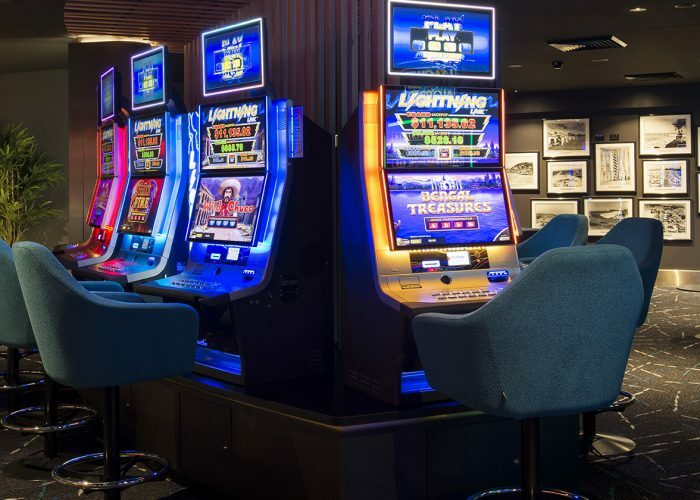 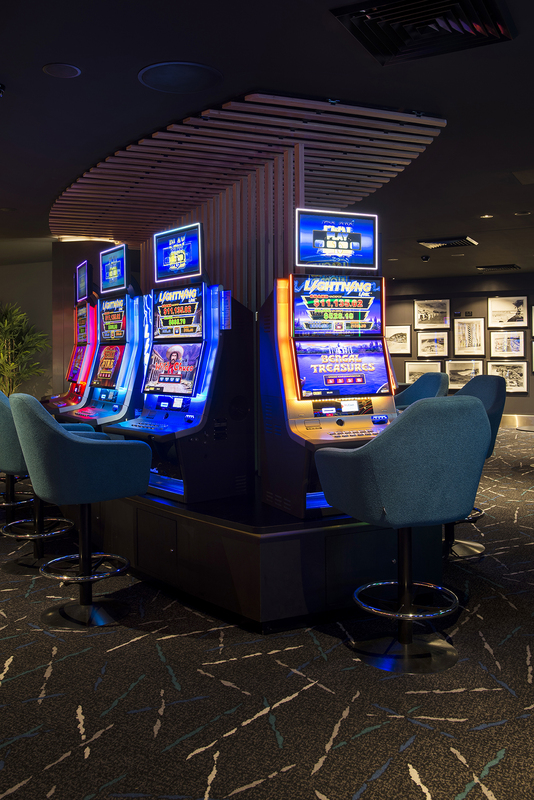 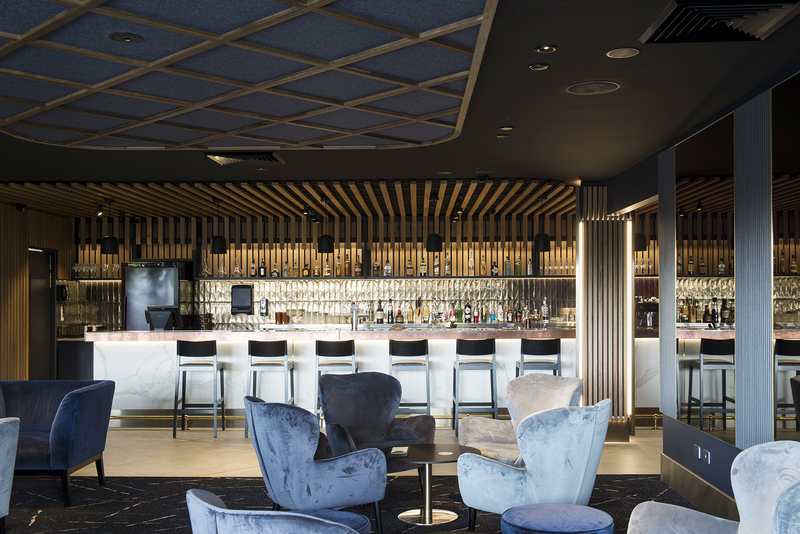 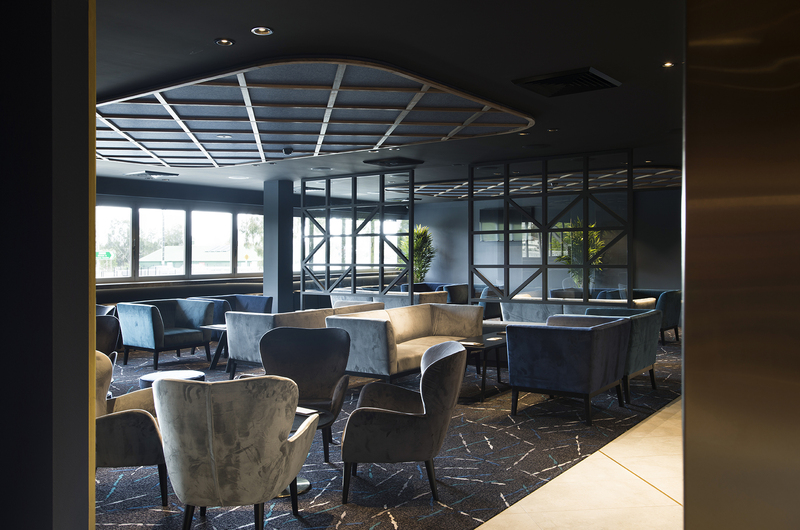 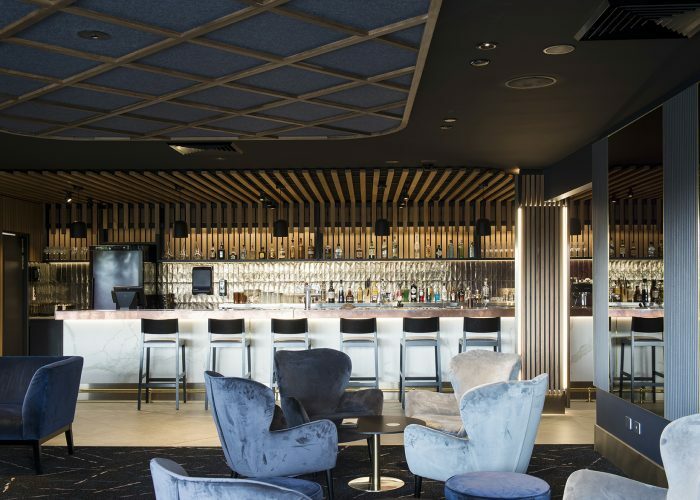 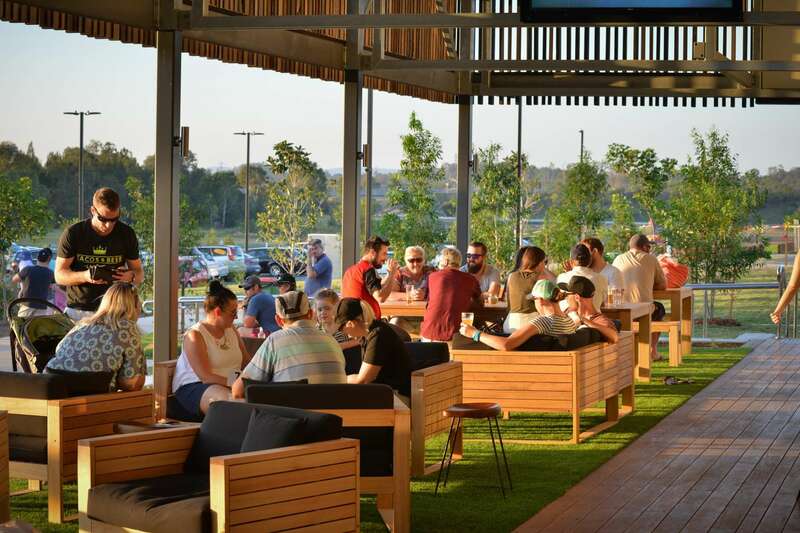 Situated on the second floor of the One50 Public House in Bundall, the new gaming and cocktail lounge offers patrons a sophisticated evening venue with views of the Gold Coast skyline. 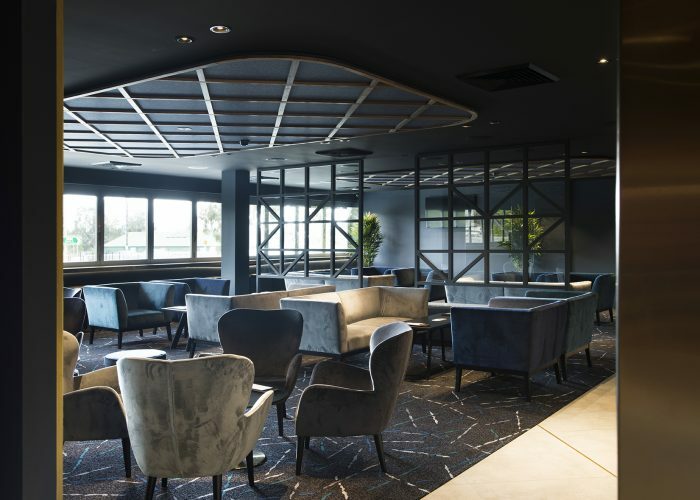 The client wanted to improve the experience of their gaming lounge and expand their entertainment options, so the existing gaming lounge was relocated to the upper level, and accompanied by a new cocktail lounge, private dining room and a bar and kitchen to service the new spaces. 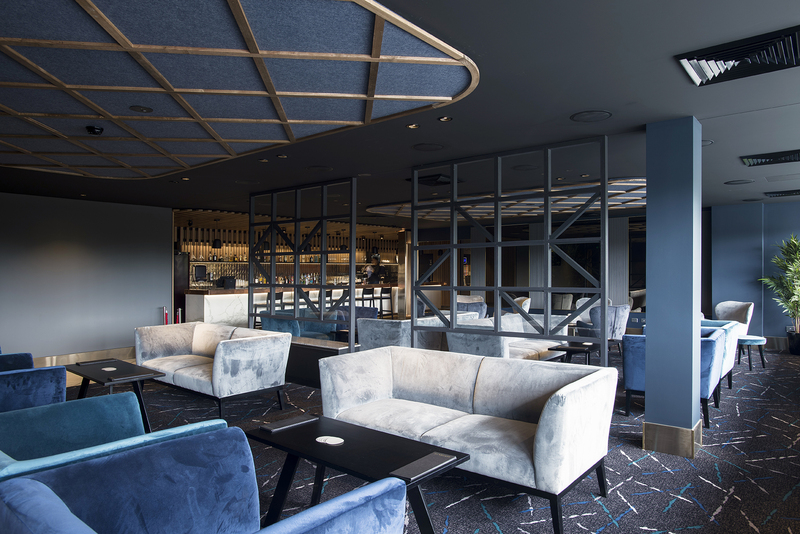 Designed to cater for various events and audiences, the lounge offers various spaces that each have a different feel. 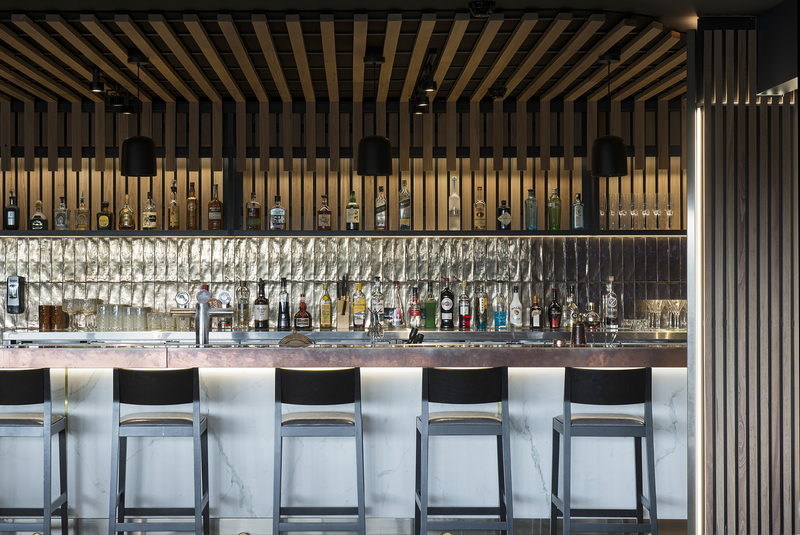 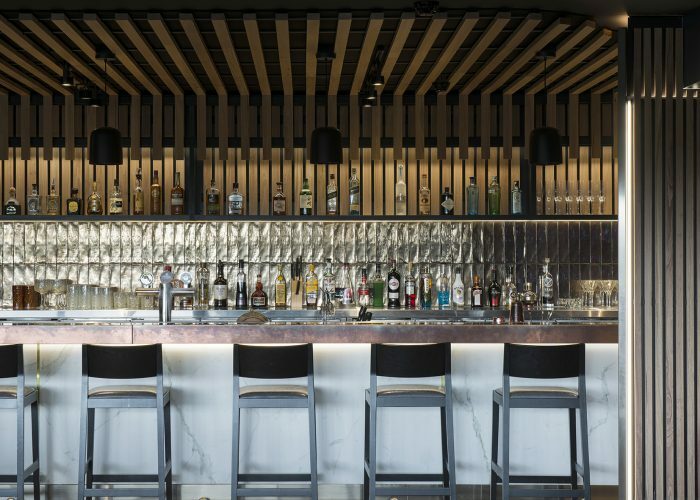 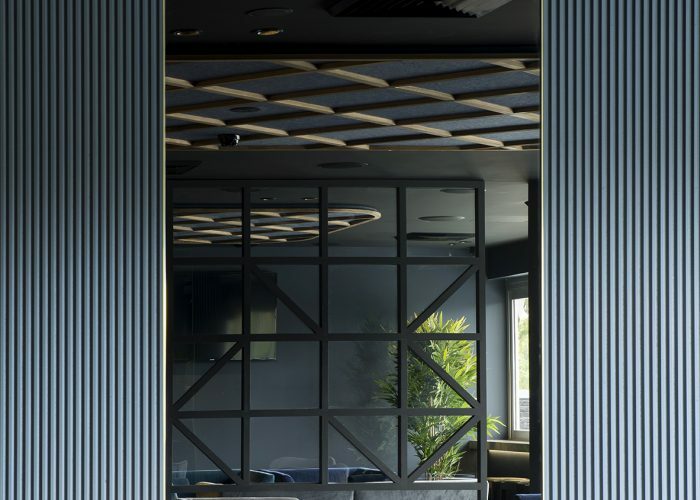 Finely-detailed joinery elements divide the gaming and cocktail lounges; while each area has a variation on the fitout’s overall approach to lighting and finishes to create distinct spaces within the larger floor plan. 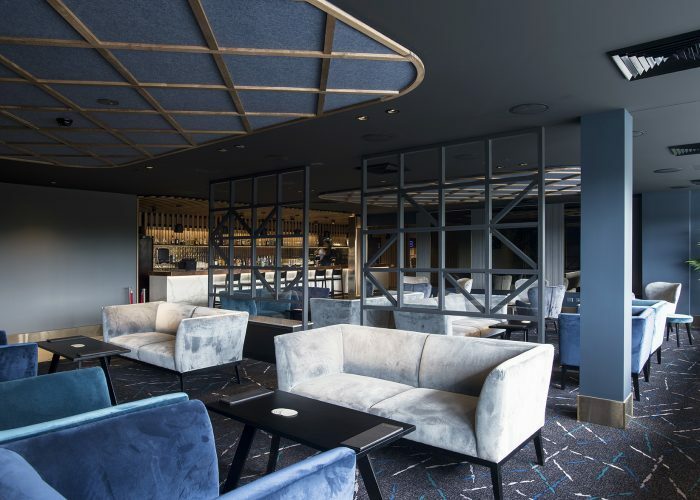 The cocktail lounge is complete with luxurious, plush velvet seating and dimmed lighting, inviting guests to relax and enjoy the quiet intimacy. 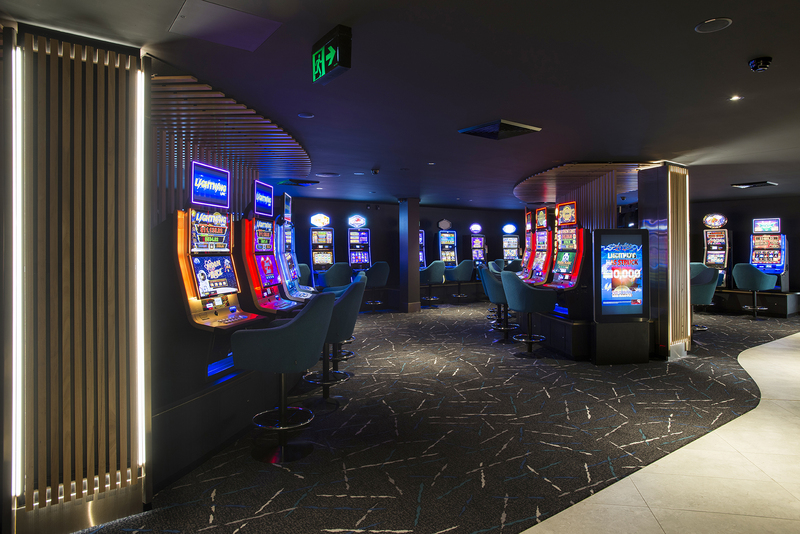 The gaming area on the other side makes use of timber batten screens, dark coloured materials and full-height timber joinery to create smaller, quiet zones among the bright flashing lights. 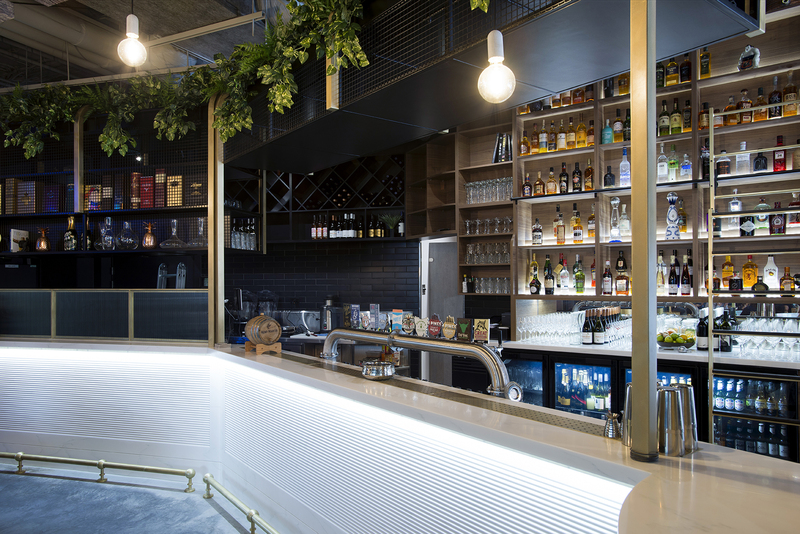 Supporting both these spaces is the bar – the heart of the venue. 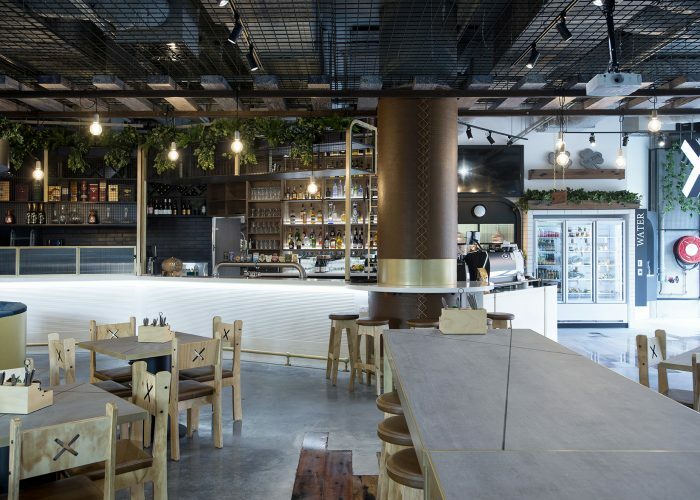 The materiality and lighting here is distinct, warm and reflective with a copper counter top, timber batten detailing and shimmering splashback tiles. 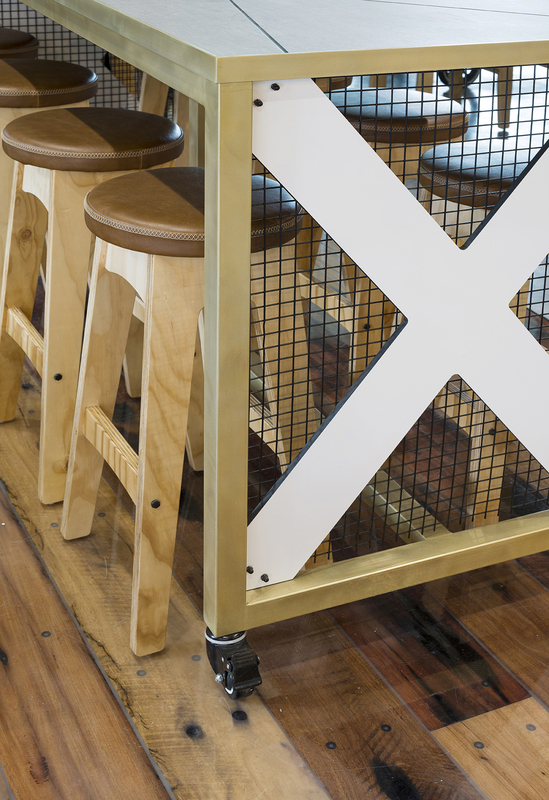 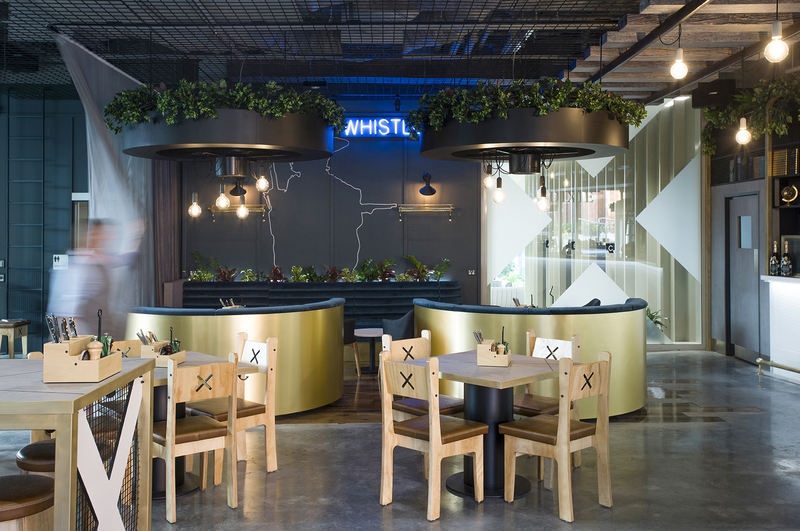 The clients decided on ‘The Whistle Dixie’ for the name of this café/bar fitout – in reference to a quote from a Clint Eastwood movie. 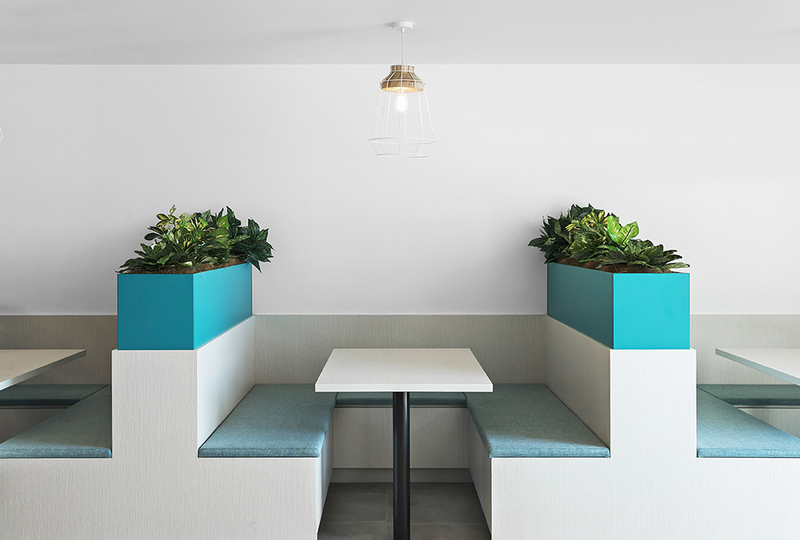 This playfulness set the tone for the design, and we worked with the client to inject fun into everything we did. 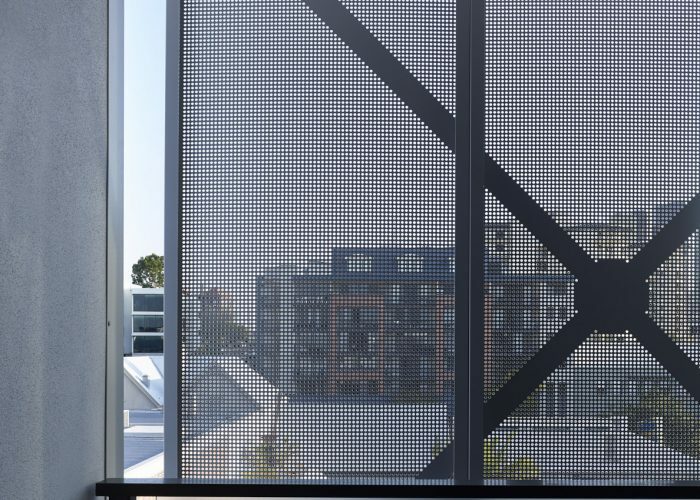 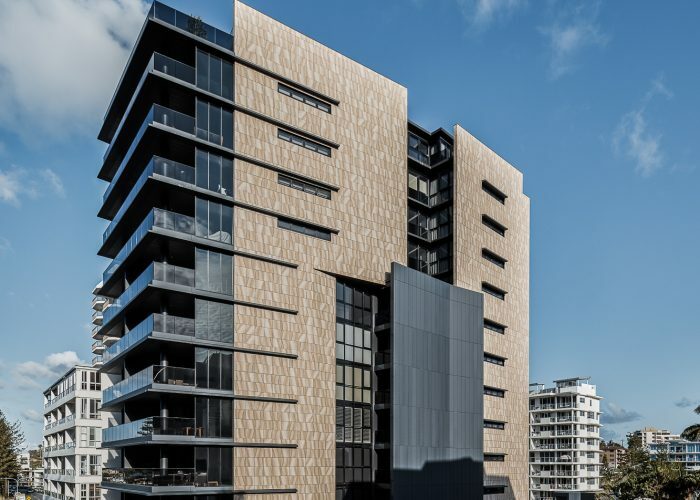 The Whistle Dixie sits on the ground floor of Aurizon’s sleek 15-storey office building in the Fortitude Valley. 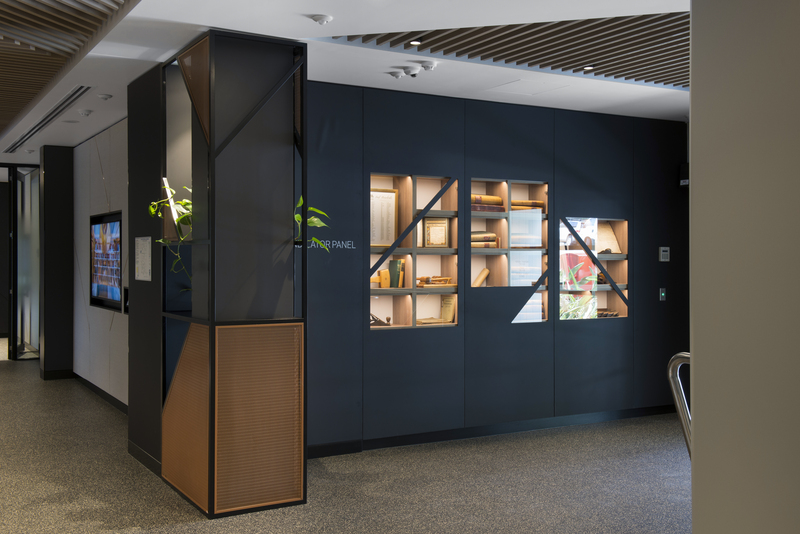 In a playful nod to the building’s main occupant – Australia’s largest rail freight operator – we used trains as our departure point for inspiration. 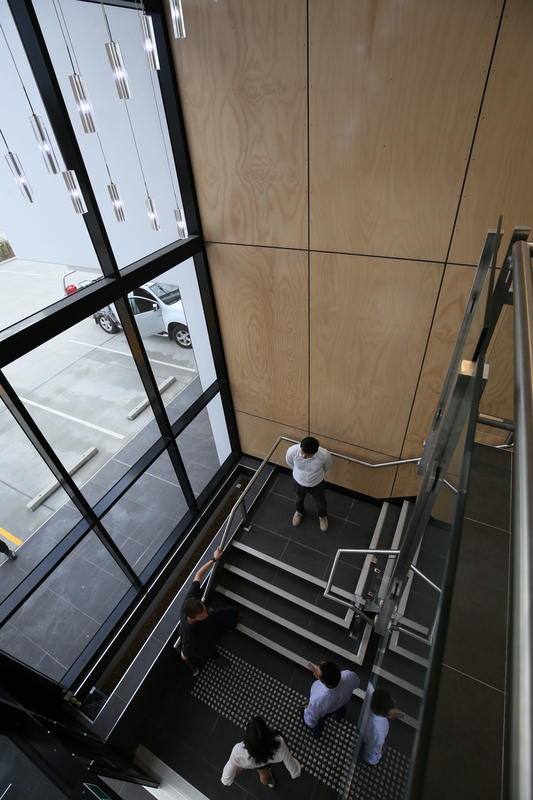 The main counter represents derailed carriages with train tracks hung above, a light box portraying the ‘X’ train stop sign is seen in the front window, and the floors feature recycled timber sleepers that have been recessed into the concrete. 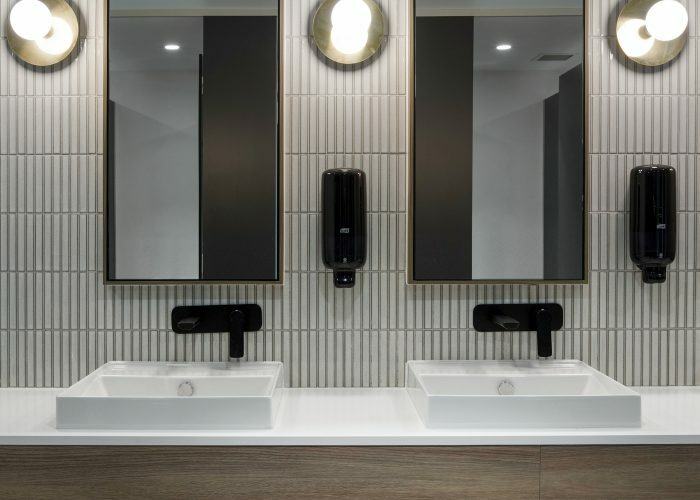 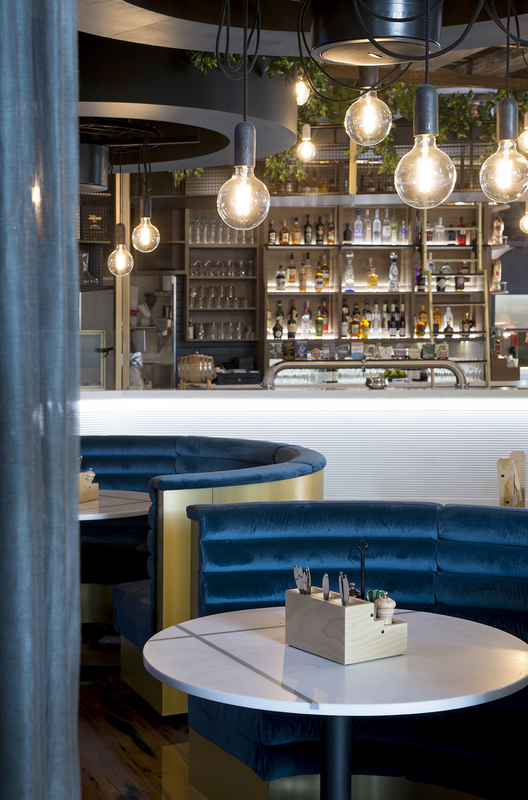 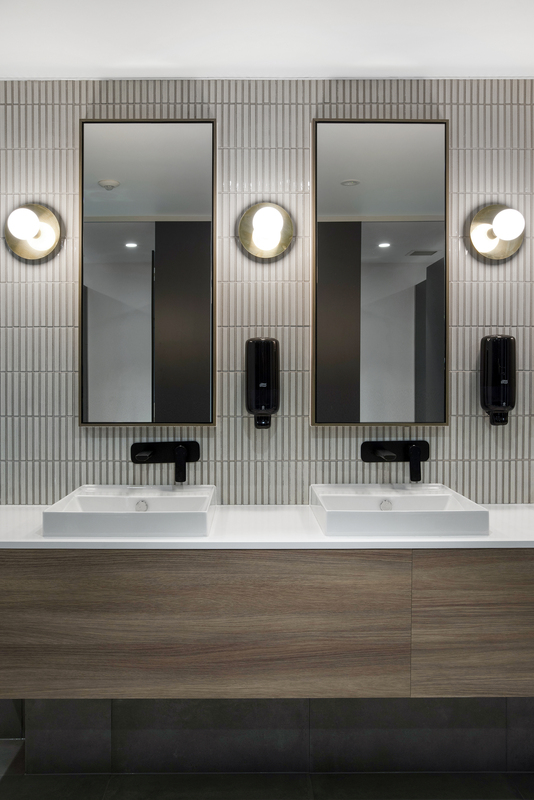 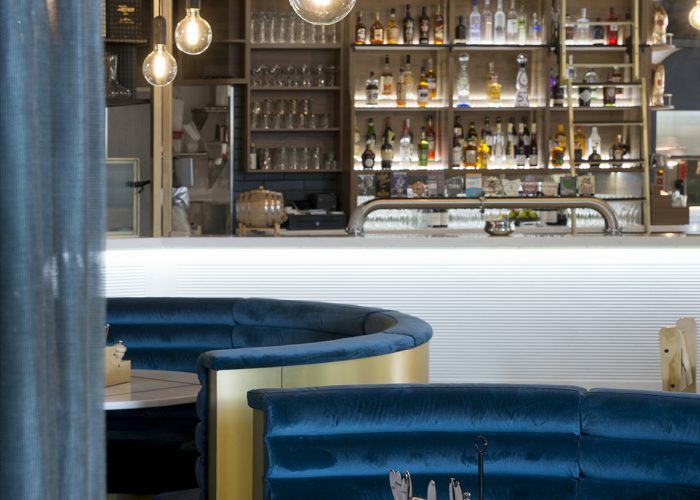 These touches are mixed with luxurious, high-quality finishes that help to create a space that can cater for patrons seamlessly from the early morning to the late evening. 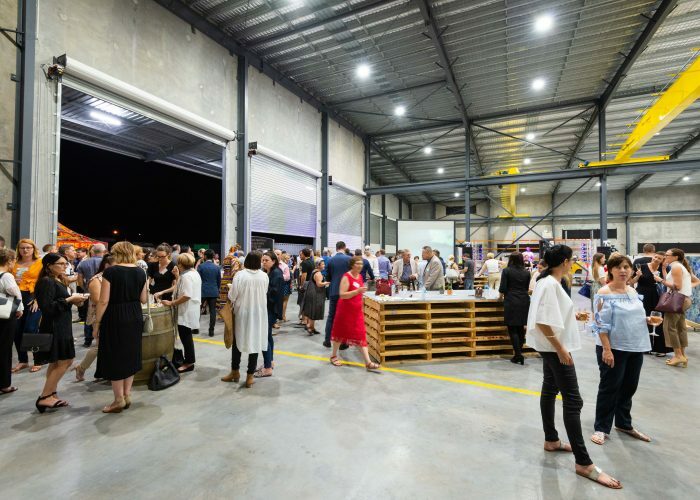 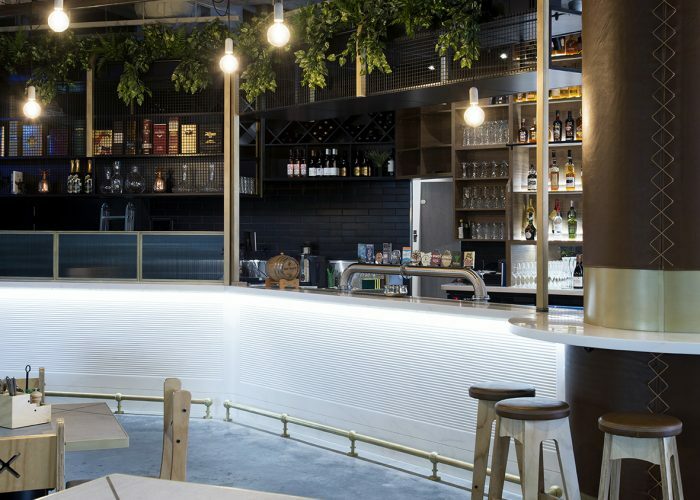 The client wanted the space to be flexible in how it could be used through the day – they needed it to be light and open during the morning when the venue was a café, while also being a warm and intimate venue come nightfall. 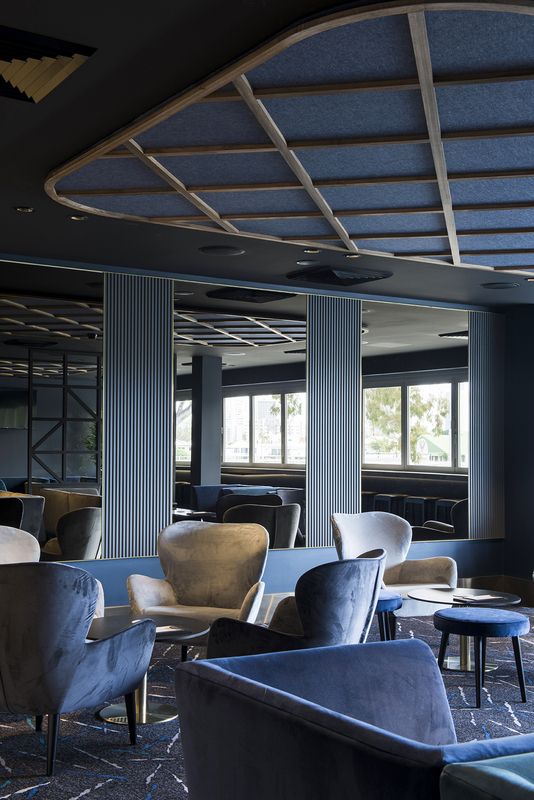 We achieved this with large, mobile, curved velvet lounges under high-level planting, subtle leather and brass touches, and full-length curtains that allow users to create smaller function spaces when needed. 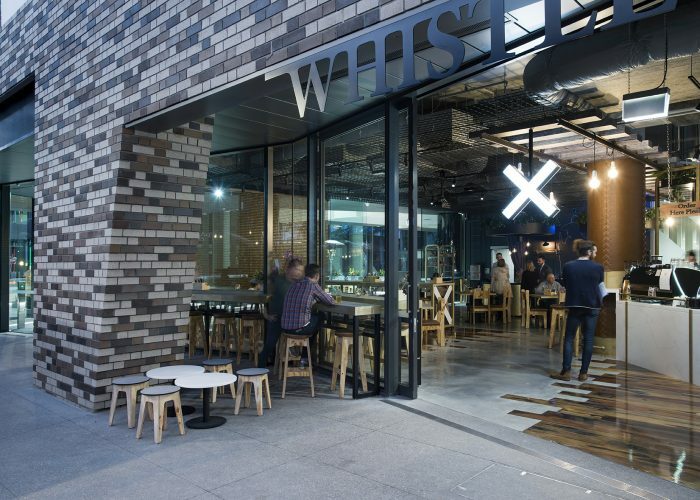 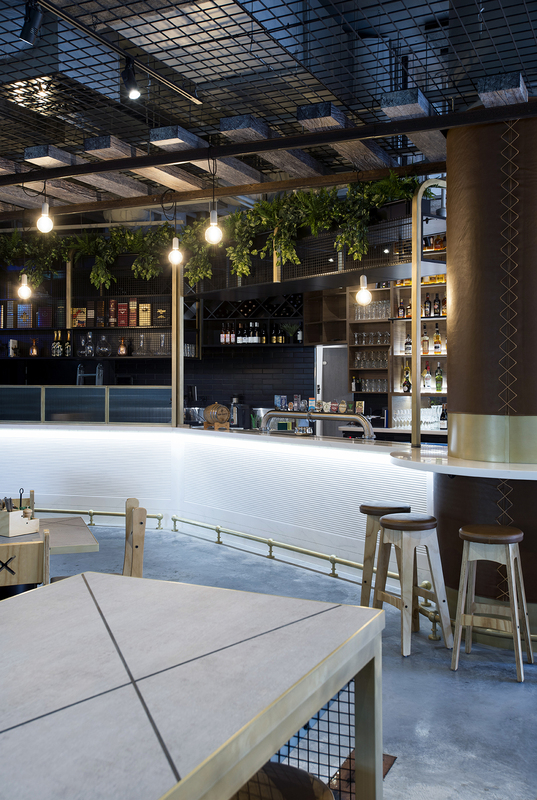 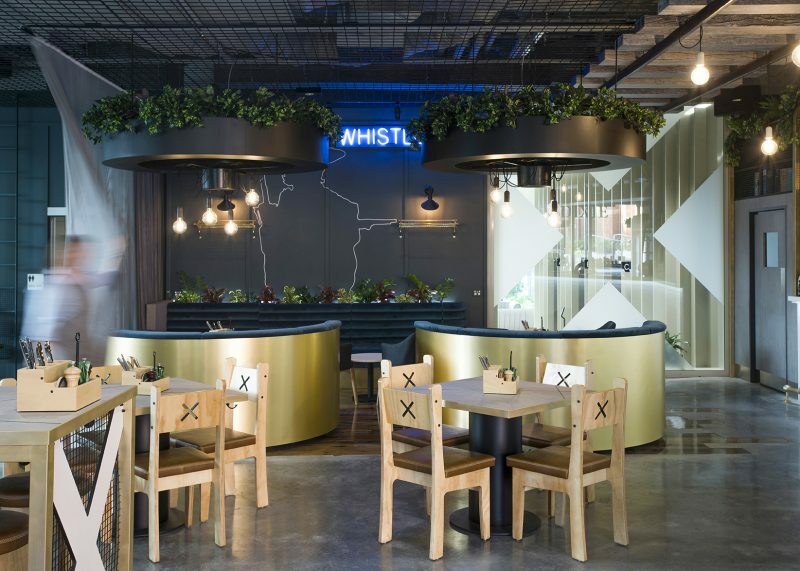 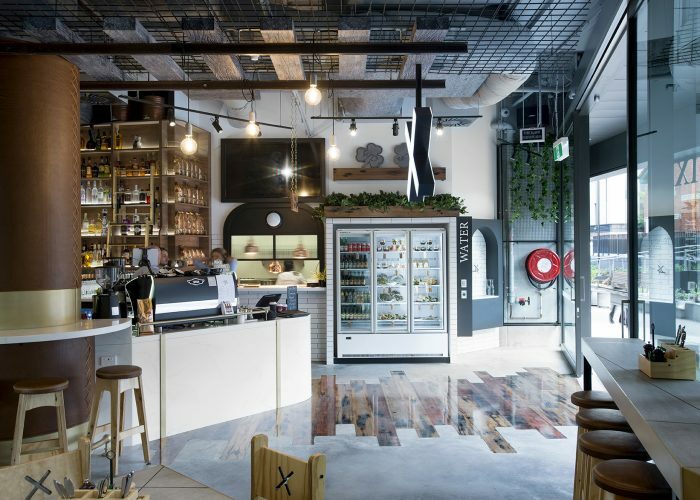 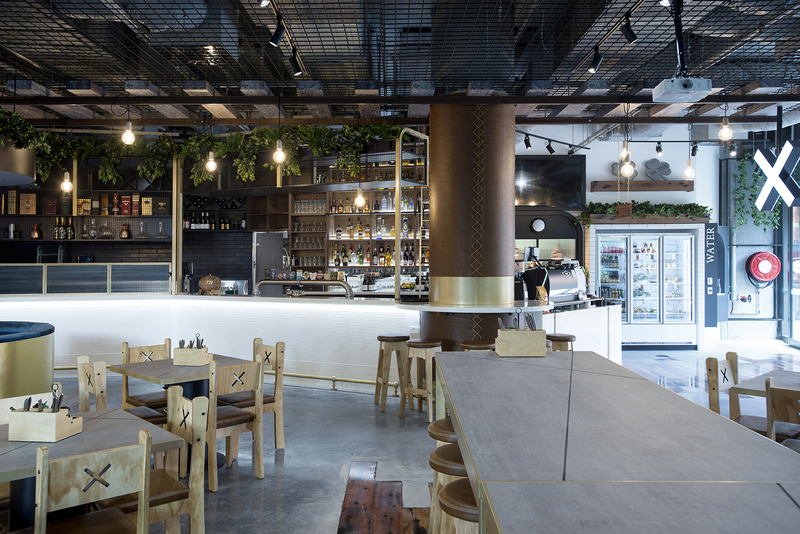 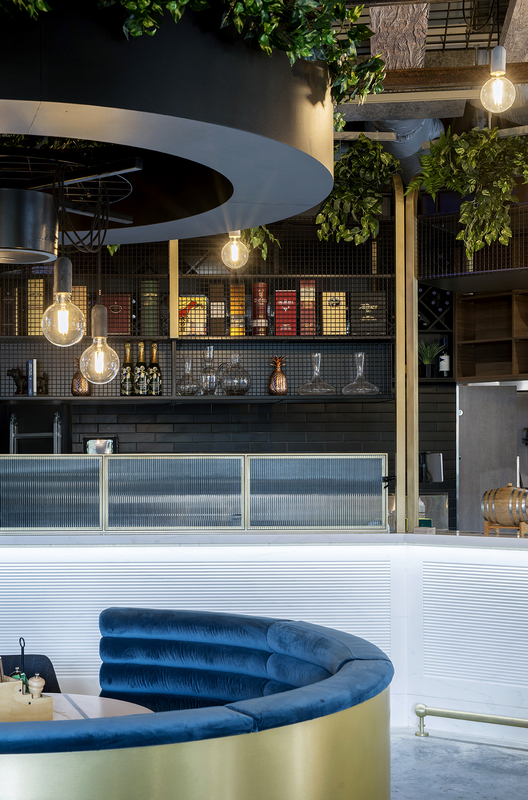 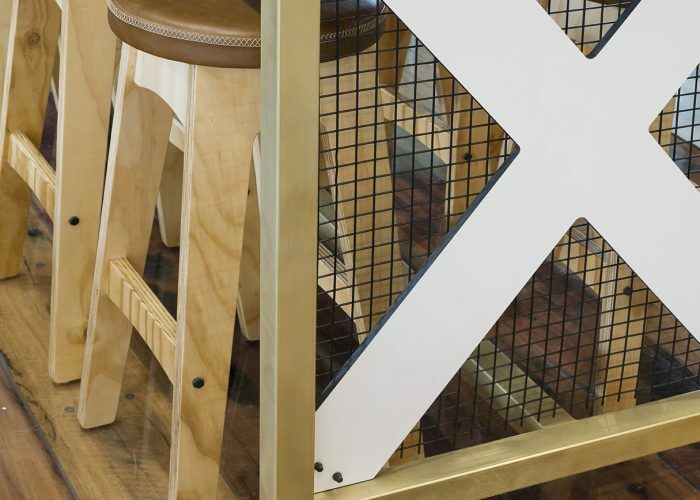 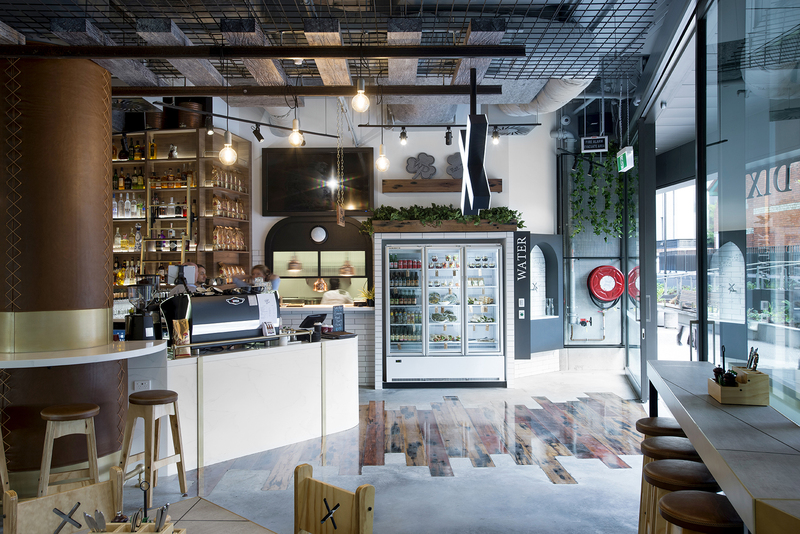 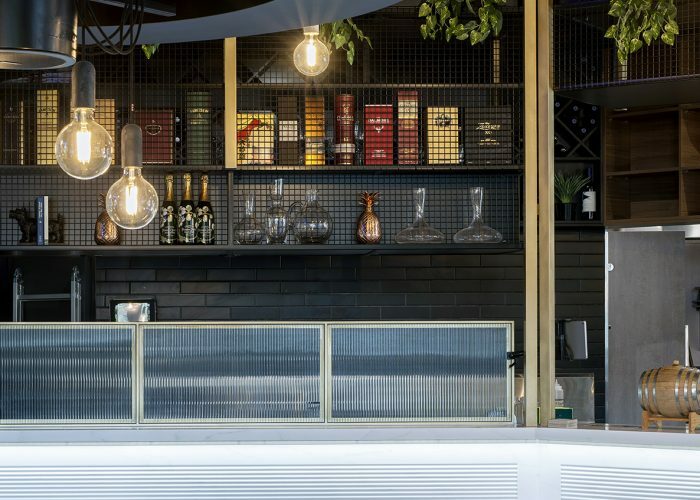 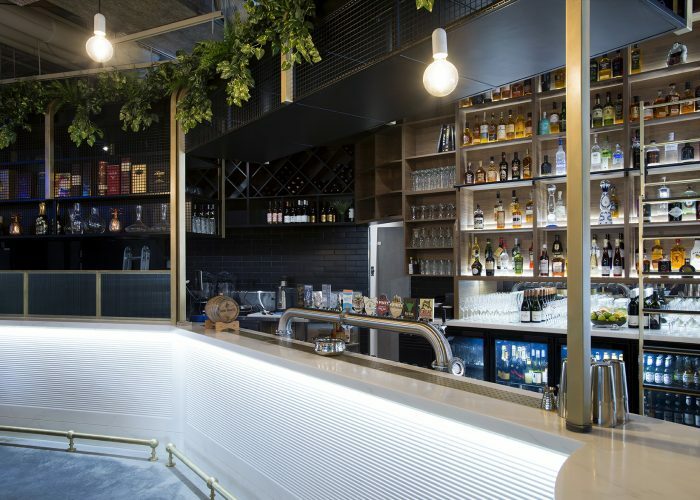 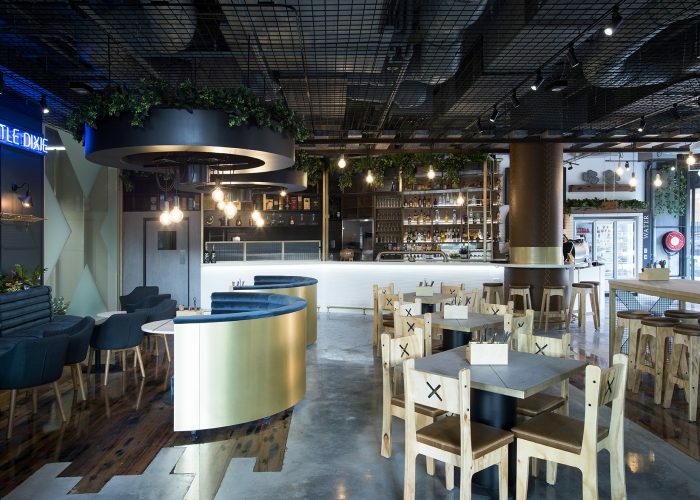 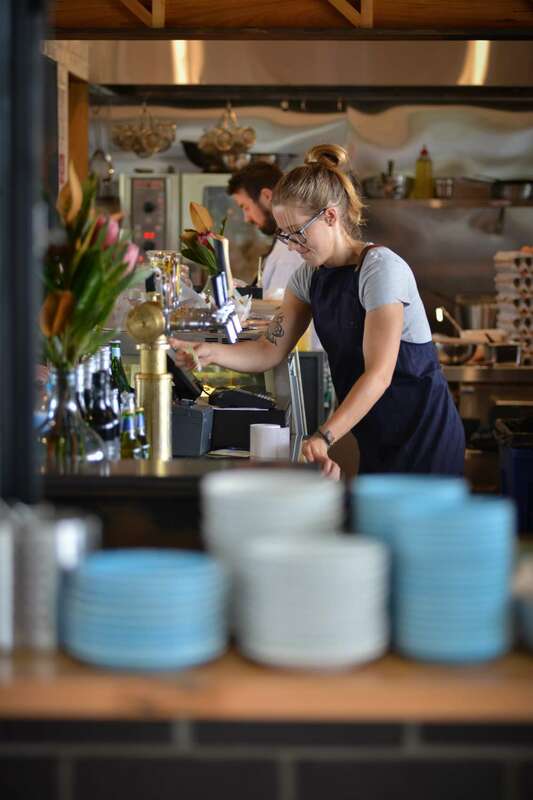 The name ‘Whistle Dixie’ came from a Clint Eastwood movie, which injected some fun into the fitout - not just in name but also in touches throughout all the branding. 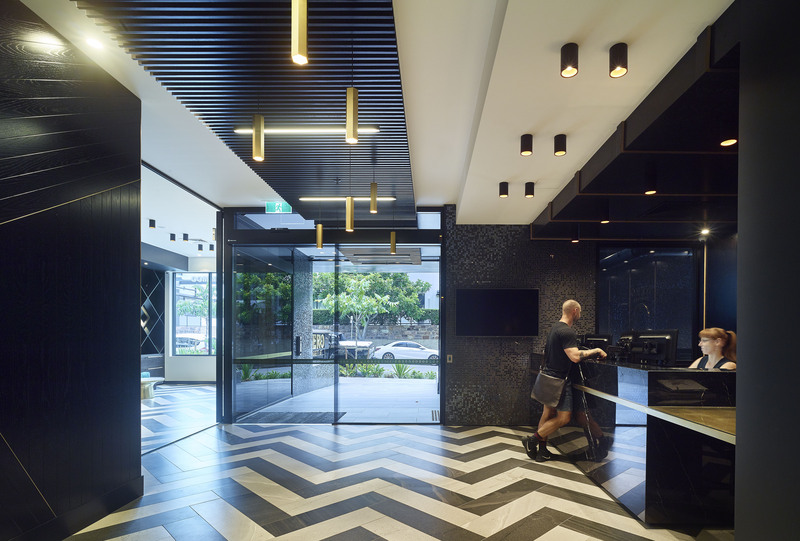 This was a true reflection of the clients’ attitude, which we were able to highlight as we took them on an identity & branding journey. 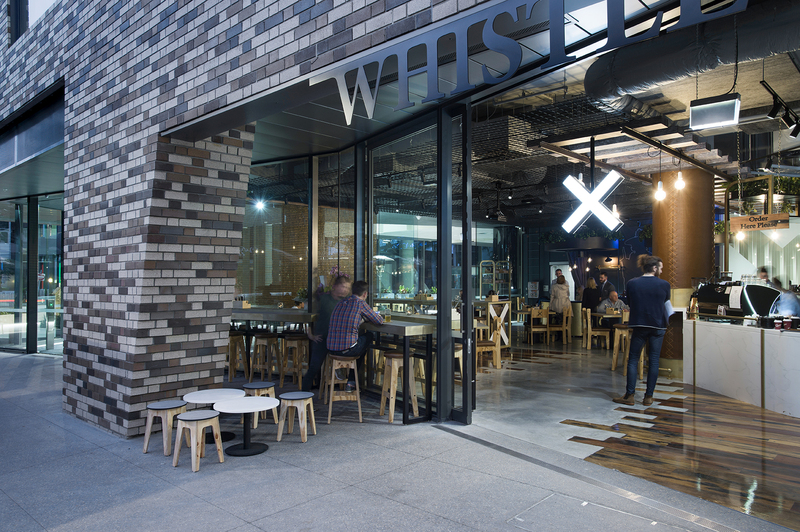 It was extremely important that the venue’s interior design and the Whistle Dixie brand worked seamlessly together. 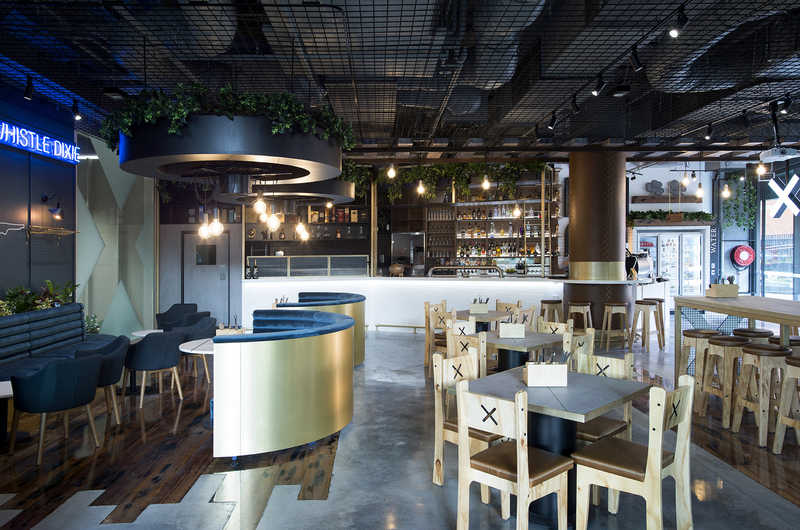 We worked closely with the client to create the logos, graphics, signage & stationery, which has given the restaurant a truly unique identity. 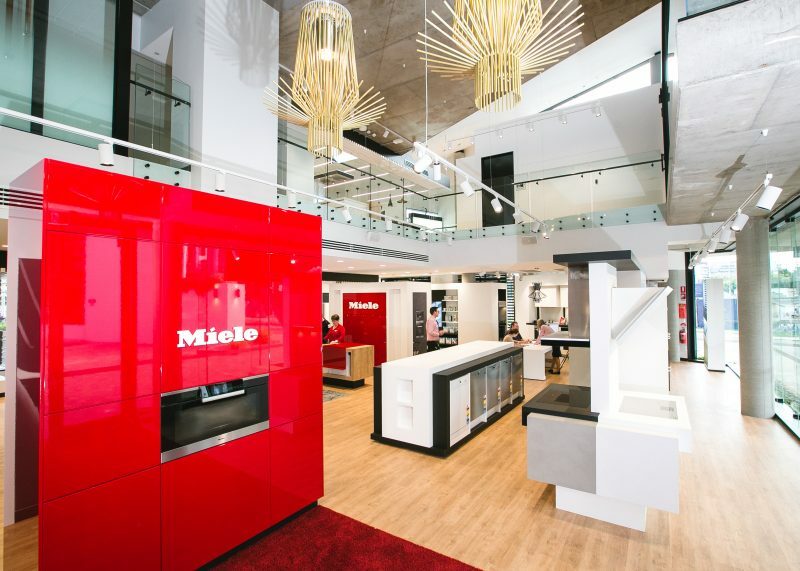 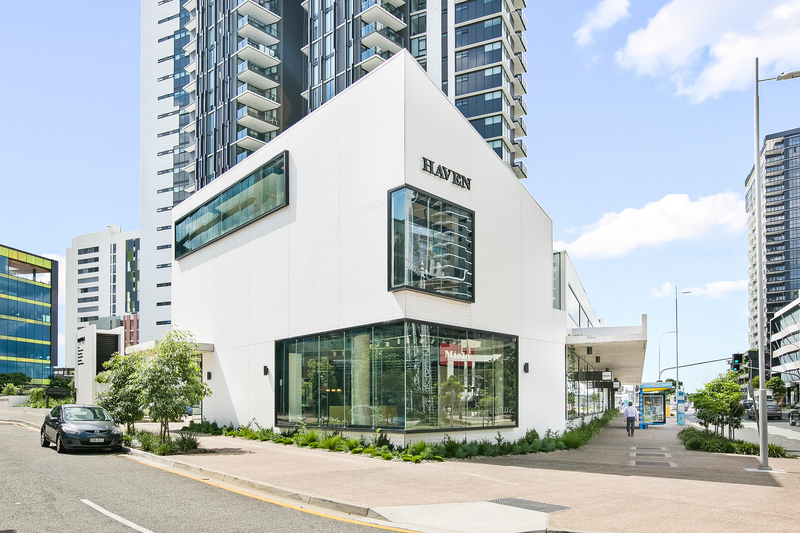 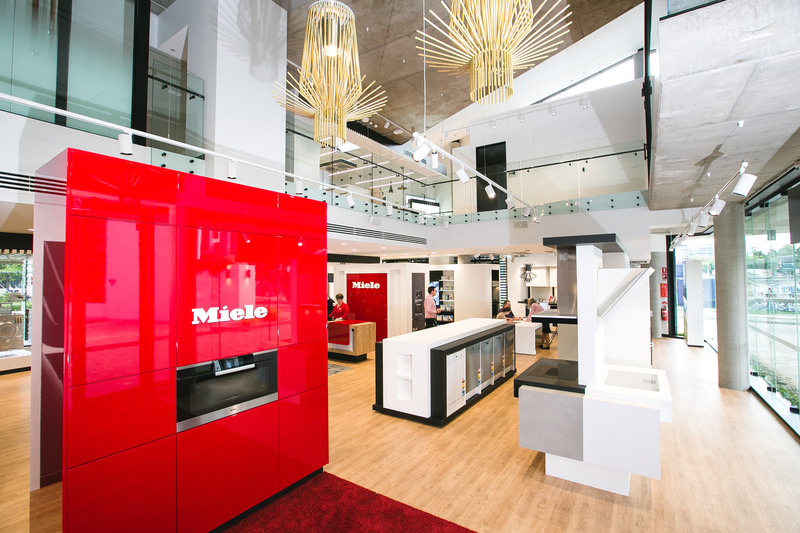 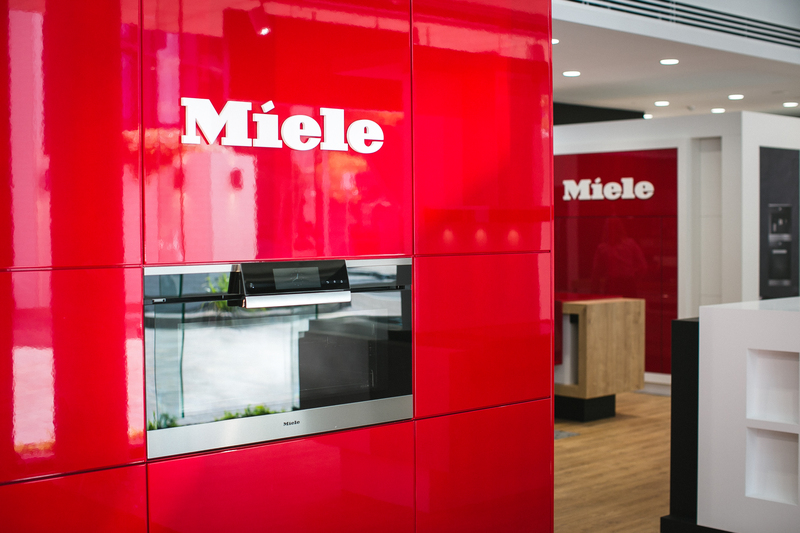 The Miele Experience Centre at Haven is nestled amongst culture and energy of Newstead that extends well into their showroom space. 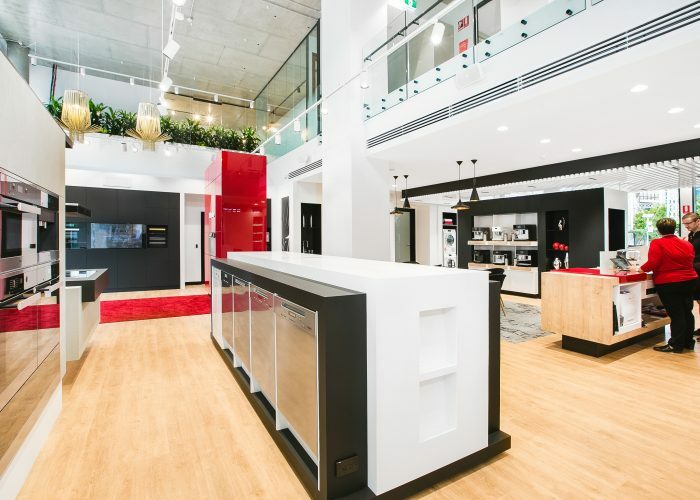 The flagship store set a benchmark for the brand within Australia and as a shopping experience for their many clients. 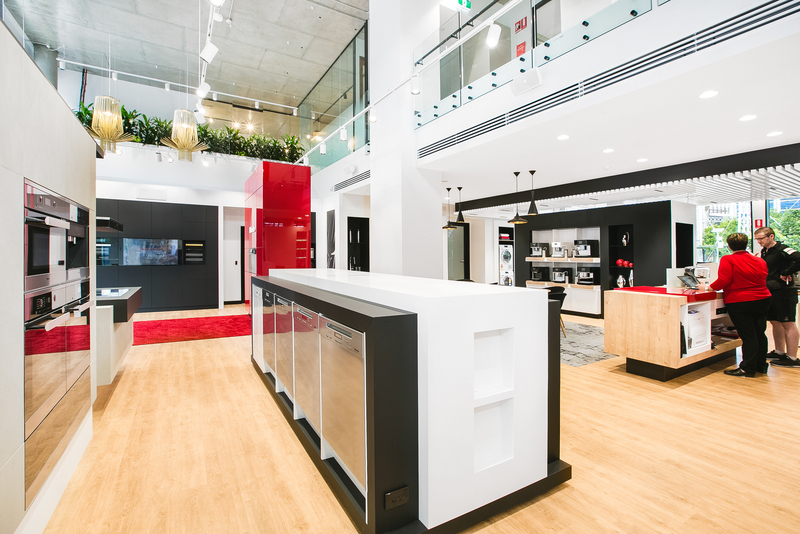 This is the first experience store of its size in Australia which commanded attention from all stakeholders from Australia to Germany. 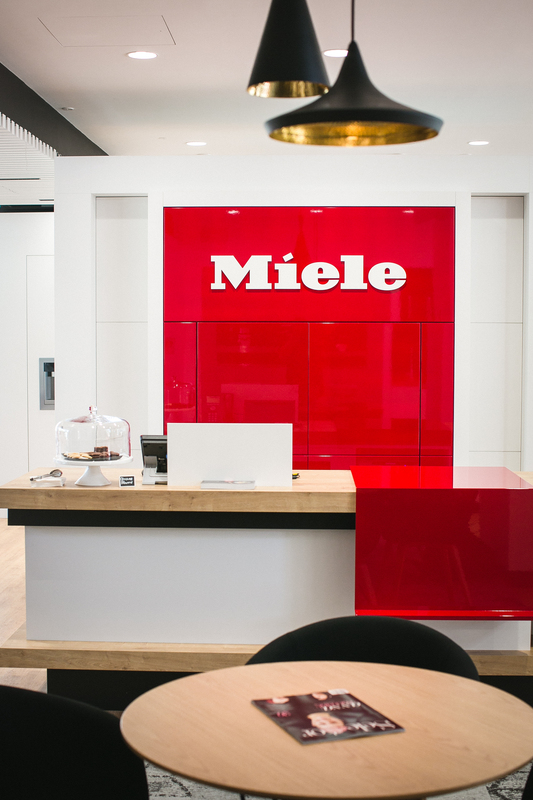 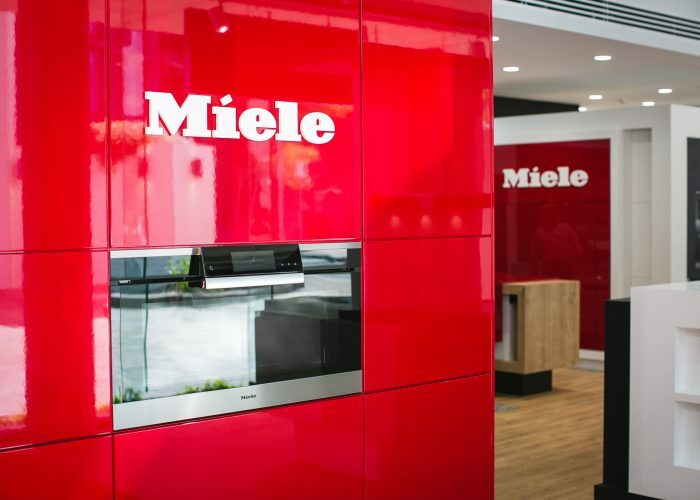 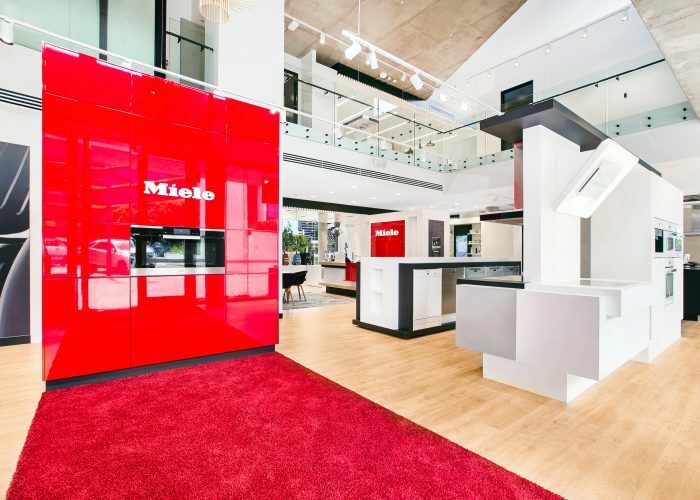 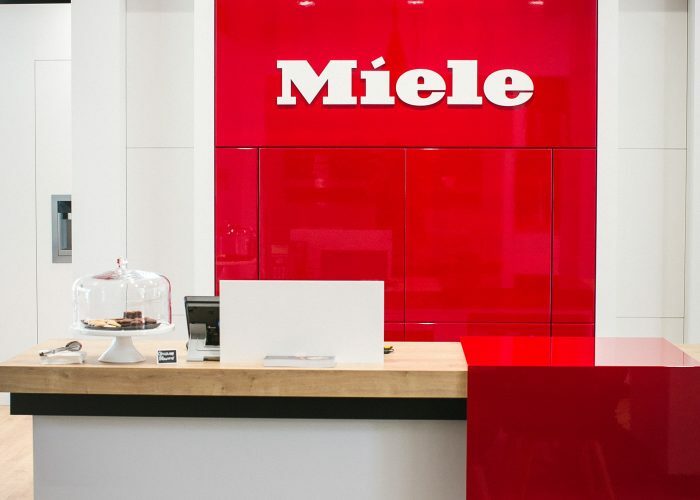 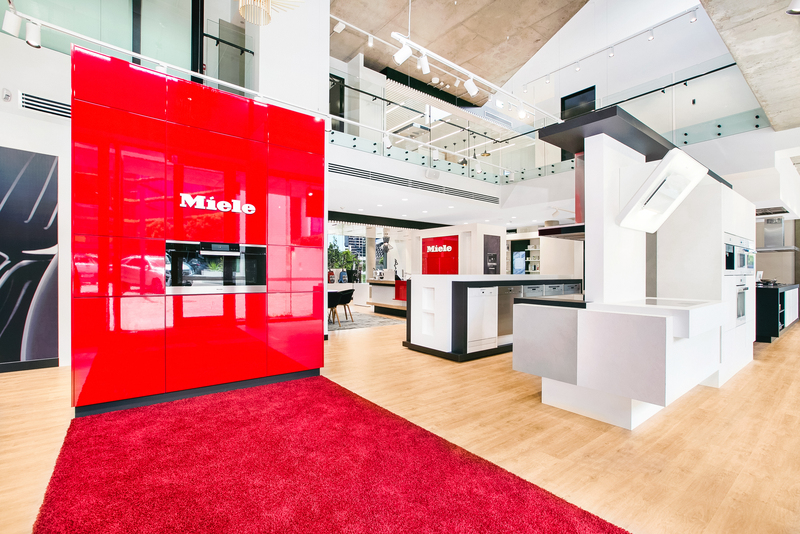 Miele wanted to envelope their brand in an interior space that complimented the fabric of the building and this is where Ellivo came in. 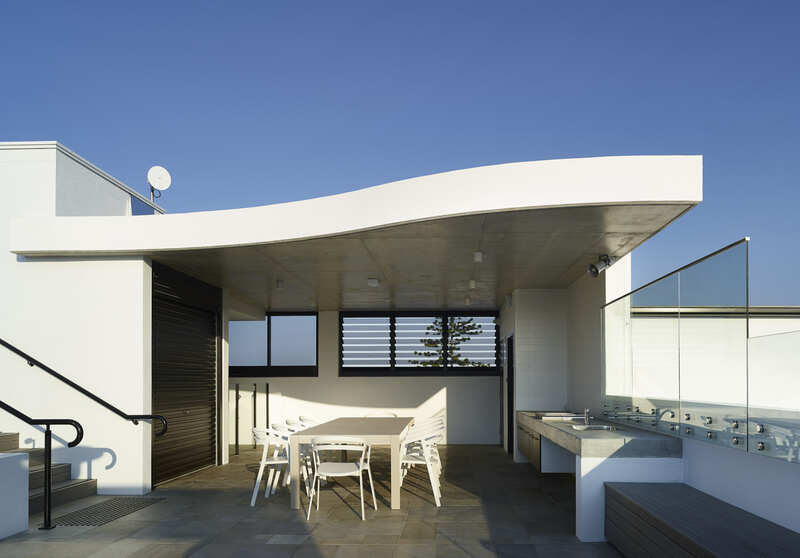 The existing shell was challenging and exciting and made for a complex design. 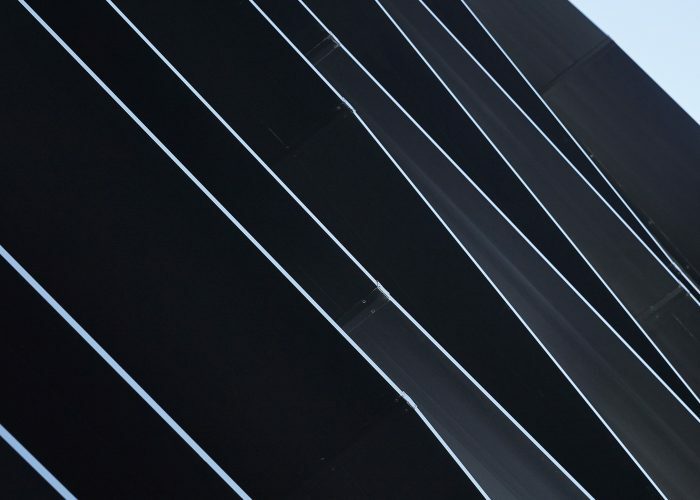 With such a refined brand and strong graphics we decided to use the angles, voids and existing concrete fabric to act as the stage for the experiences. 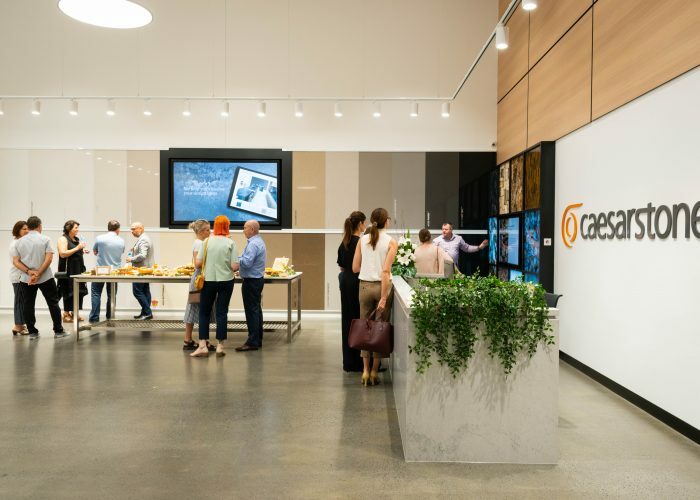 The customer journey was carefully planned out amongst the architectural elements to create a space that can adapt with product developments into the future. 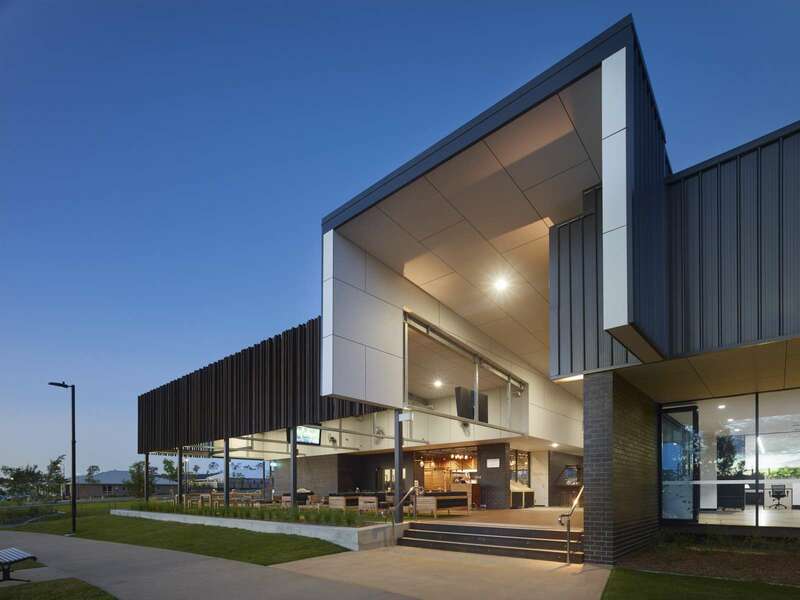 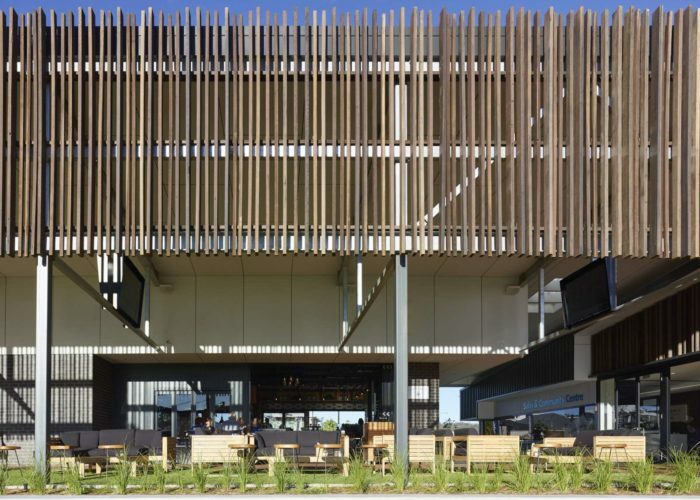 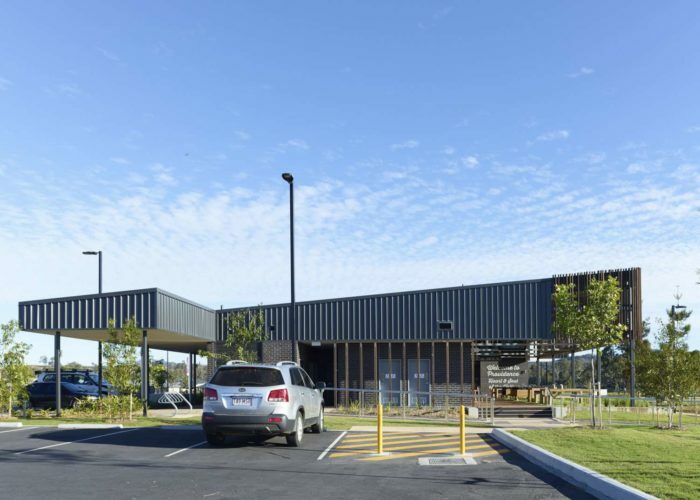 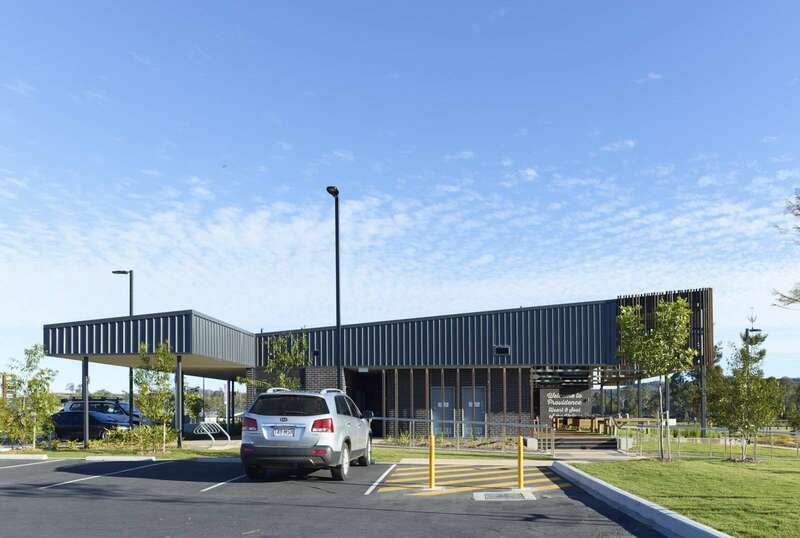 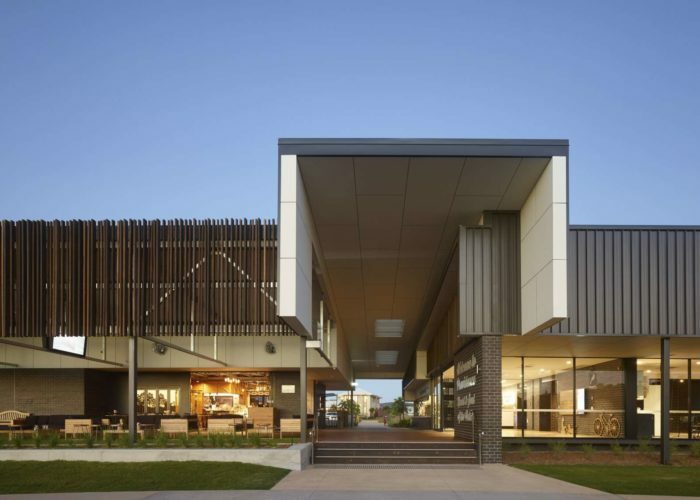 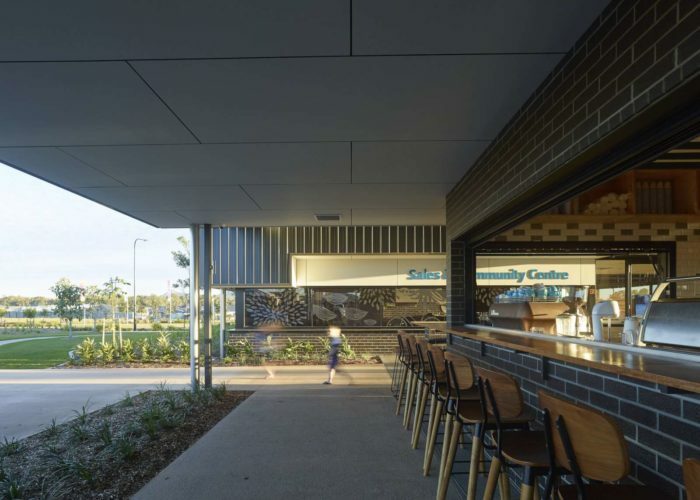 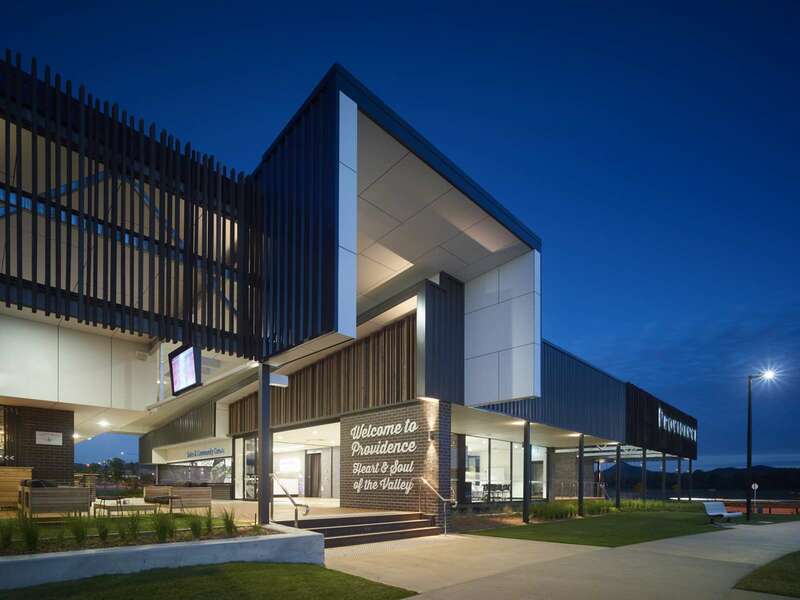 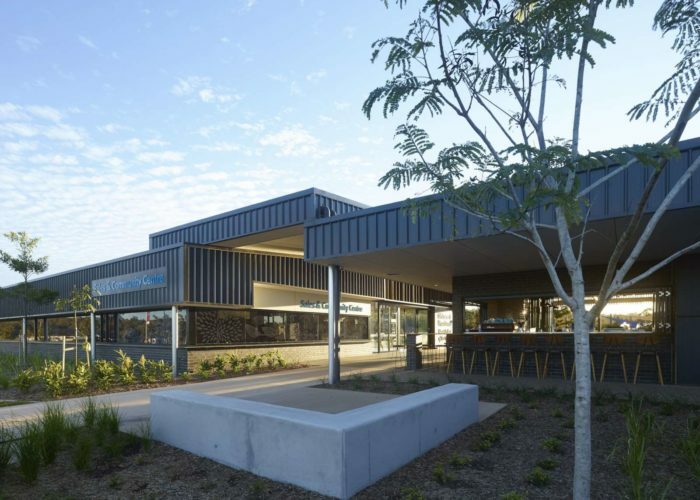 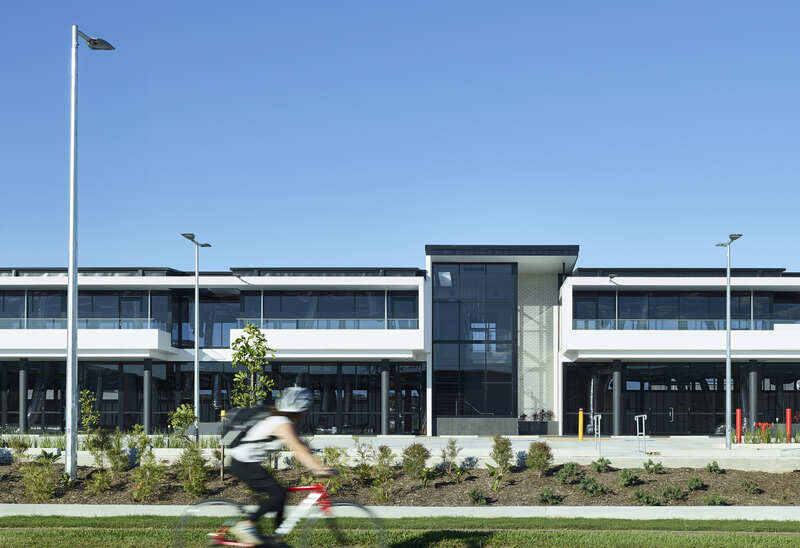 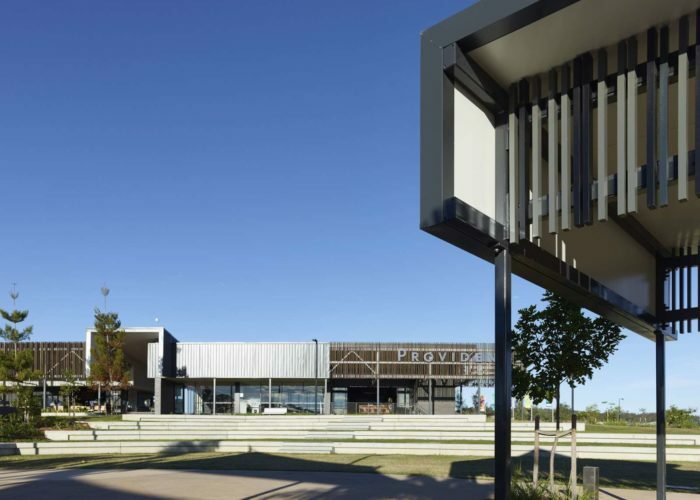 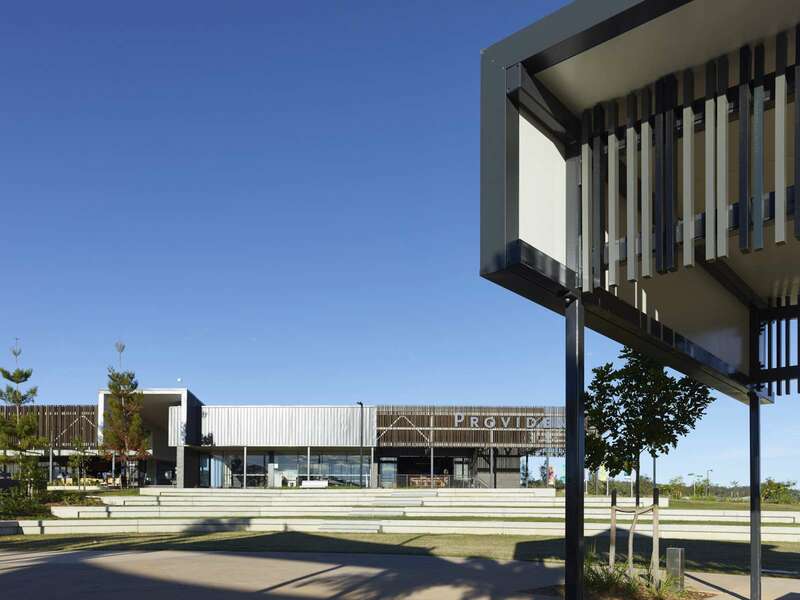 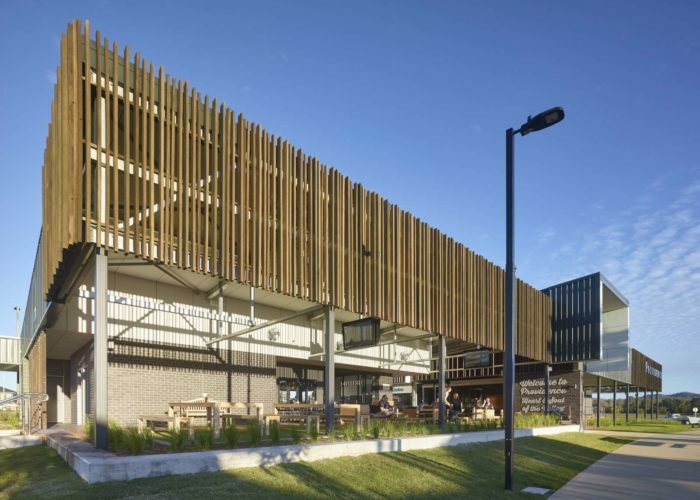 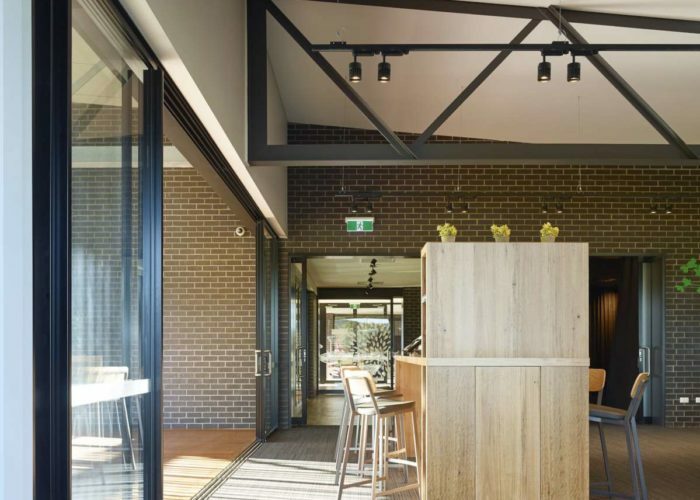 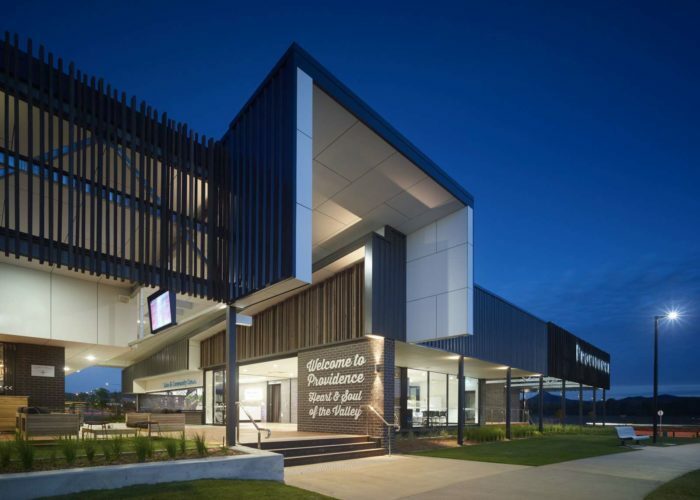 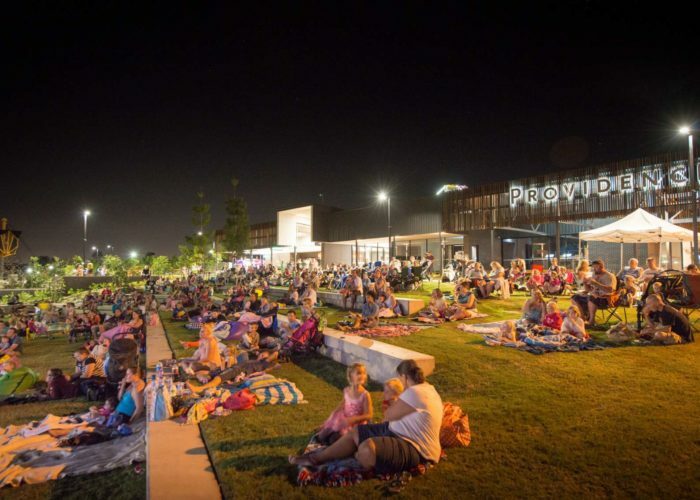 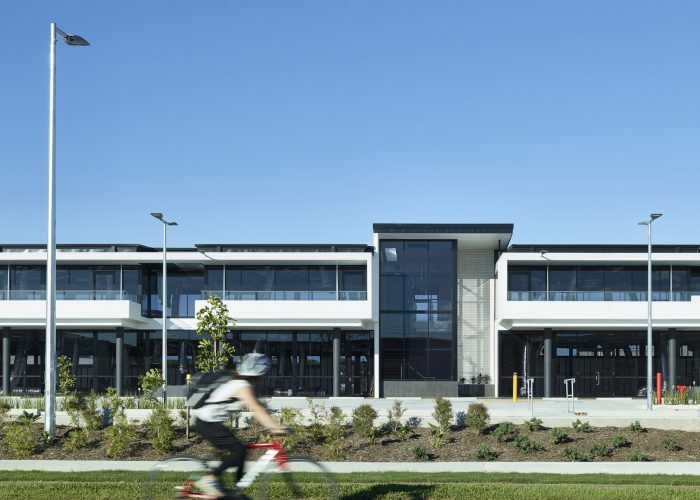 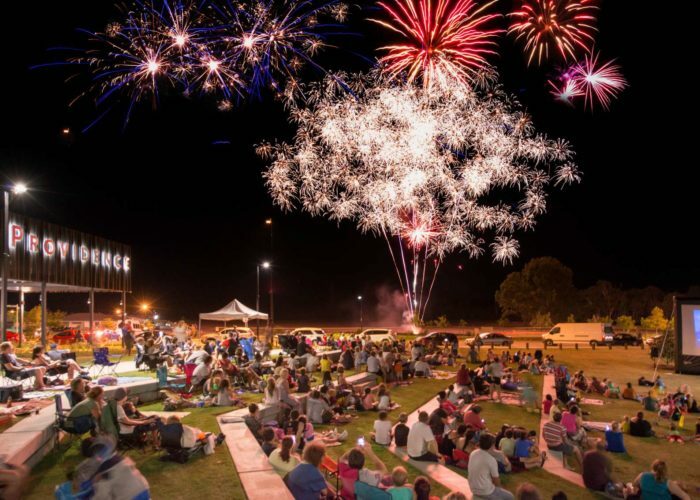 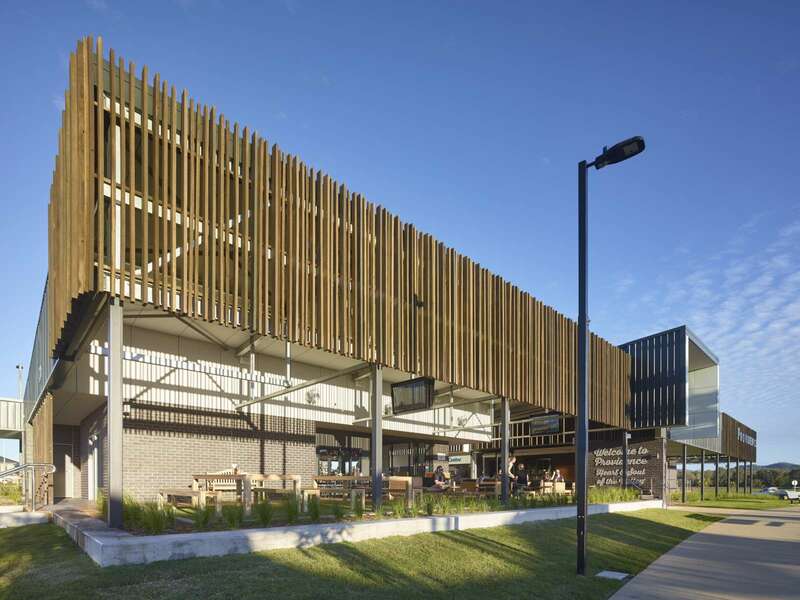 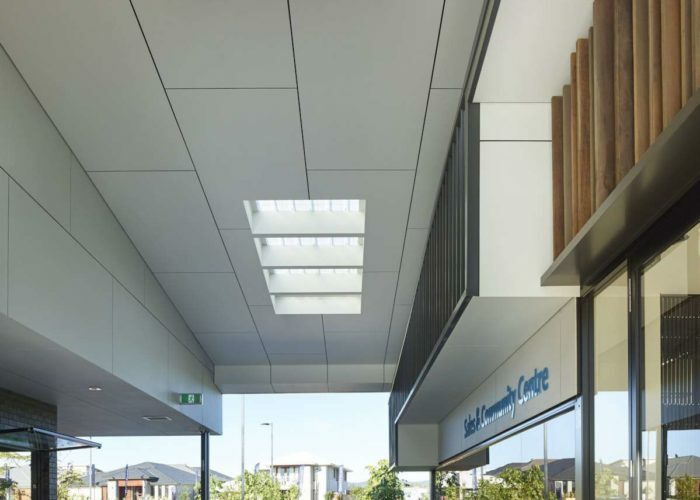 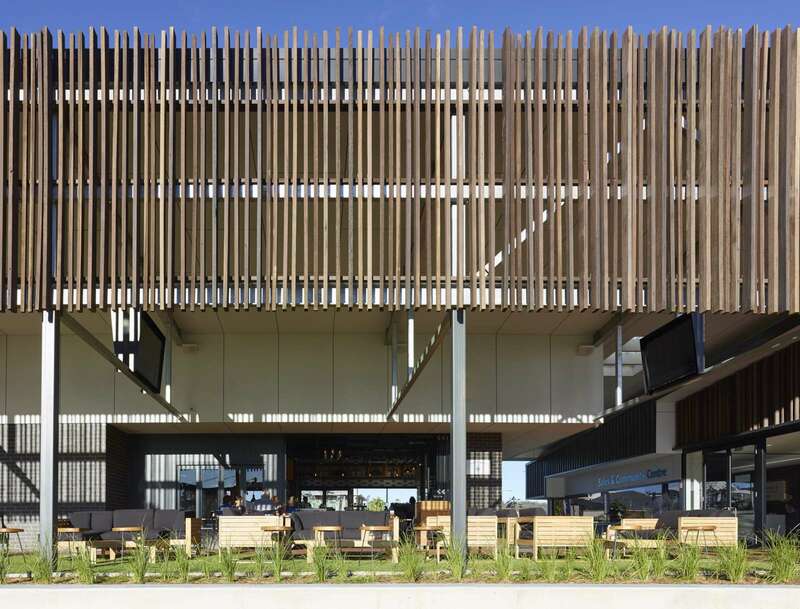 The Centre embodies the values of a vibrant new neighbourhood precinct located in the Ripley Valley and serves as a welcoming gateway, reflecting true community living while holding a strong connection to the landscape in which it is sited. 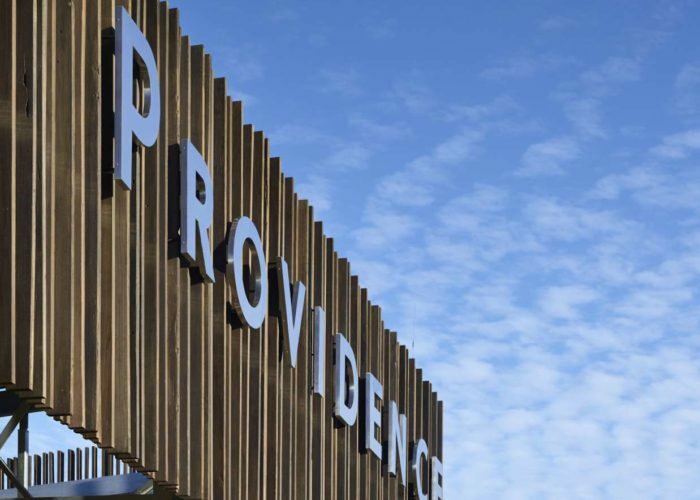 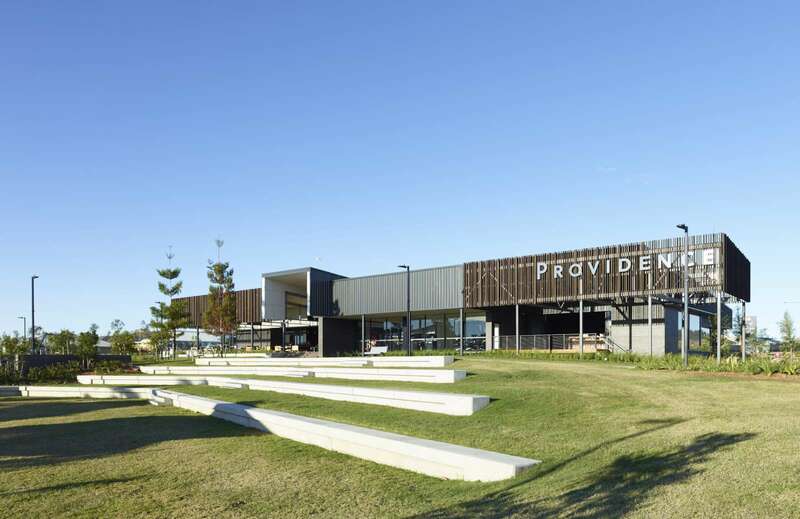 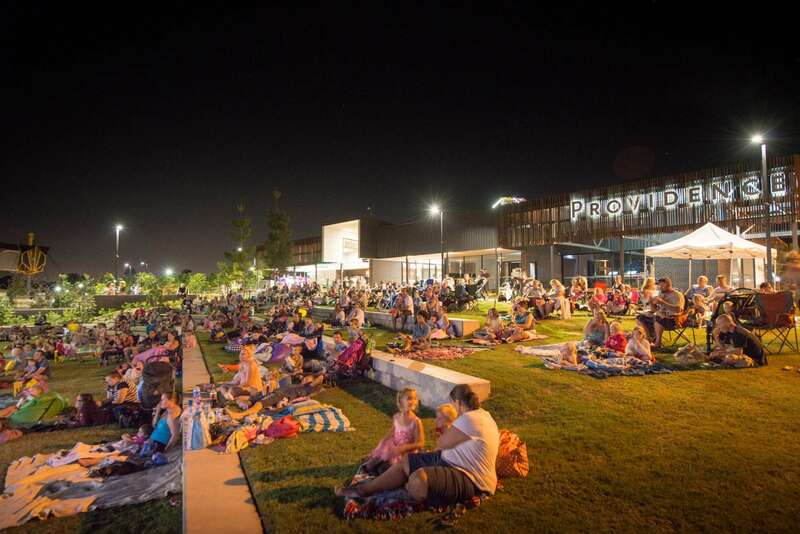 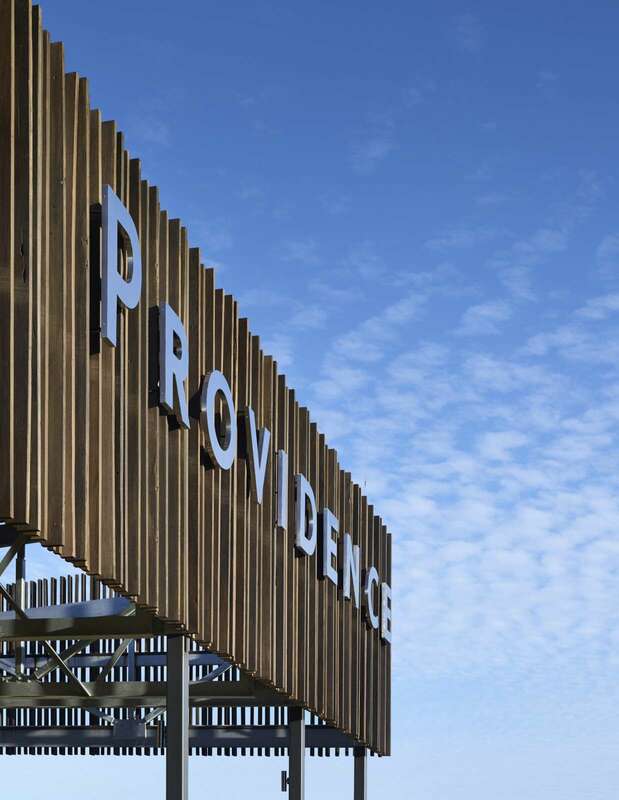 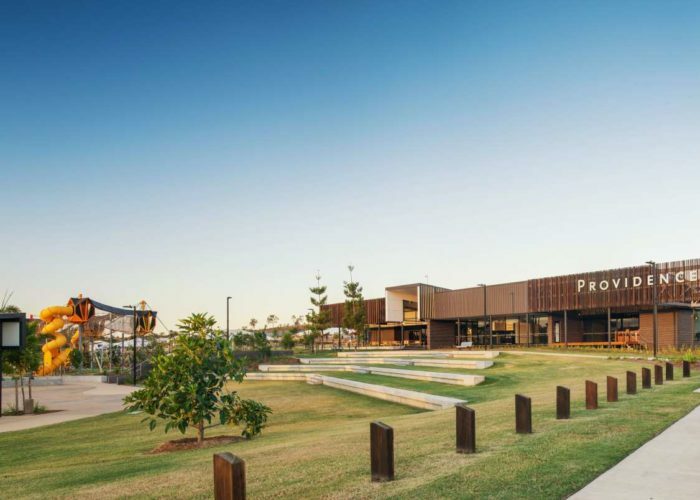 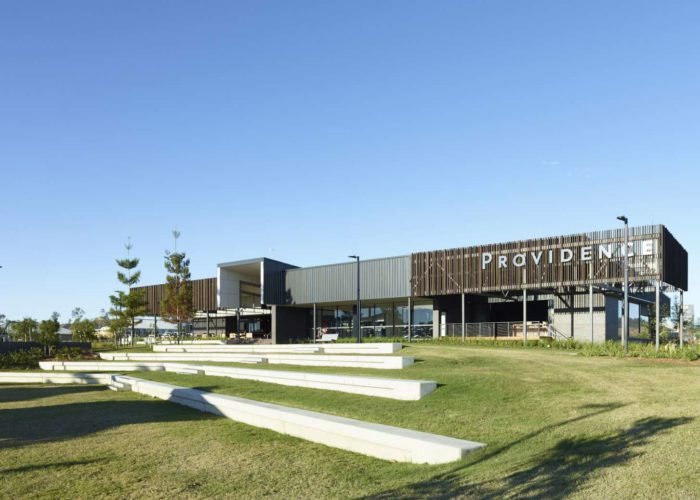 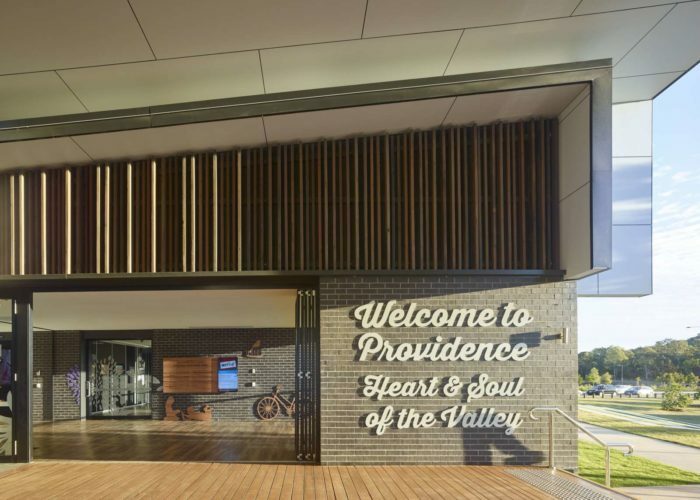 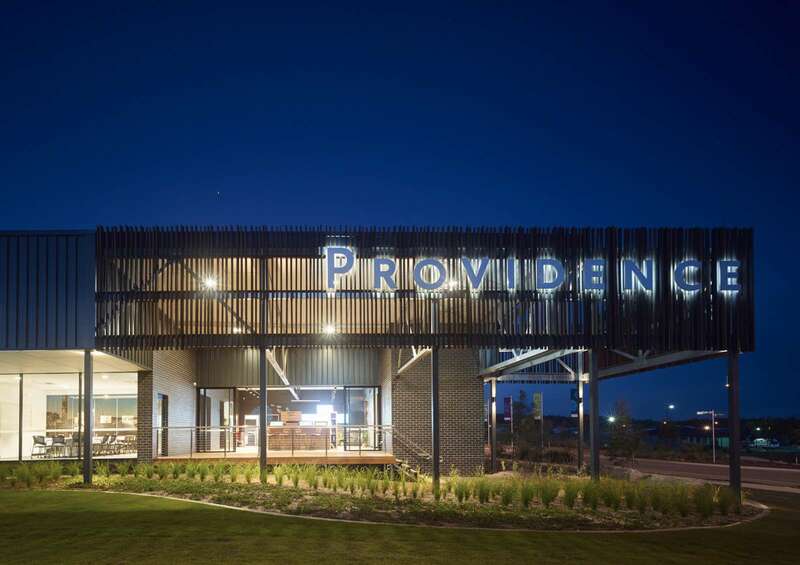 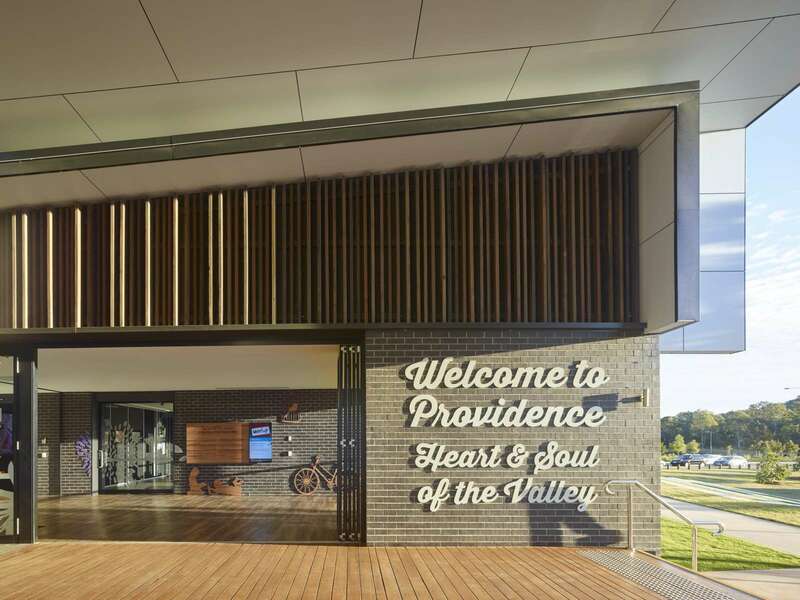 The Providence Sales and Community Centre embodies the values of a vibrant new neighbourhood precinct located in the Ripley Valley. The Centre serves as a welcoming gateway, reflecting true community living while holding a strong connection to the landscape in which it is sited. 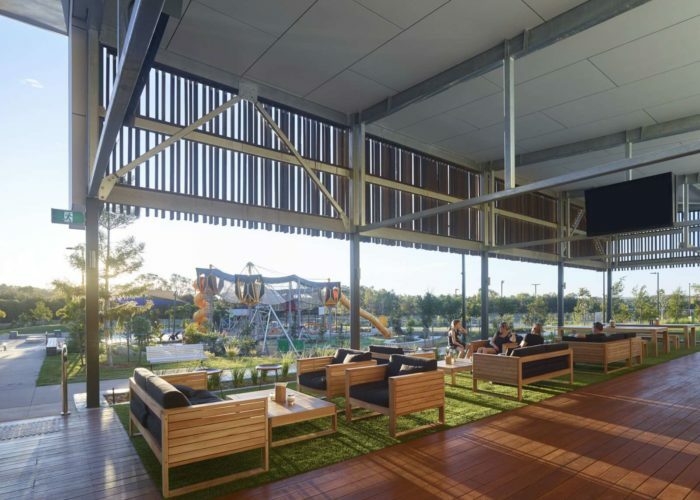 Situated amongst vegetated nature reserves, the design seeks to connect and blur boundaries between the inside and outside, unlocking views across the adventure playground and mountain ranges beyond and balancing the requirement of an open accessible ‘pavilion’, while engaging with the landscape. The design is accessible, welcoming and familiar and enhances the existing features of the site for all visitors to share and enjoy.